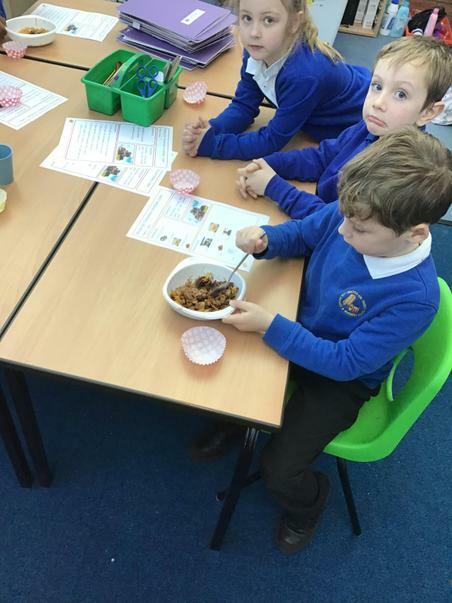 We are Squirrel class. 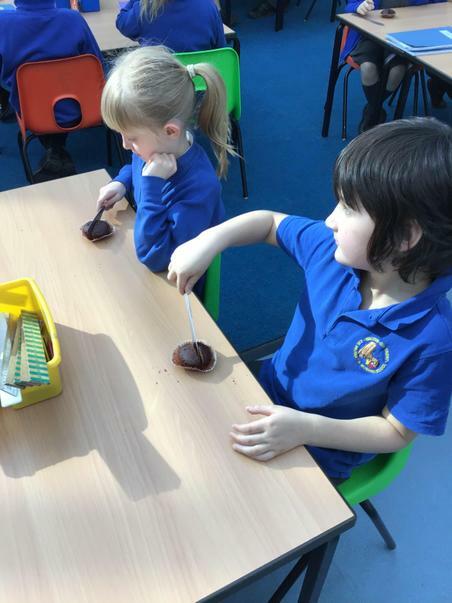 We are Year 1 and 2. 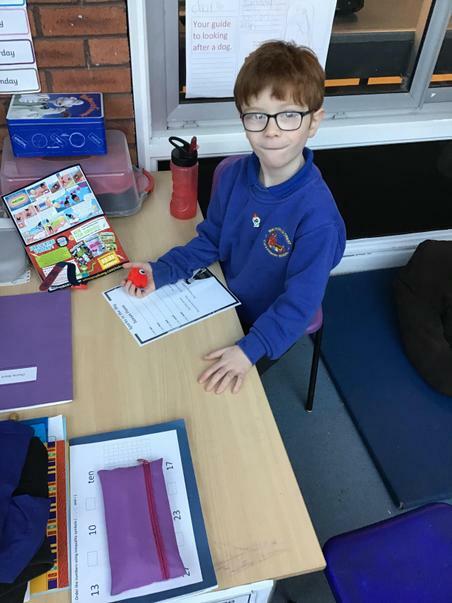 Our teacher is Mrs Irvine. 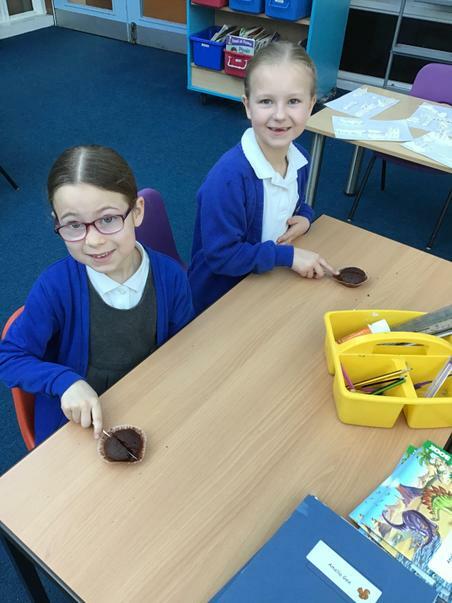 We are supported by Mrs Wheatley and Miss Buckley our School Direct Student Teacher. 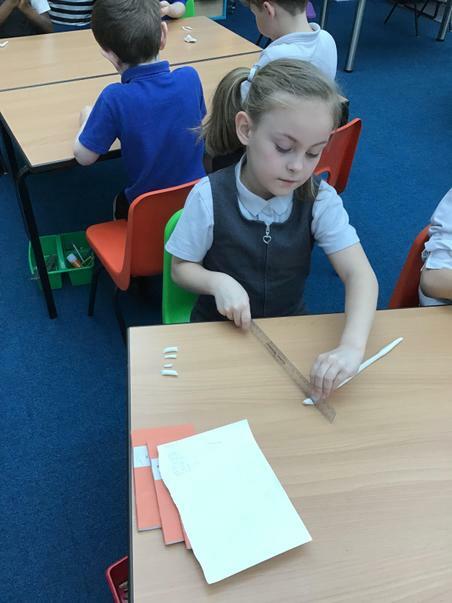 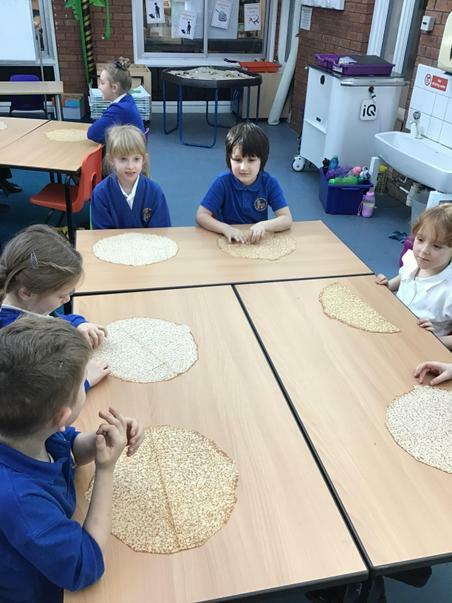 We have been learning about fractions in Maths. 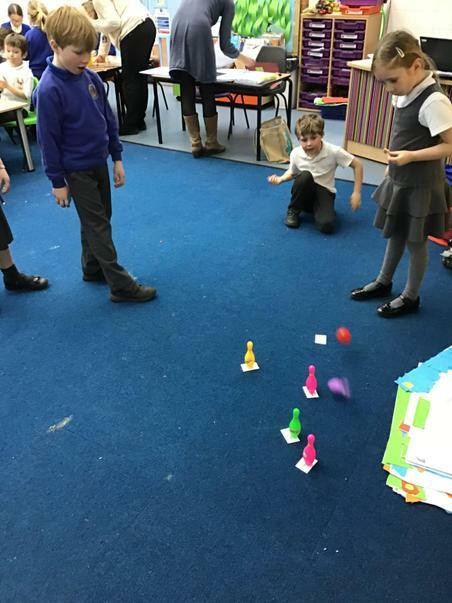 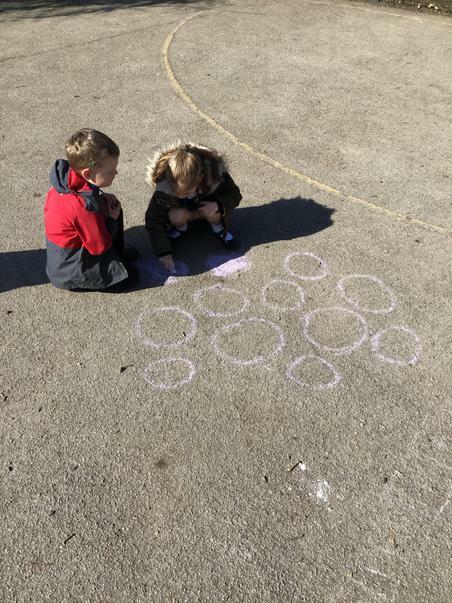 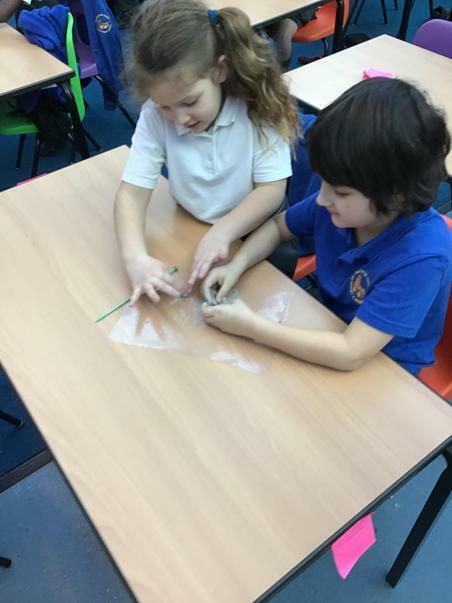 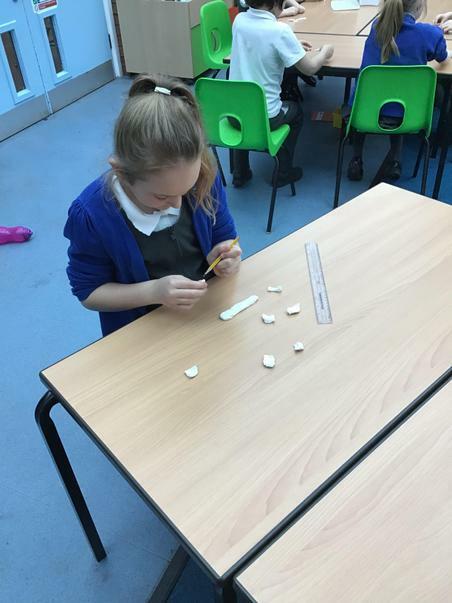 Year 2 have learnt about 1/2, 1/4, 1/3's and Year 1 have learnt about 1/2 and 1/4 of shapes, objects and numbers. 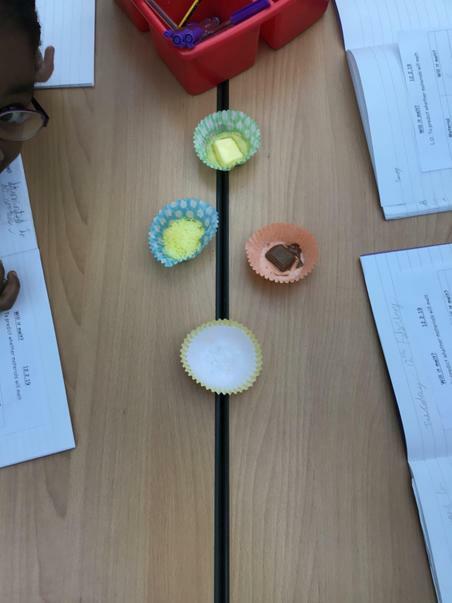 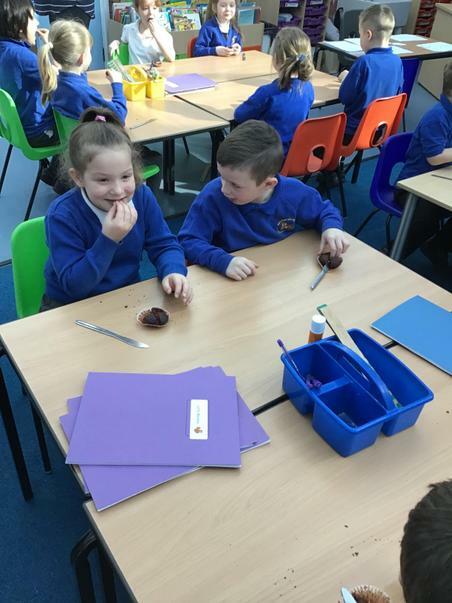 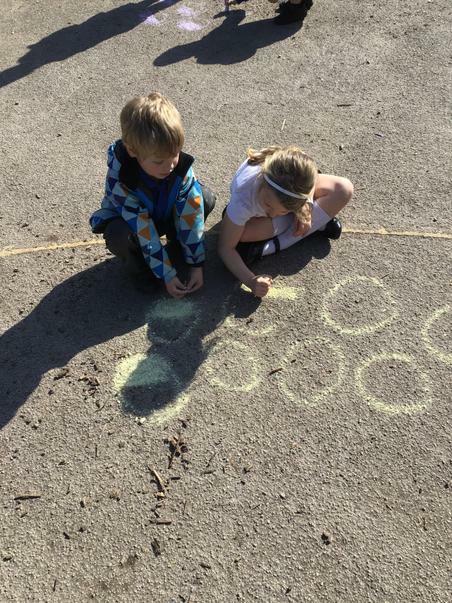 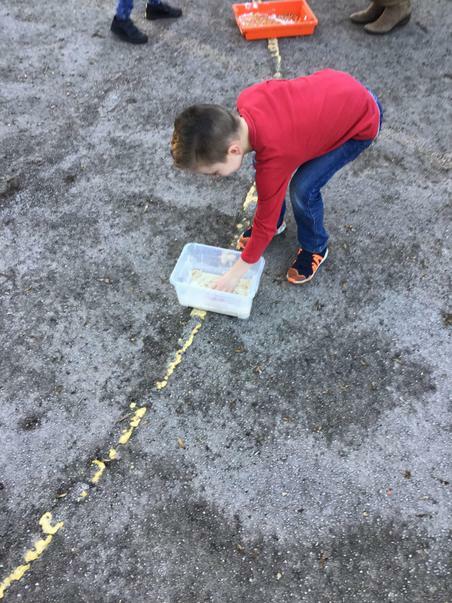 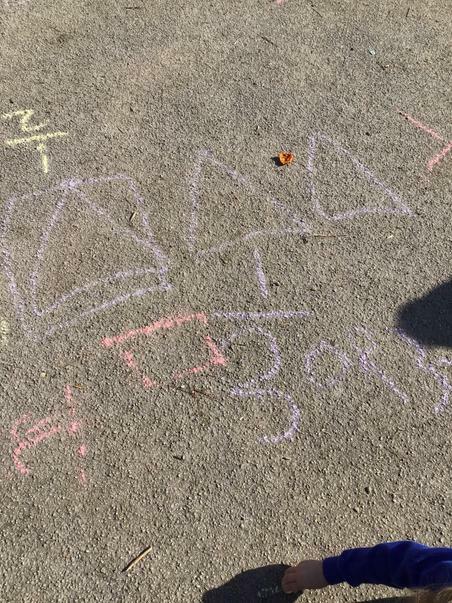 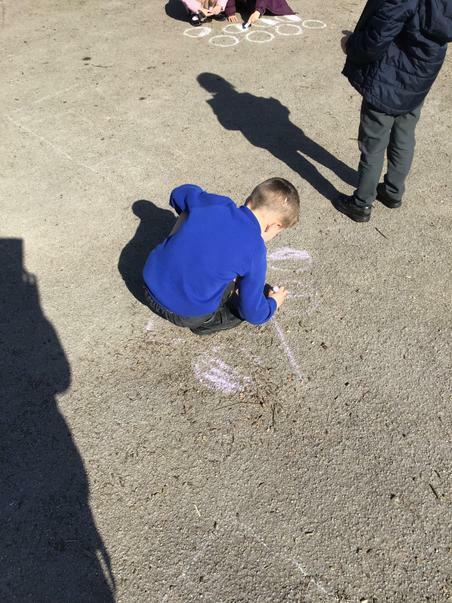 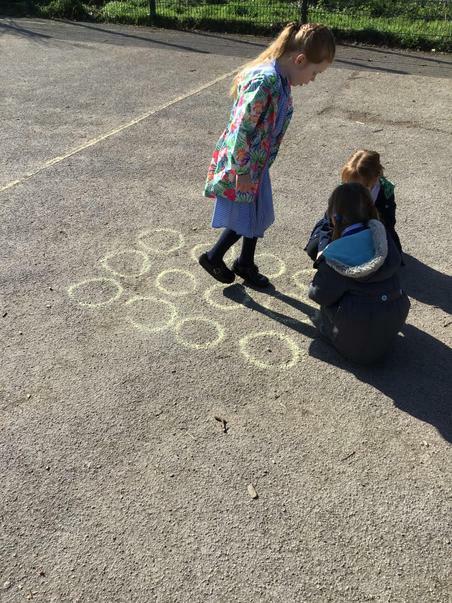 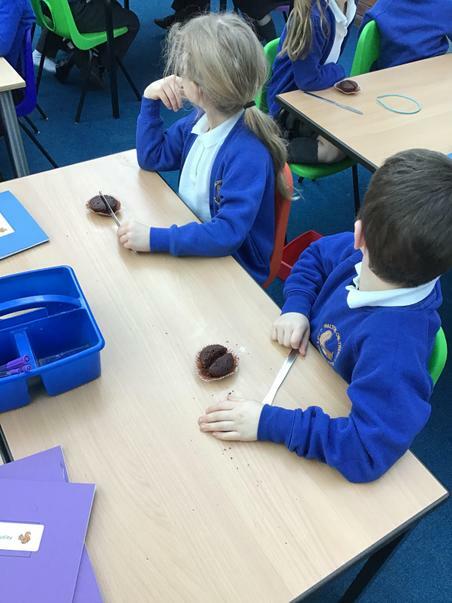 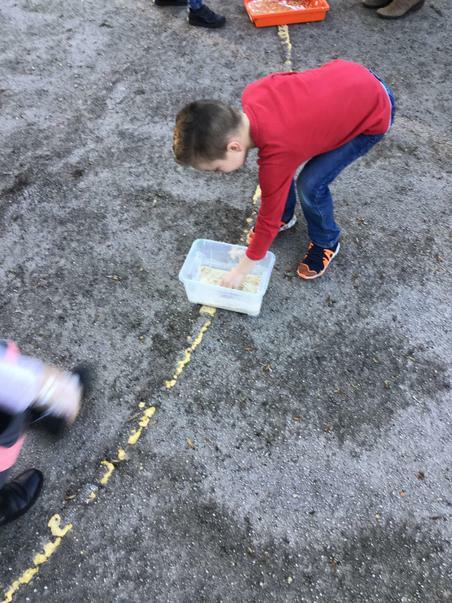 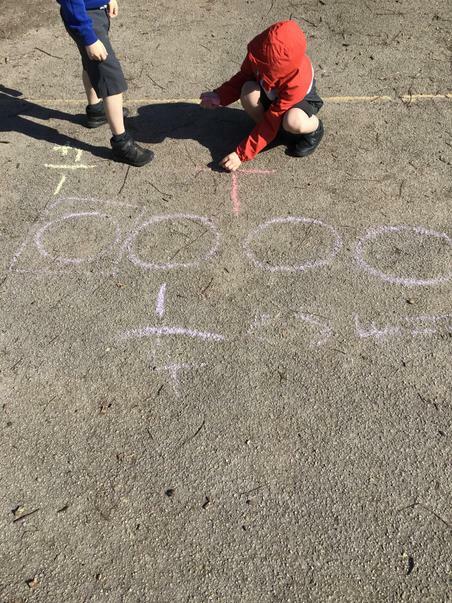 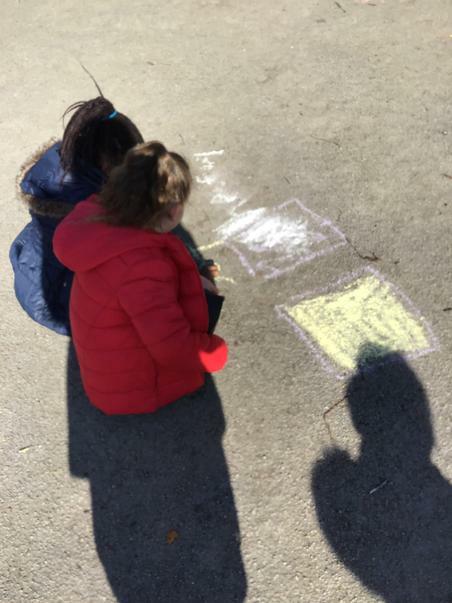 We have used cakes (and then eaten them) and have done practical fraction work outside. 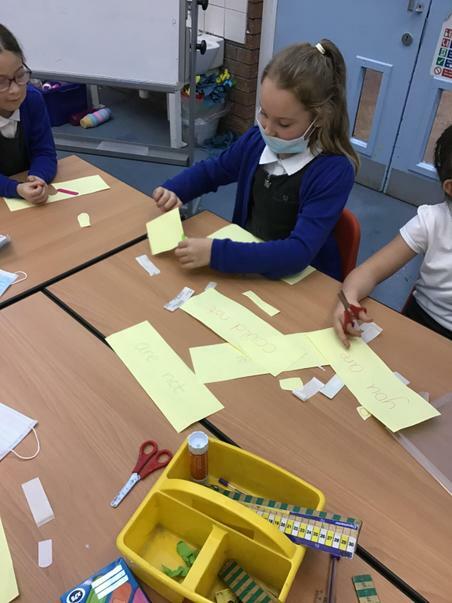 Who knew fractions could be so fun? 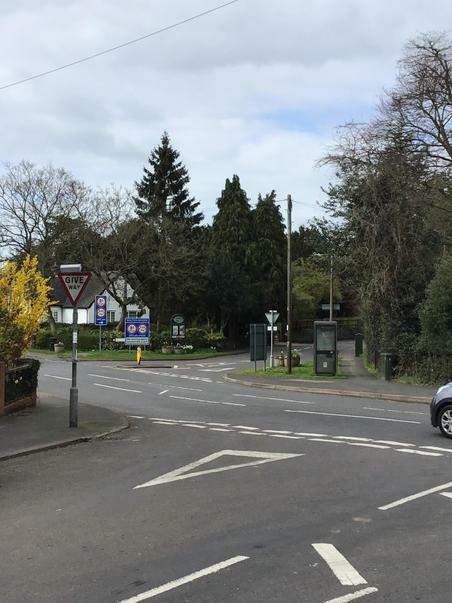 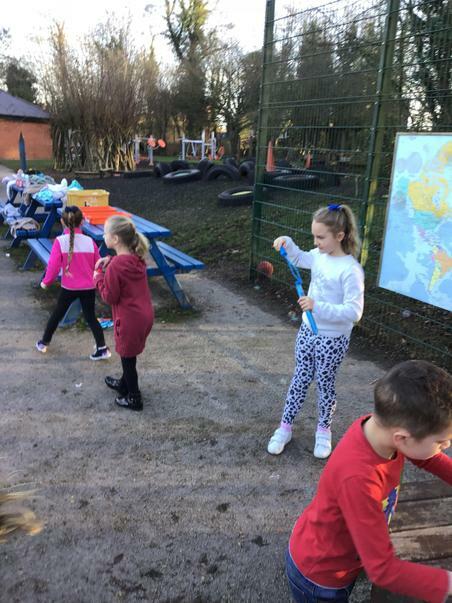 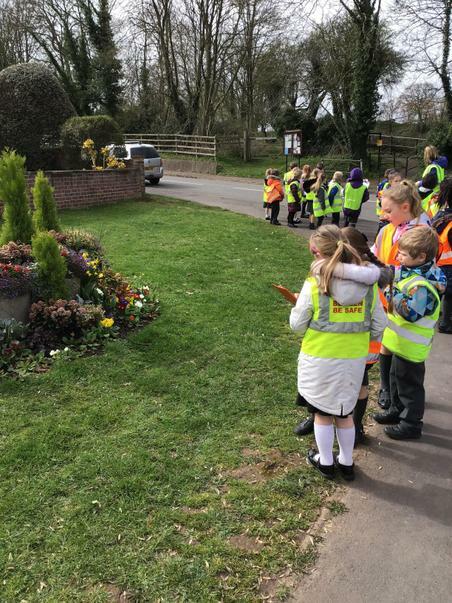 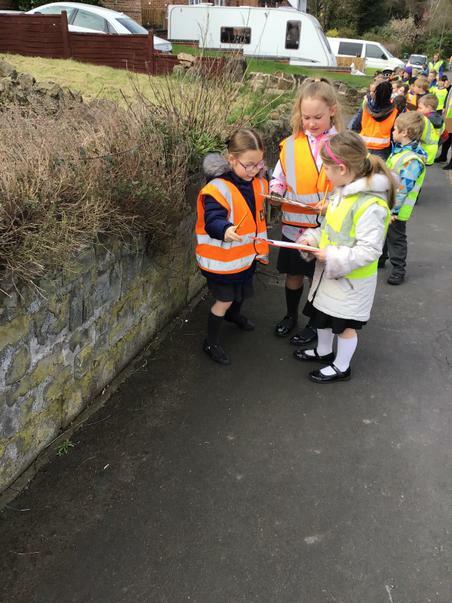 We went on a walk around Walton Village to see which plants and trees we could find that would have been around when the dinosaurs were alive. 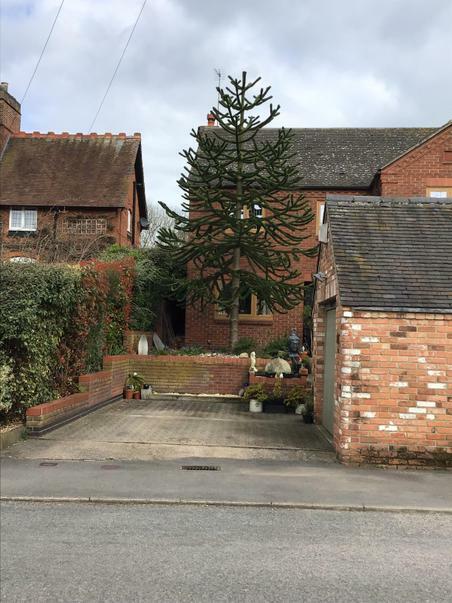 We found lots of conifer trees and bushes, a few yew trees and a huge monkey puzzle tree. 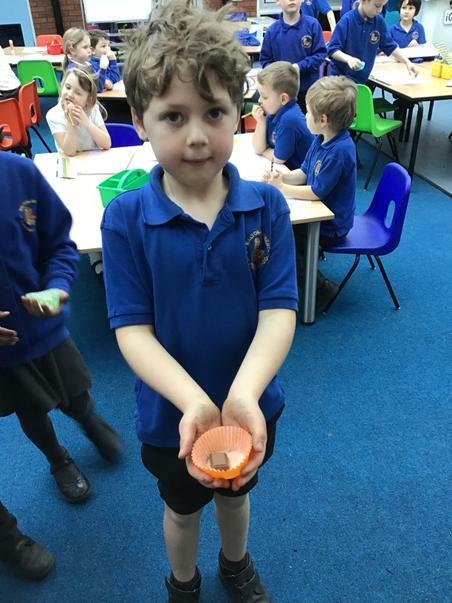 We didn't find any ferns on our walk but Rohan from our class brought in some leaves from a fern tree from his garden. 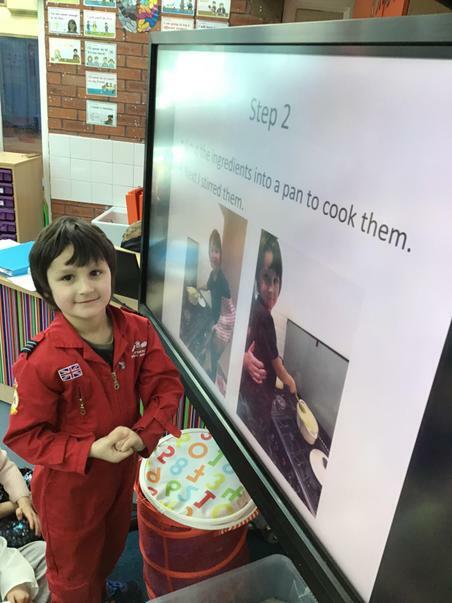 Thank you Rohan! 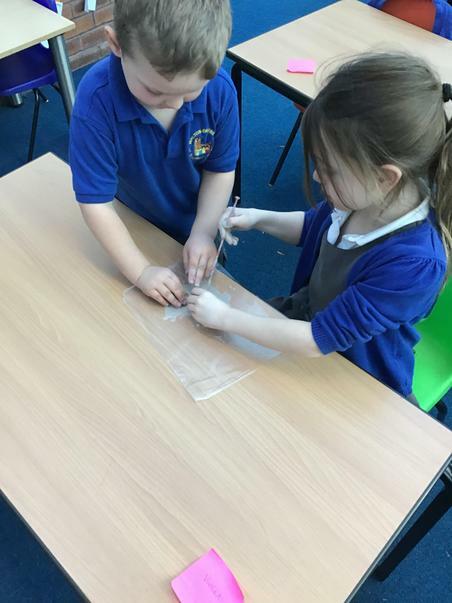 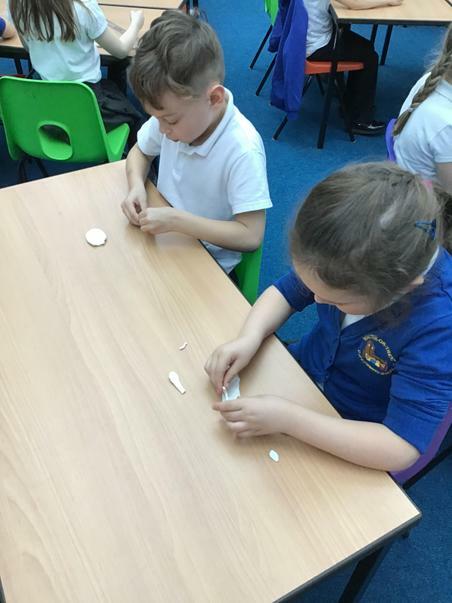 We loved learning about dinosaur teeth. 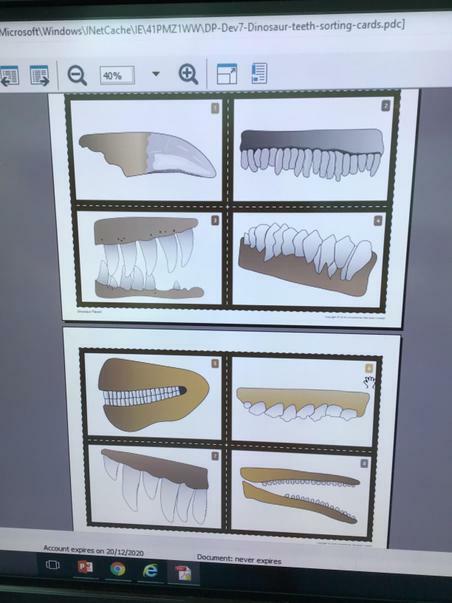 We looked in detail at different dinosaur teeth and we compared teeth from a herbivore and a carnivore. 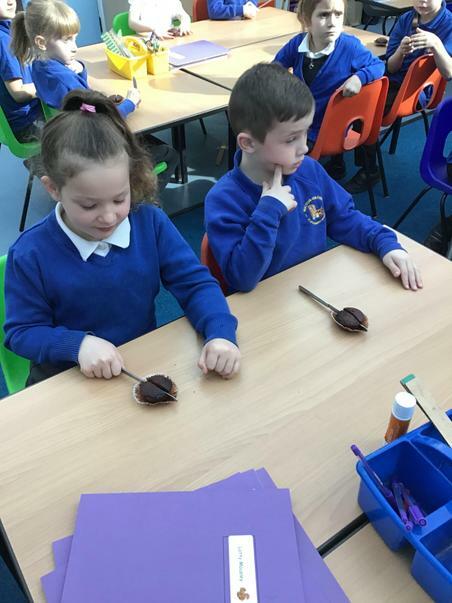 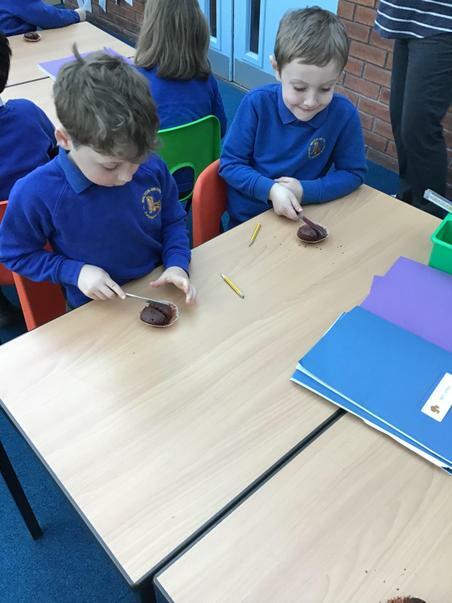 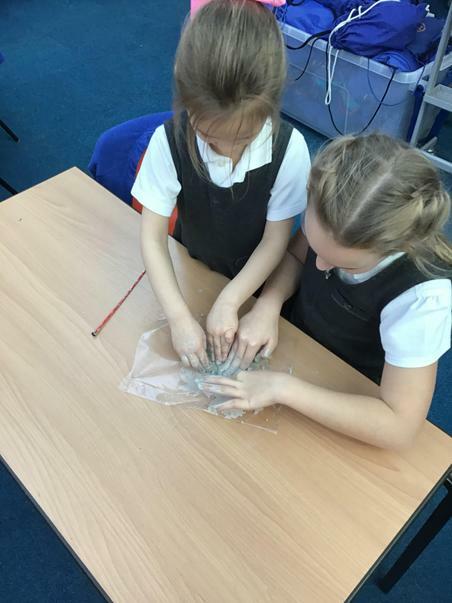 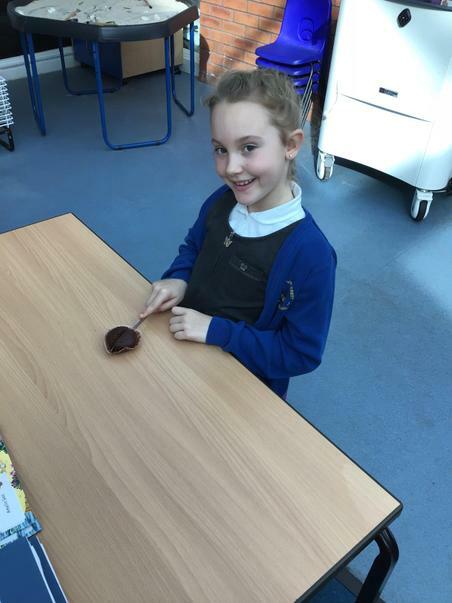 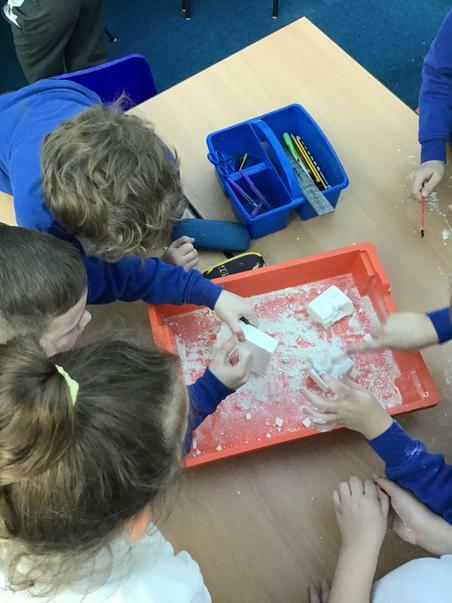 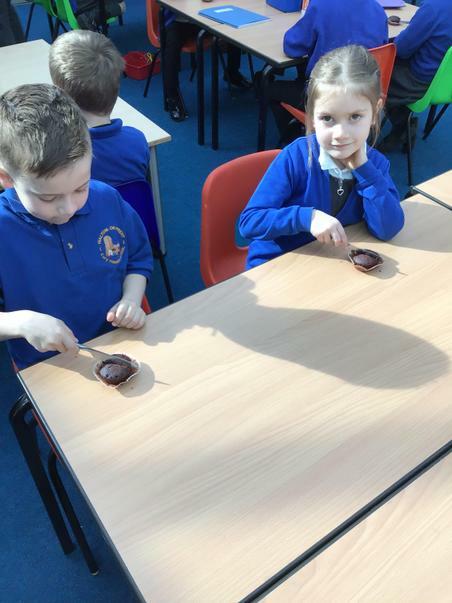 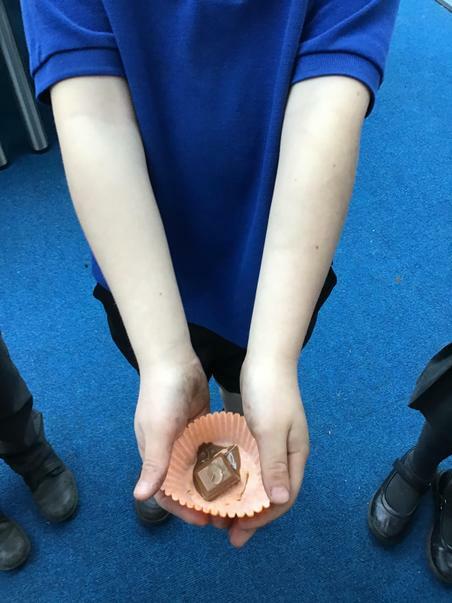 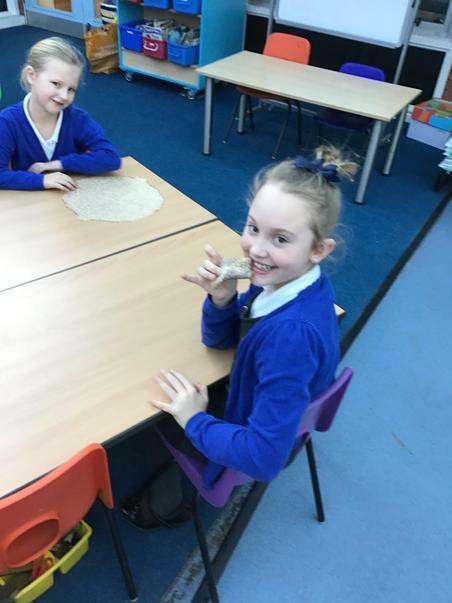 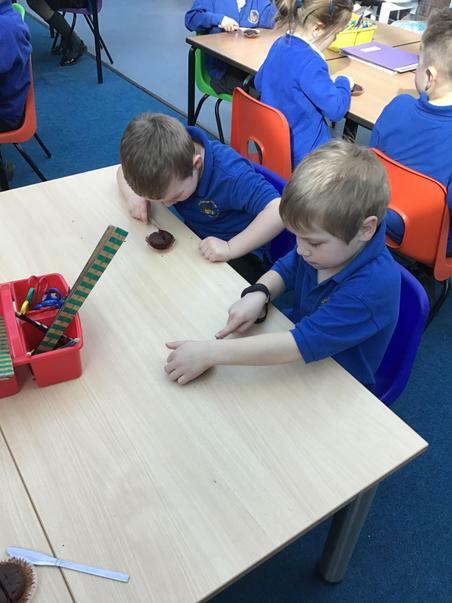 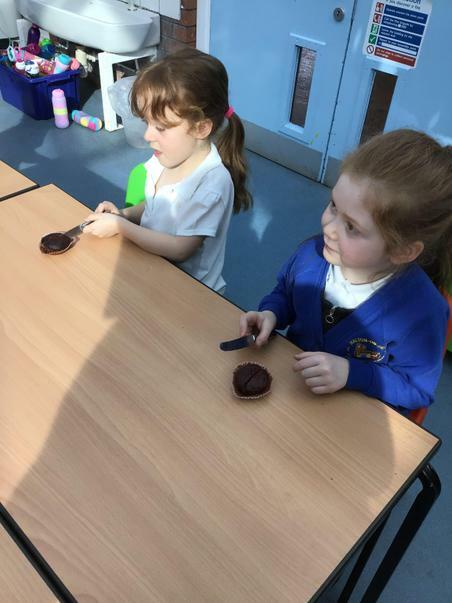 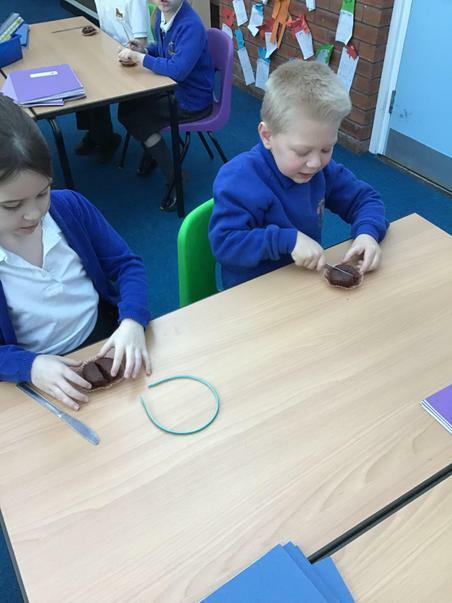 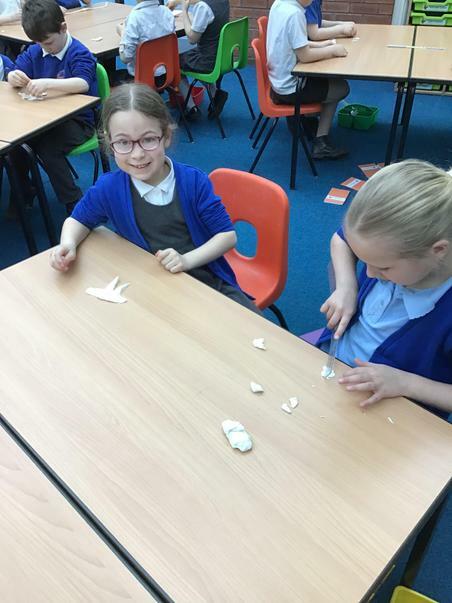 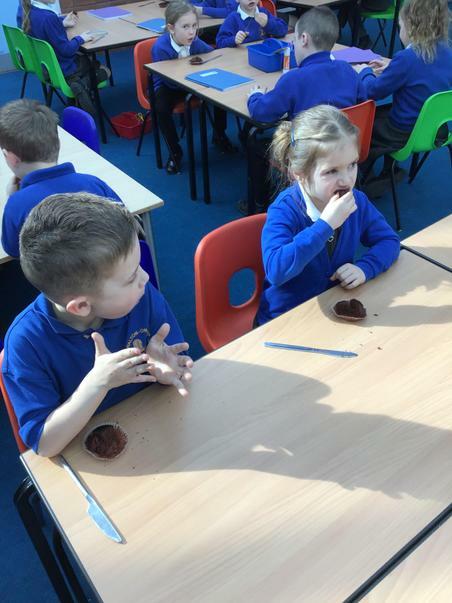 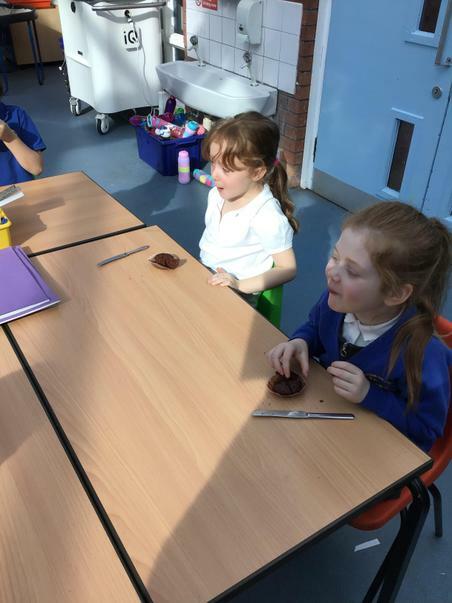 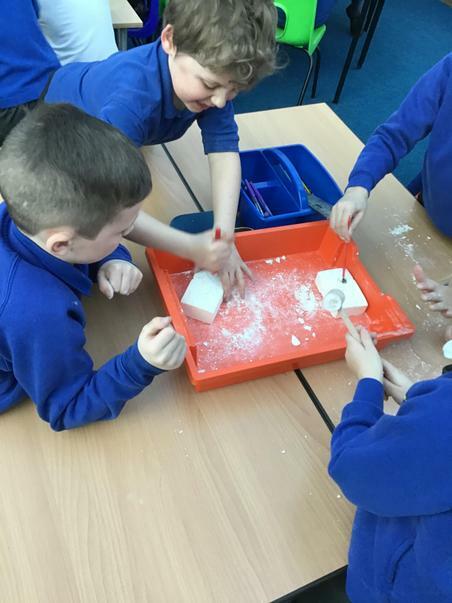 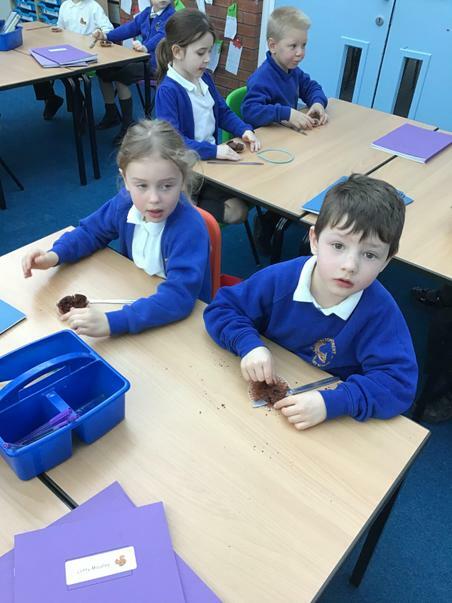 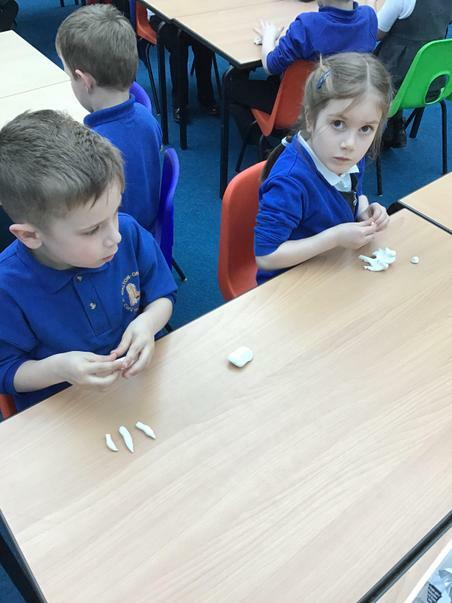 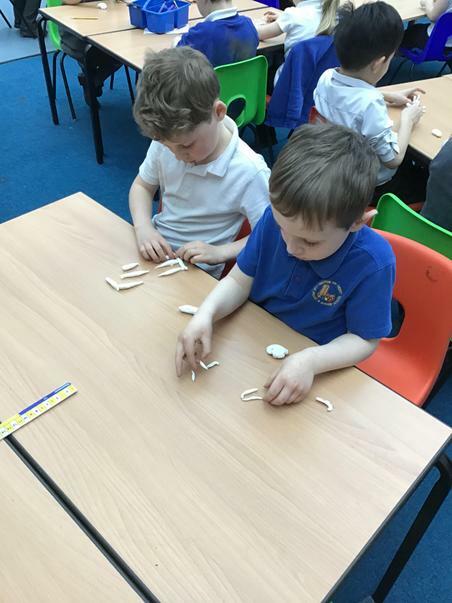 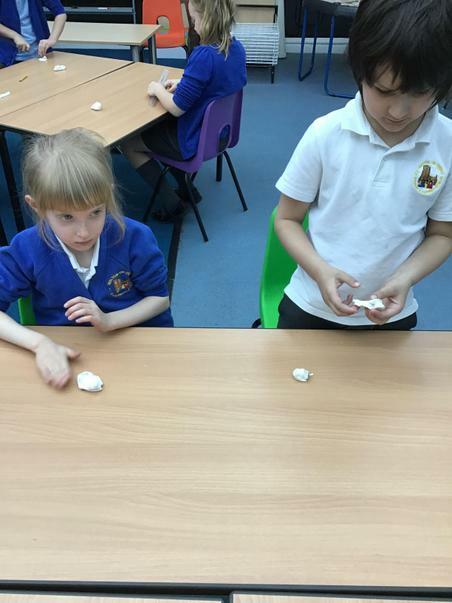 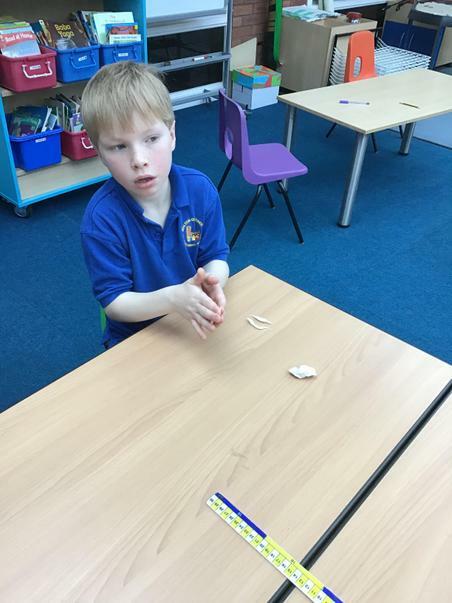 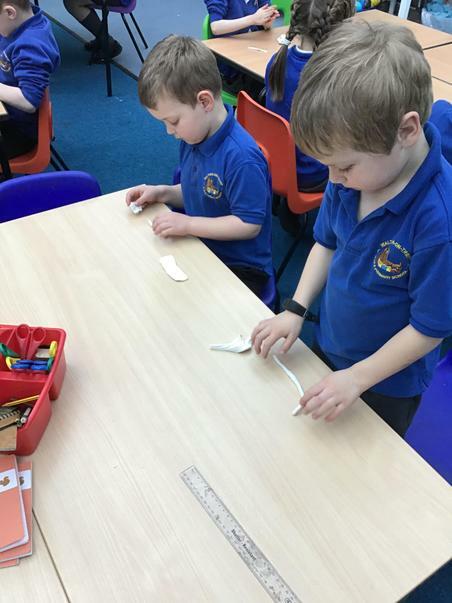 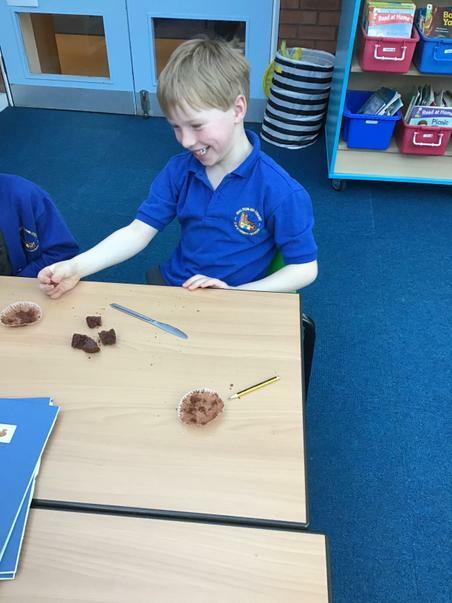 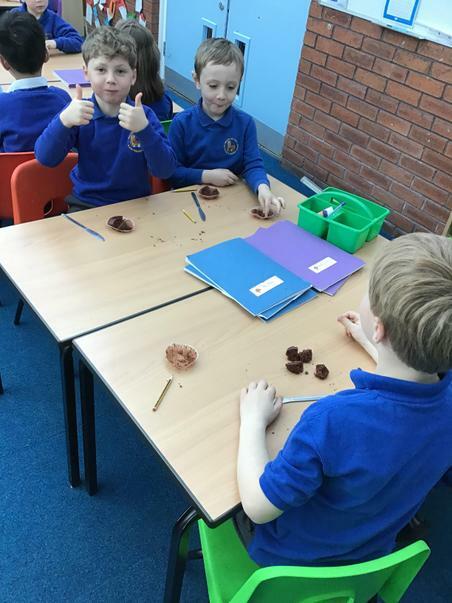 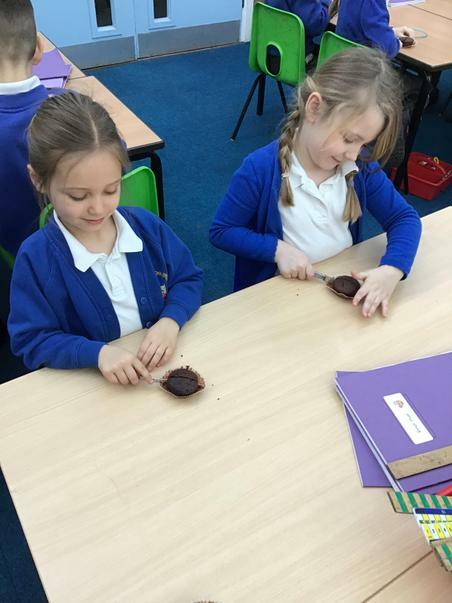 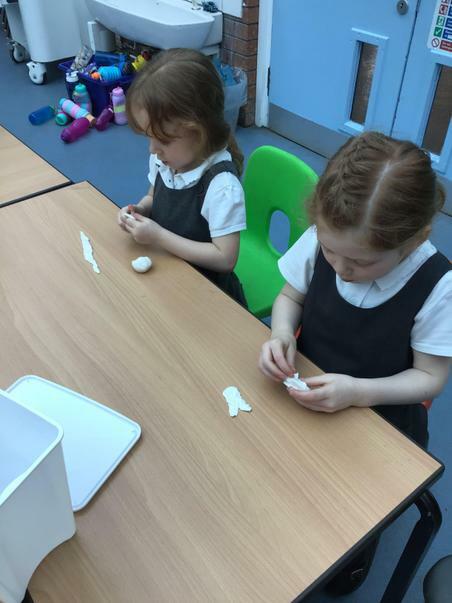 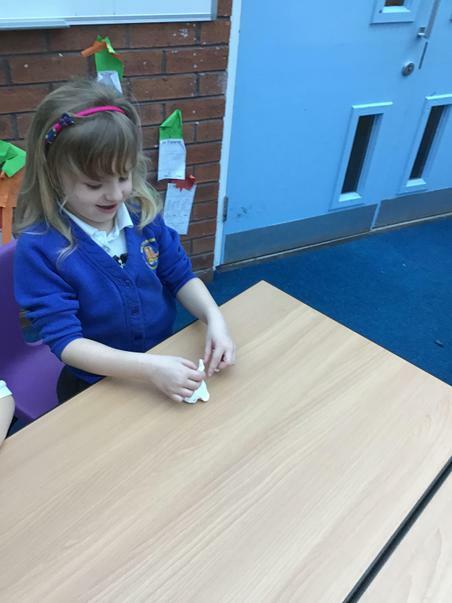 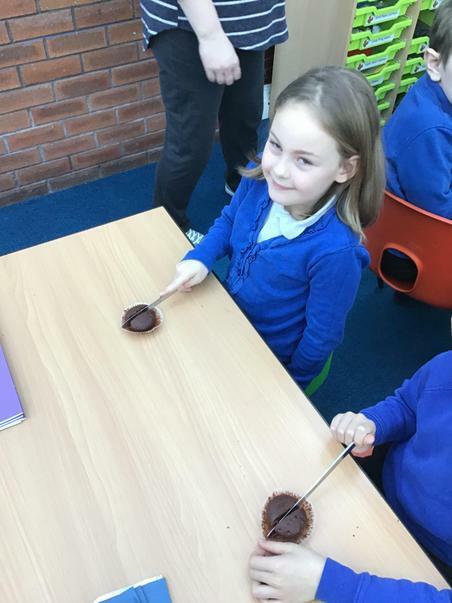 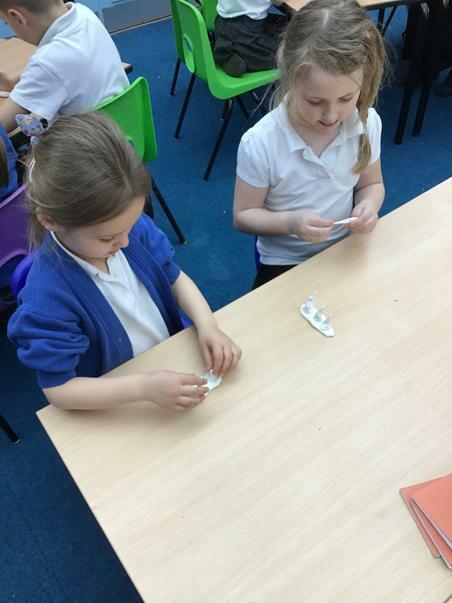 We then made our own dinosaur teeth using clay. 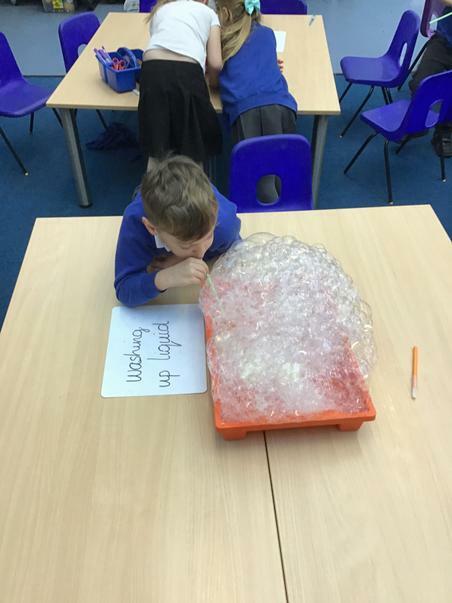 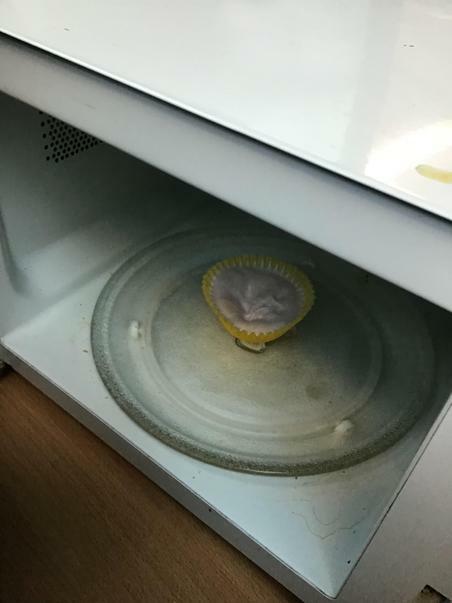 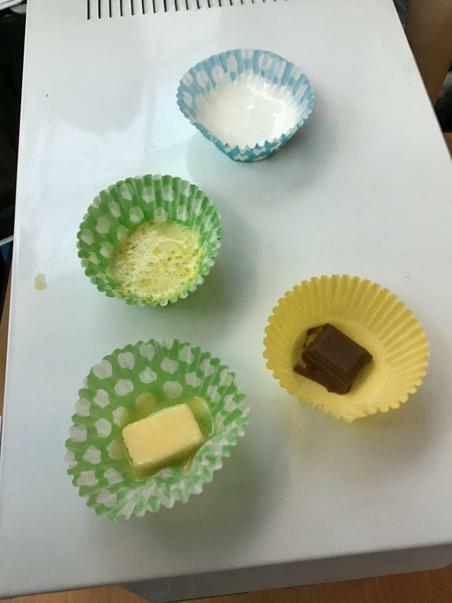 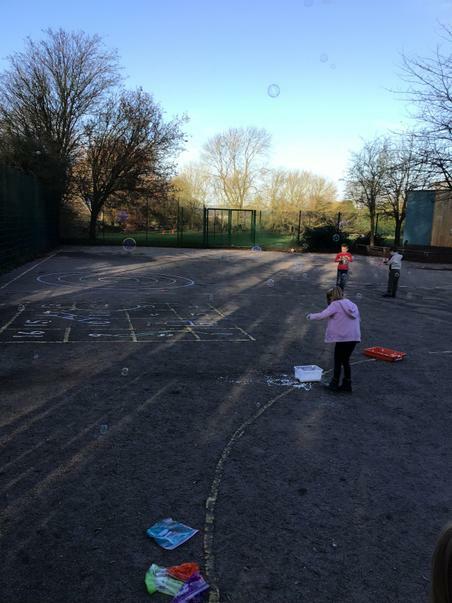 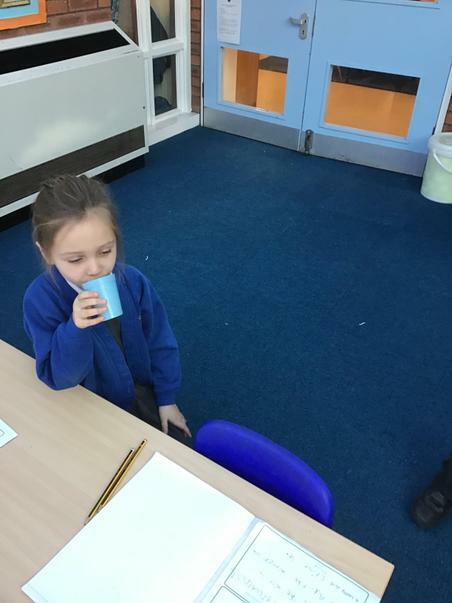 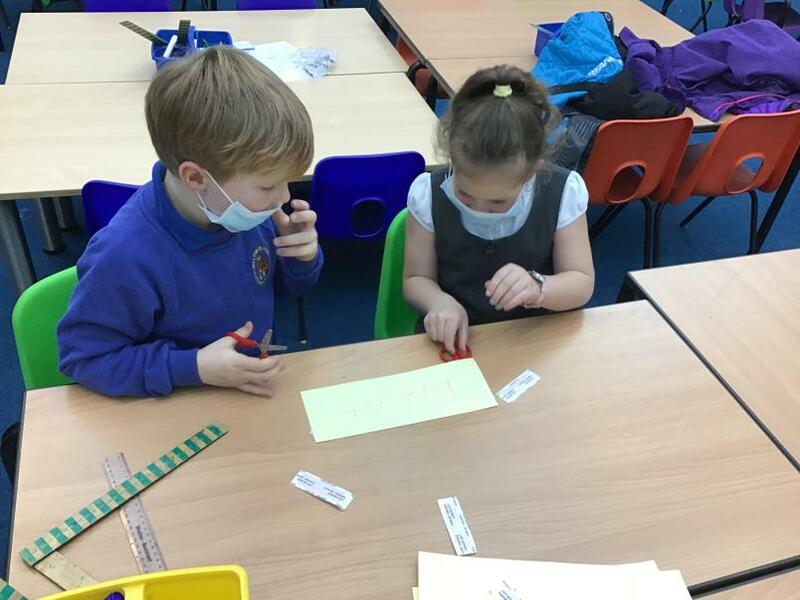 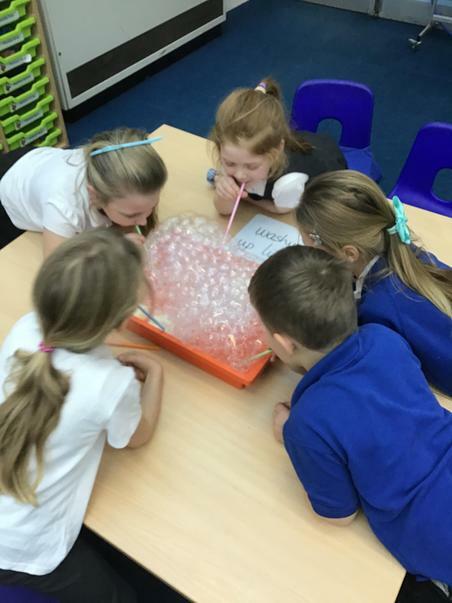 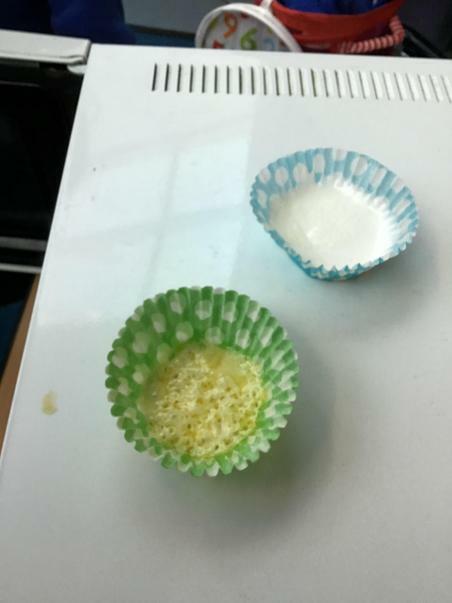 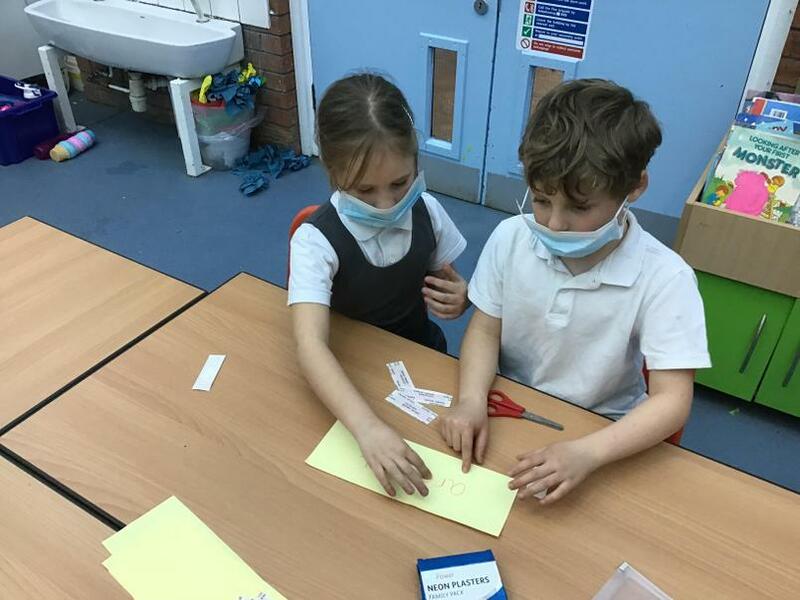 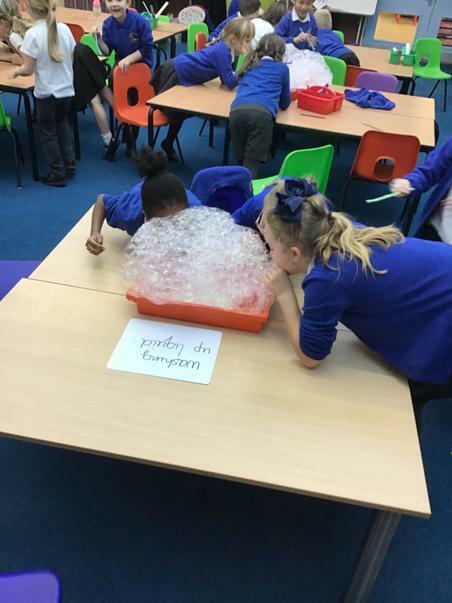 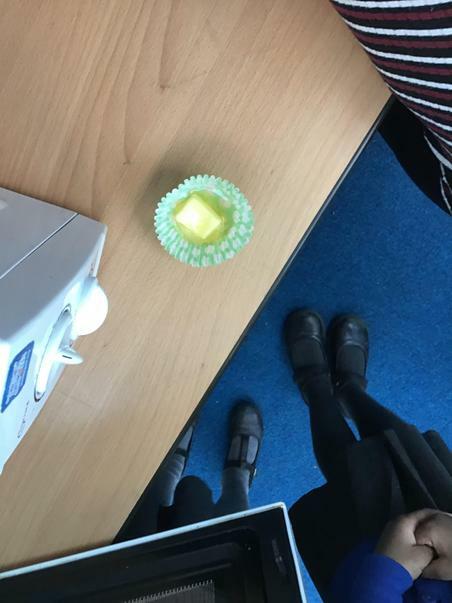 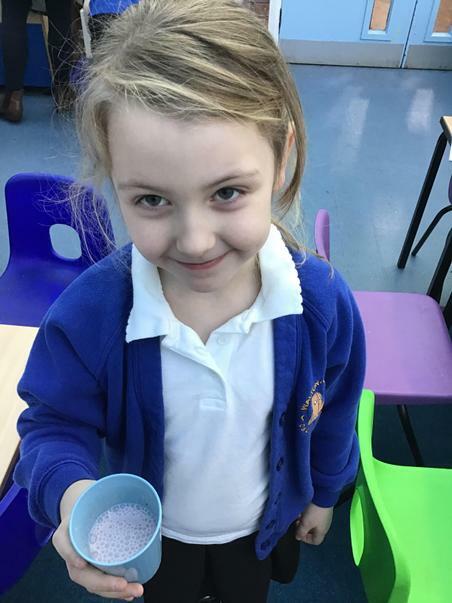 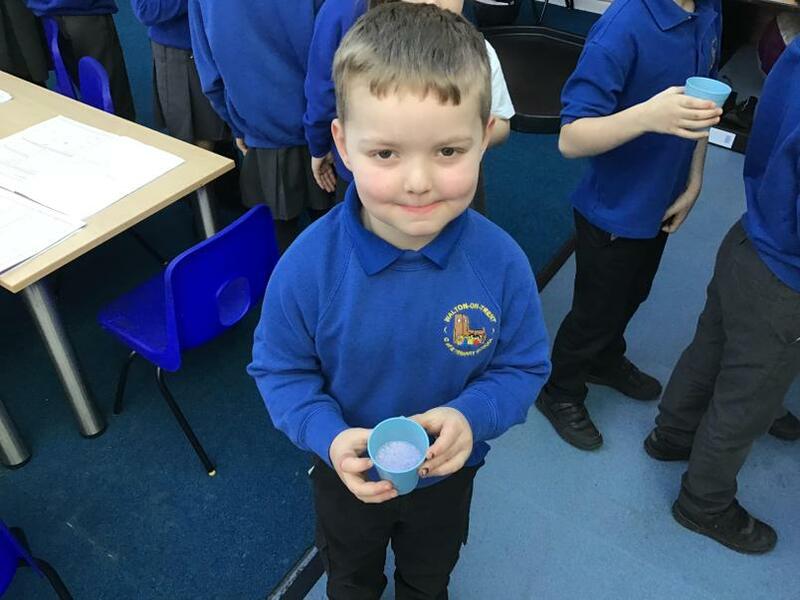 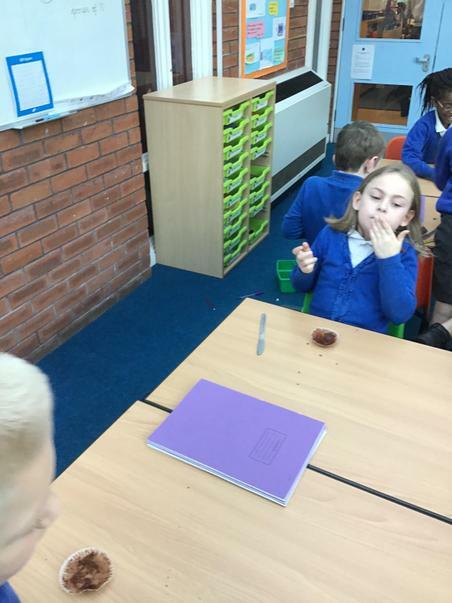 We discussed air pollution as a class and conducted an experiment to see which place would have more air pollution. 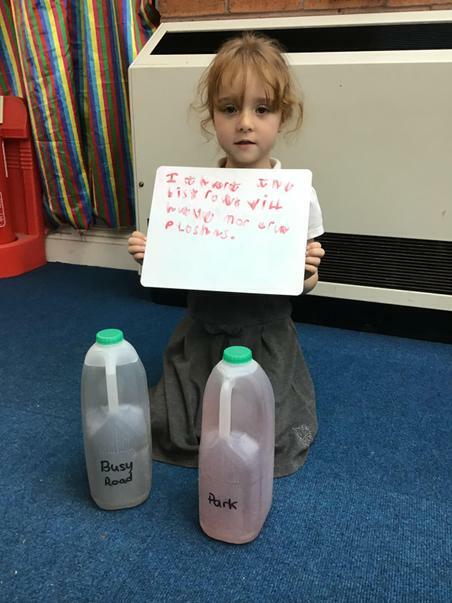 We had 2 bottles of air, one from a busy road and one from a park. 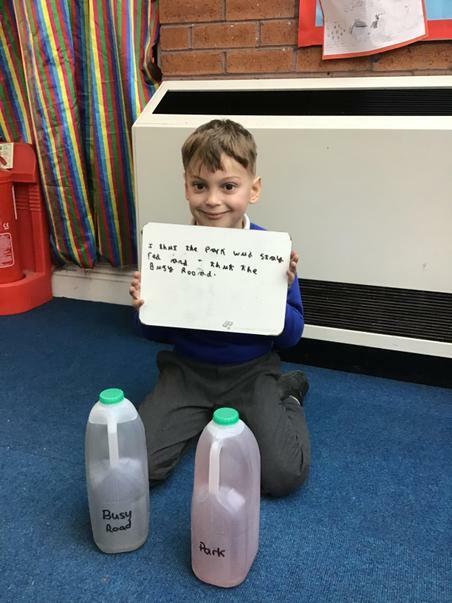 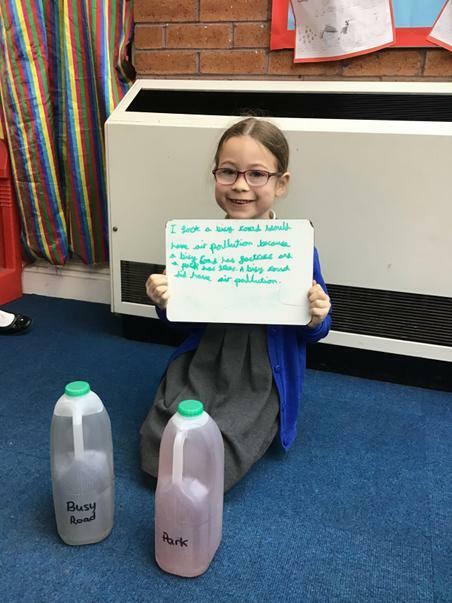 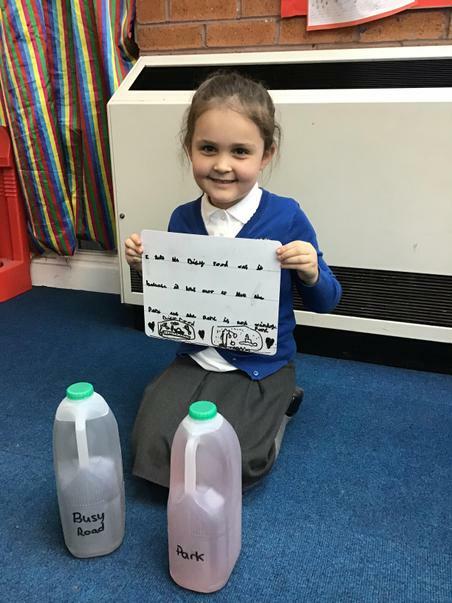 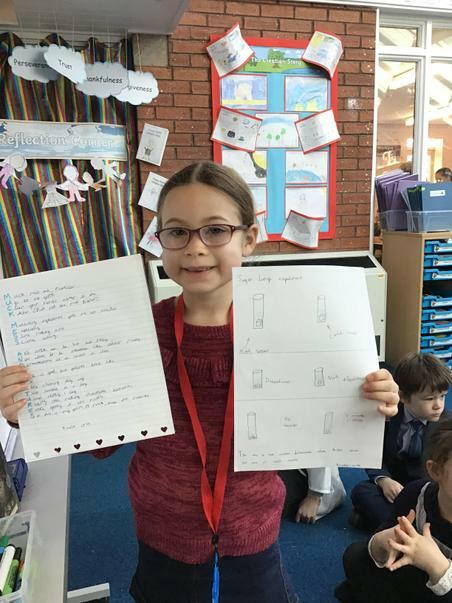 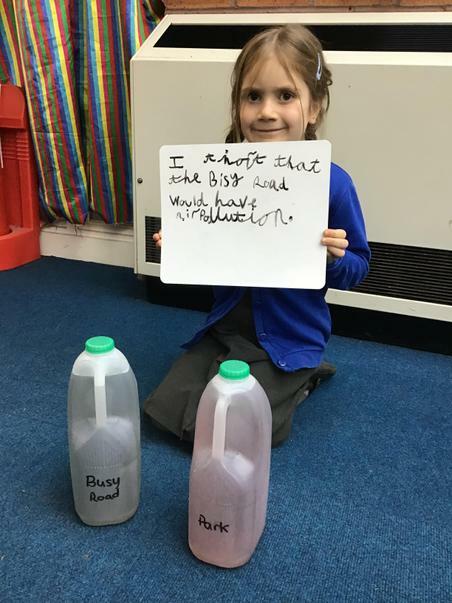 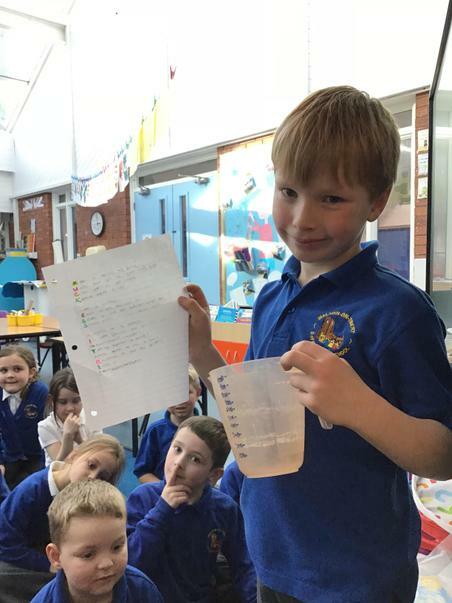 We predicted which bottle contained more air pollution. 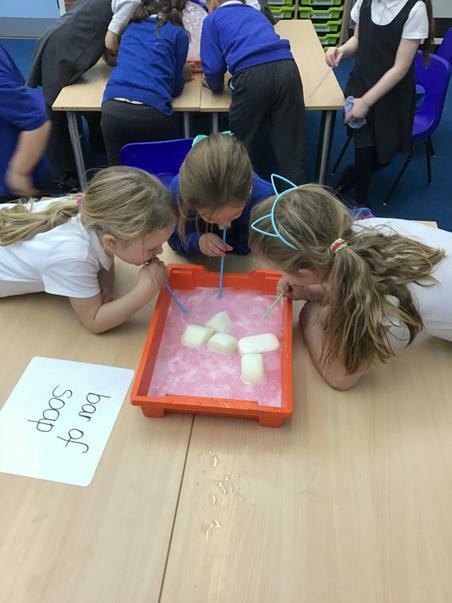 Then we added a reactor to the bottles and one turned grey while the other stayed pink. 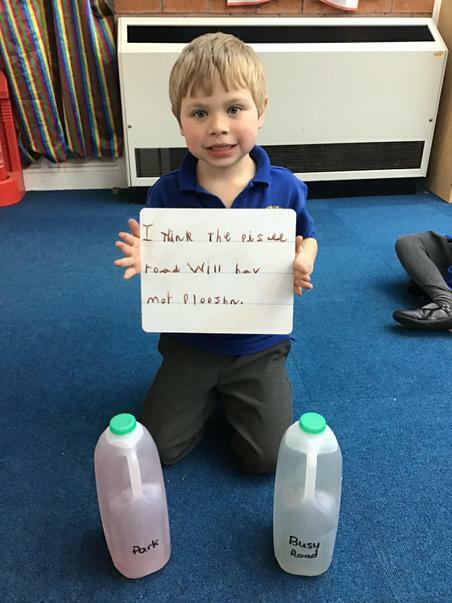 Here are some of our predictions. 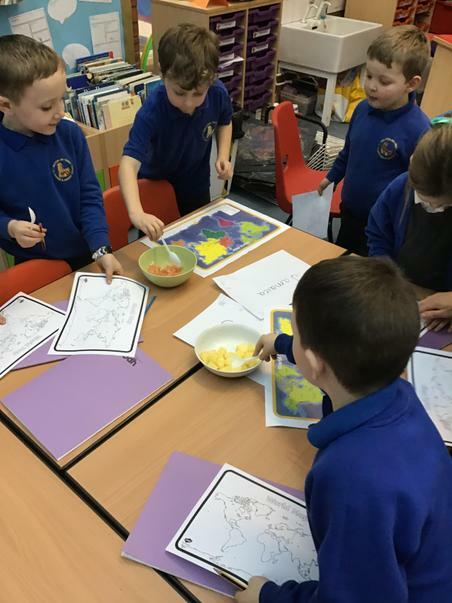 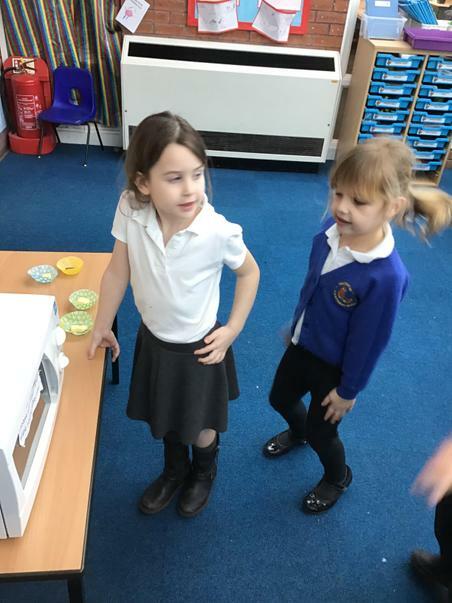 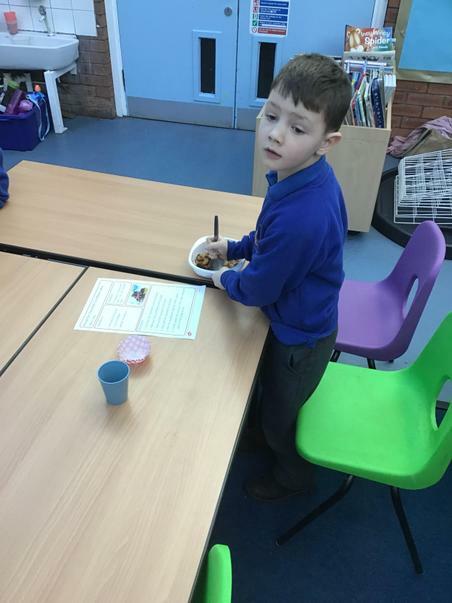 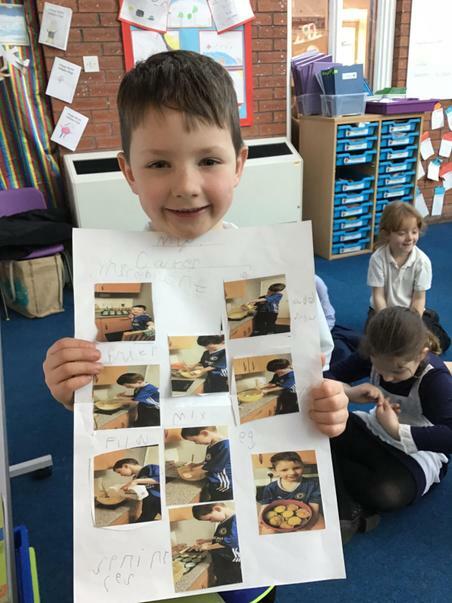 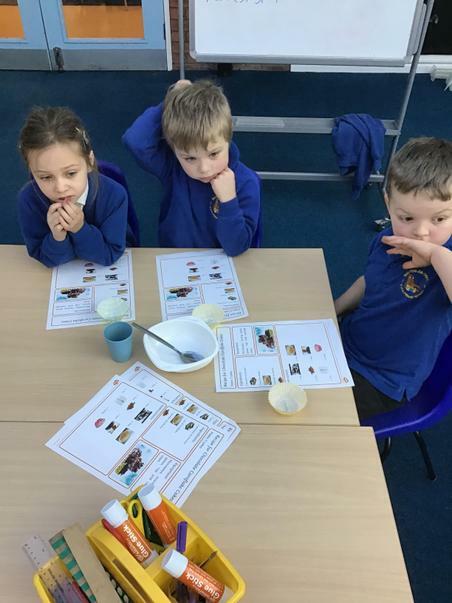 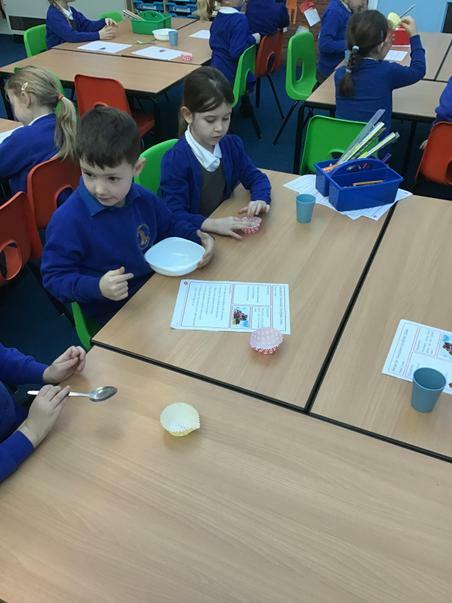 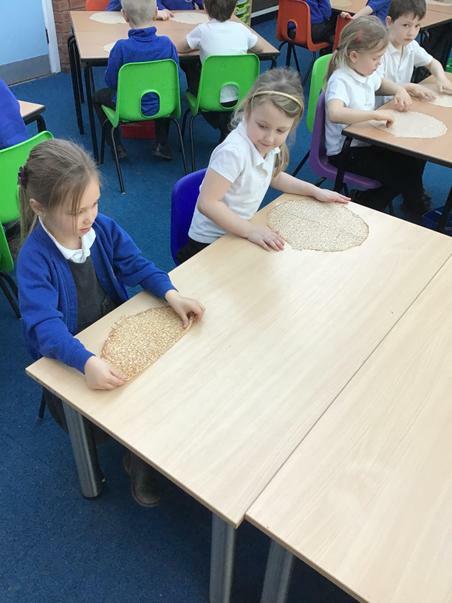 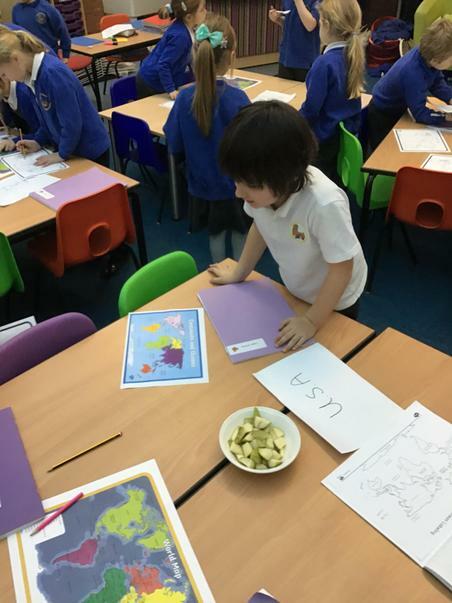 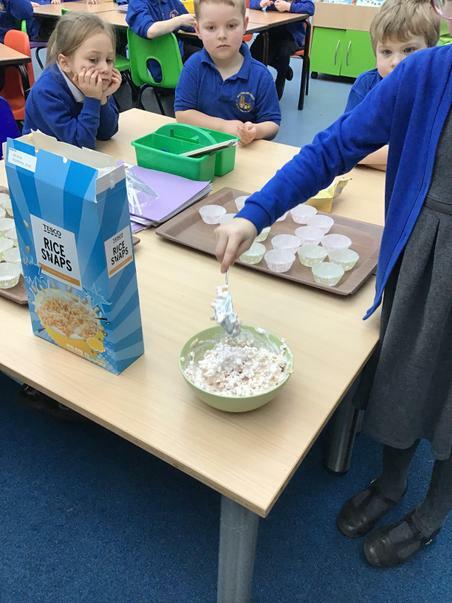 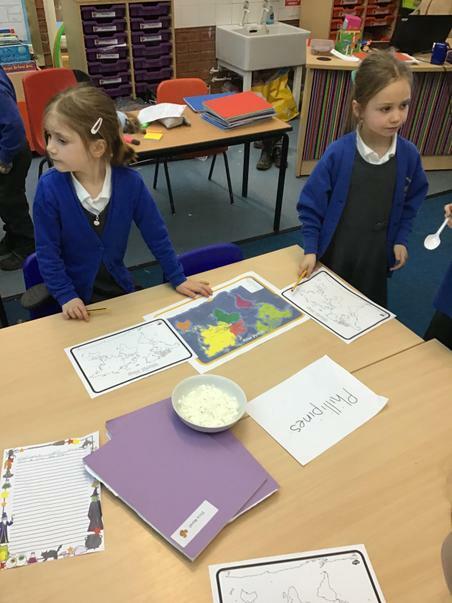 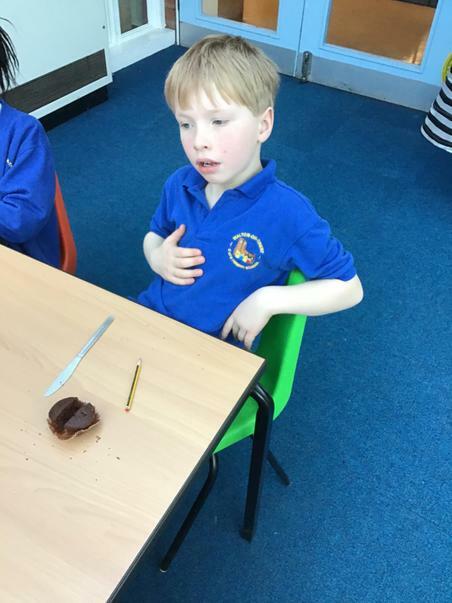 Learning about some British celebrations - Pancake Day and St David's Day. 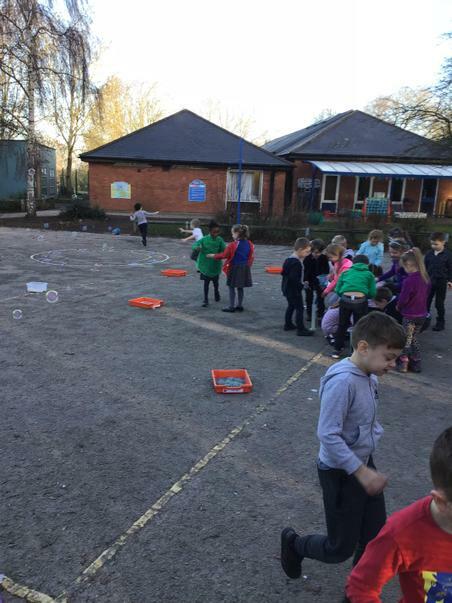 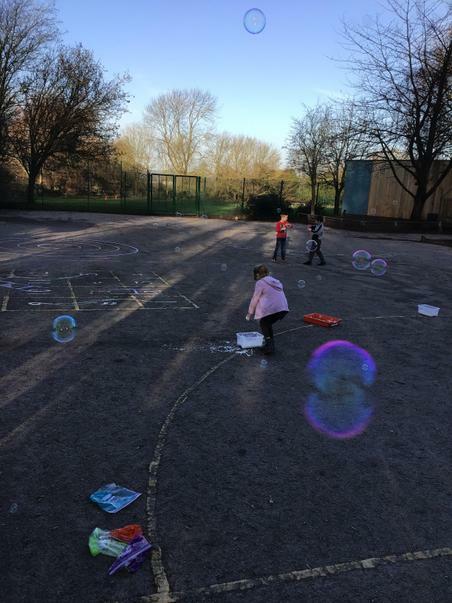 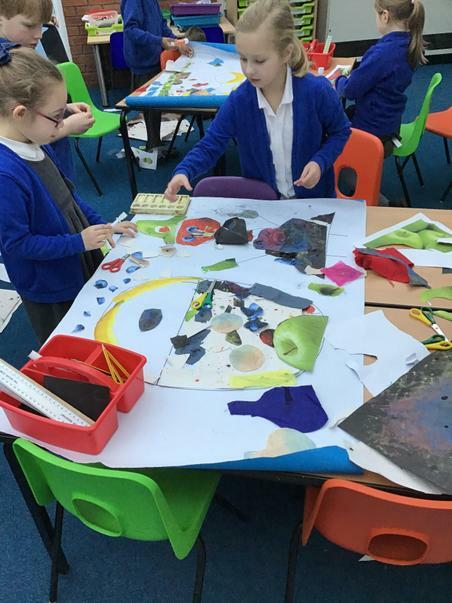 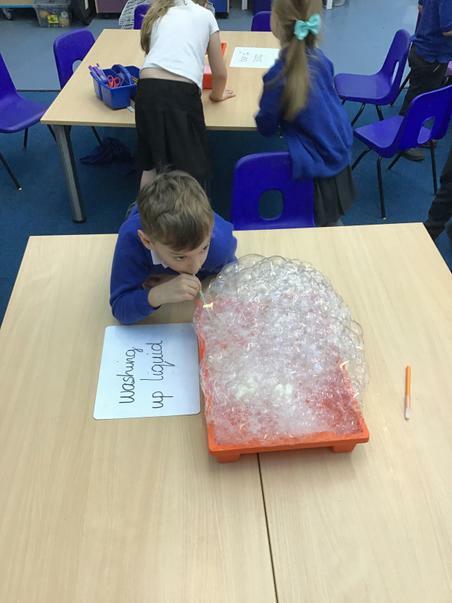 A great start to our new topic, Dinosaur Planet! 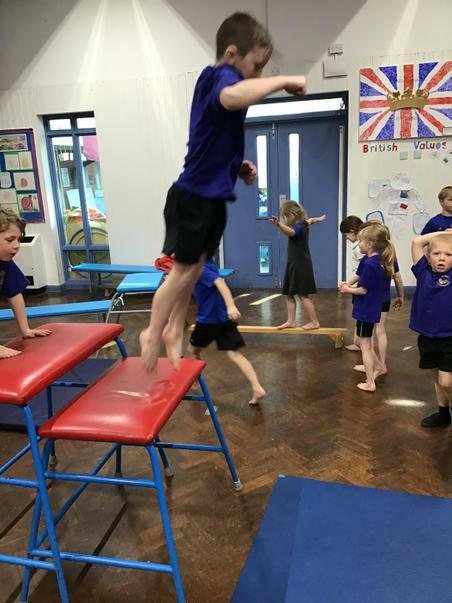 Stomp, crash, RRRAGH! 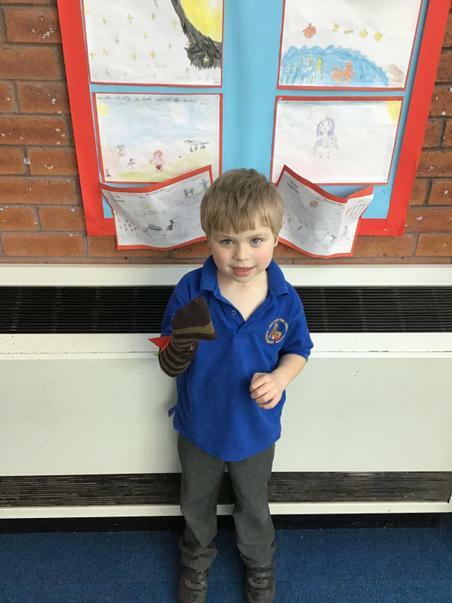 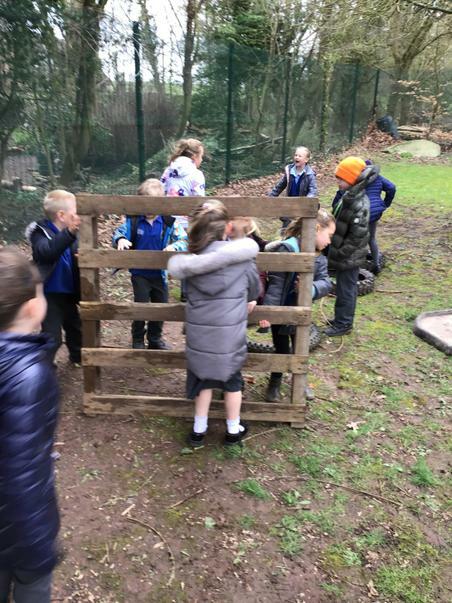 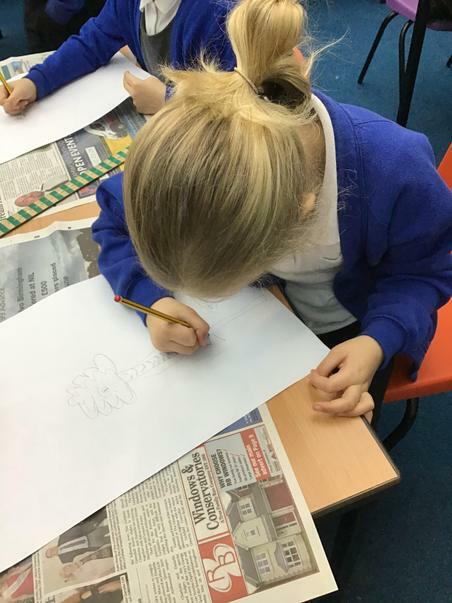 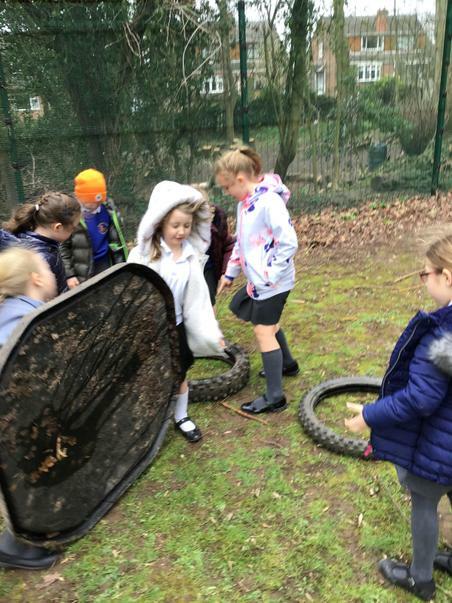 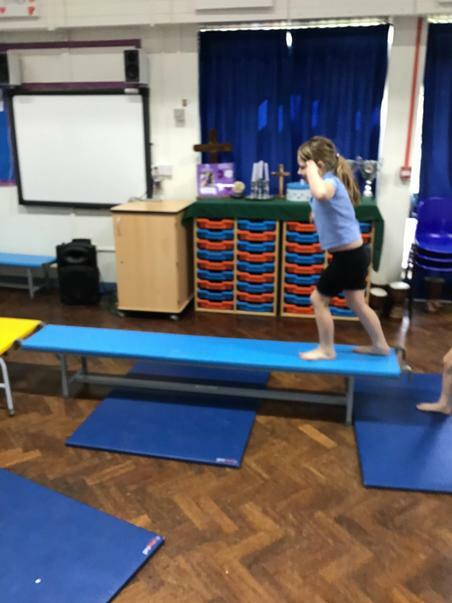 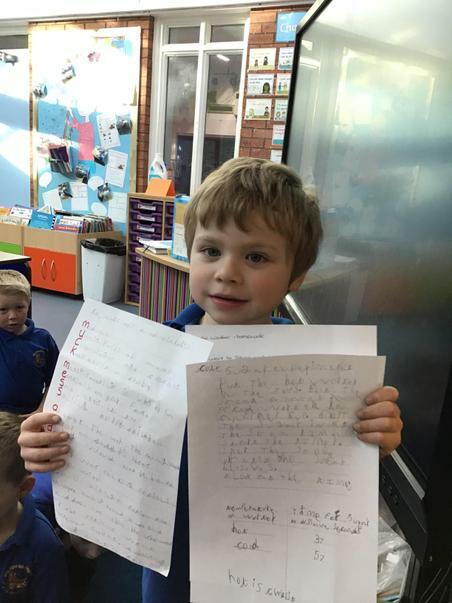 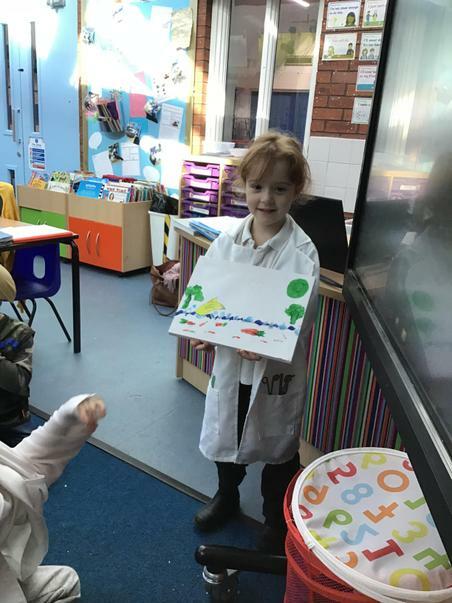 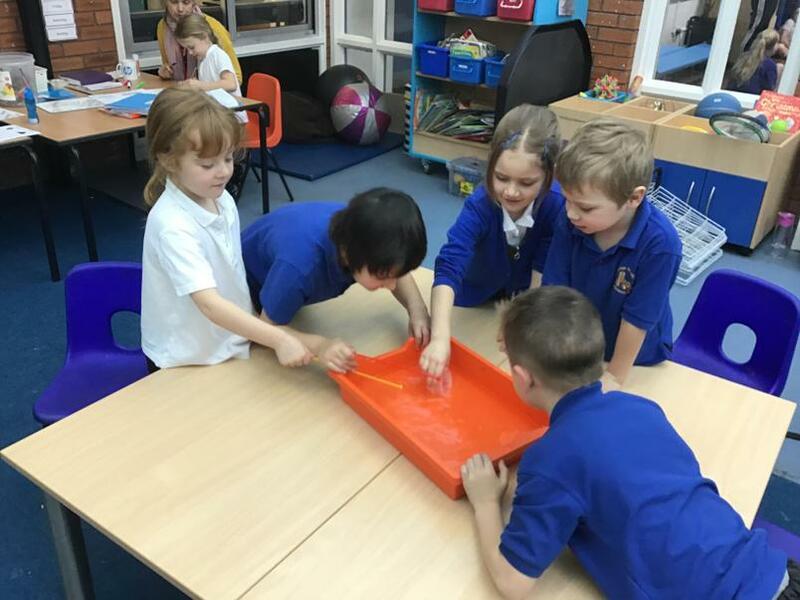 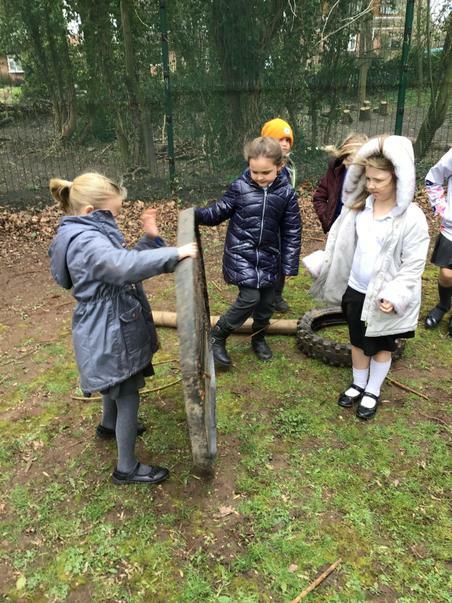 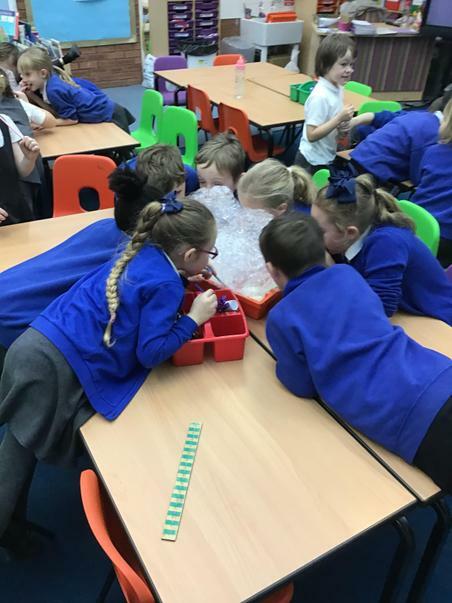 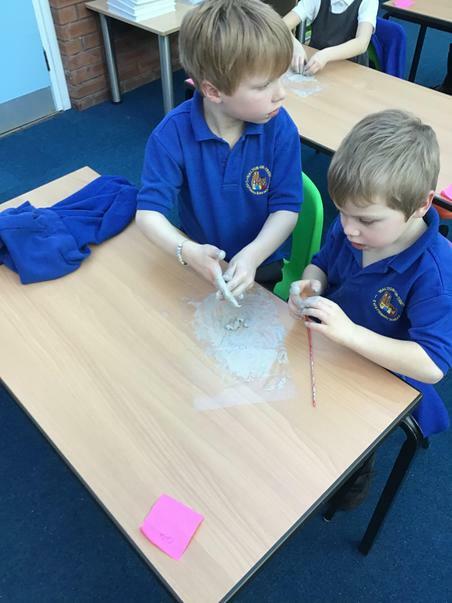 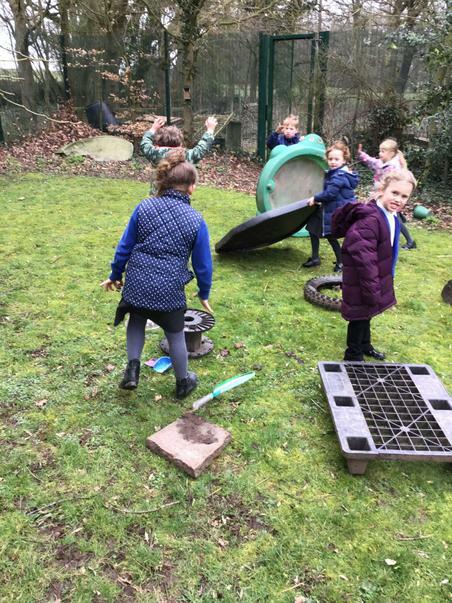 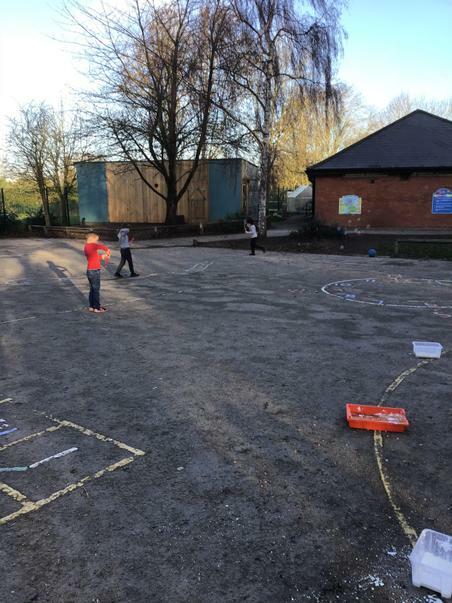 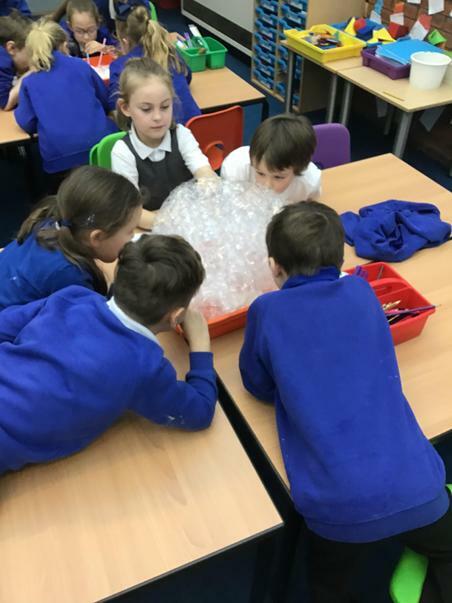 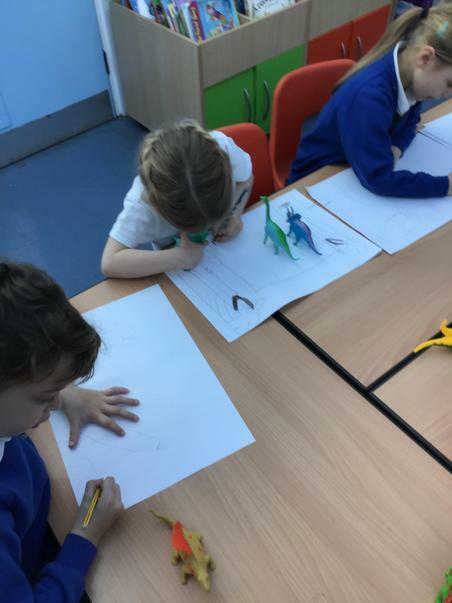 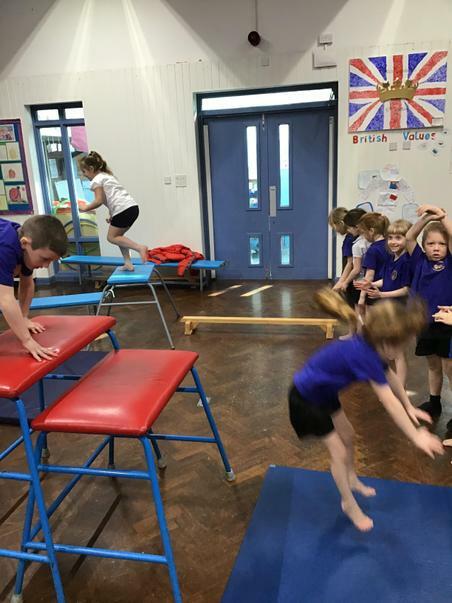 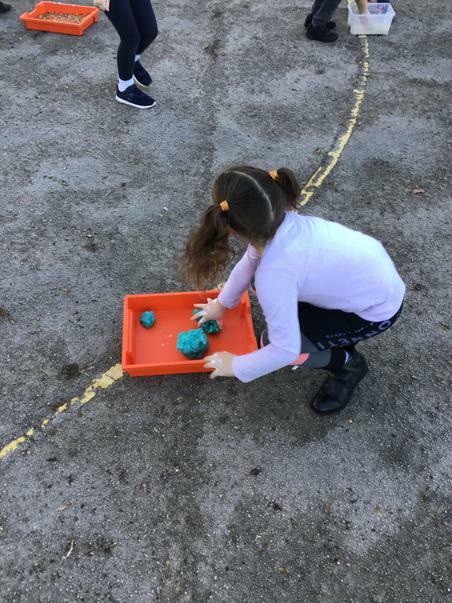 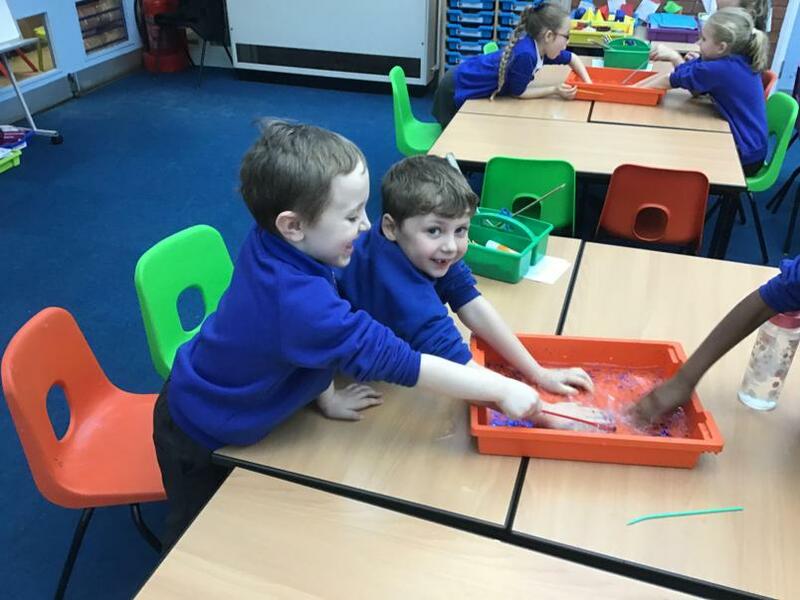 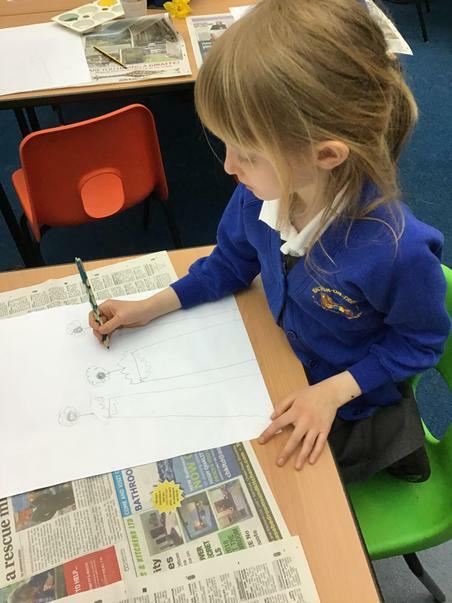 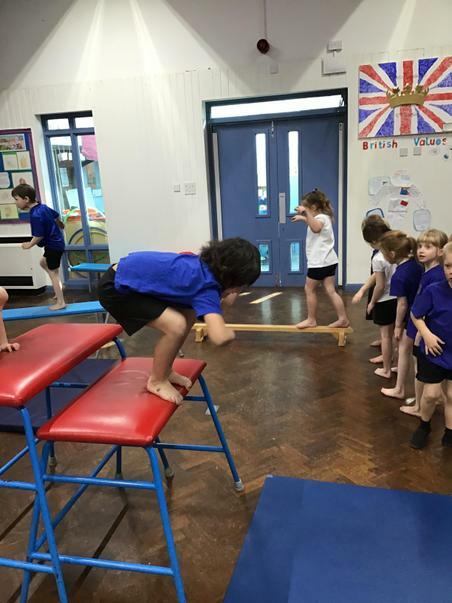 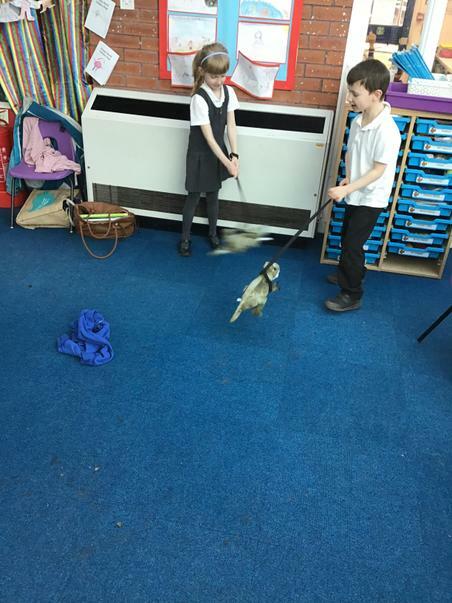 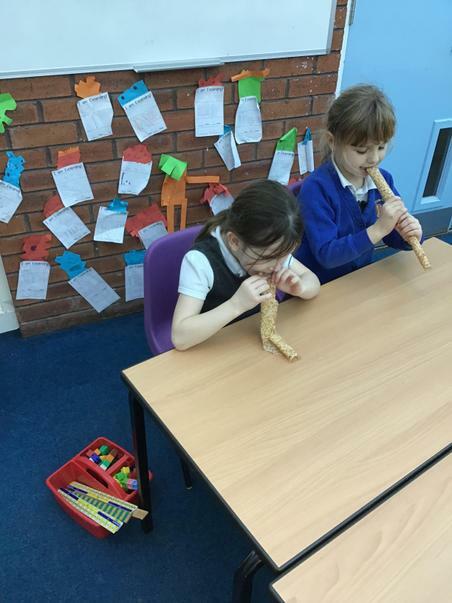 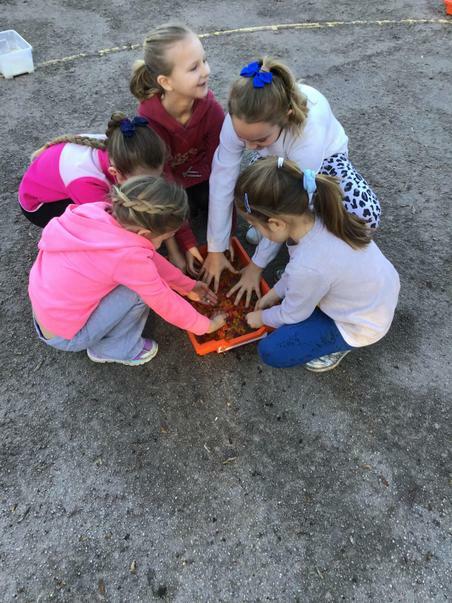 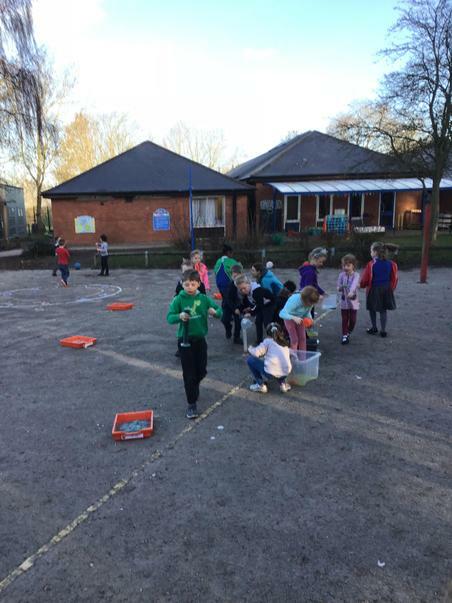 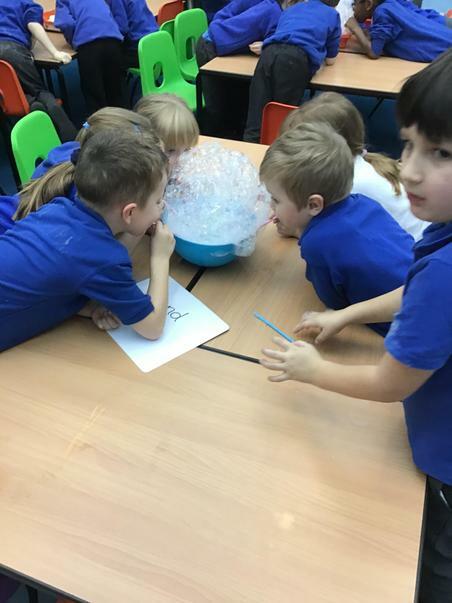 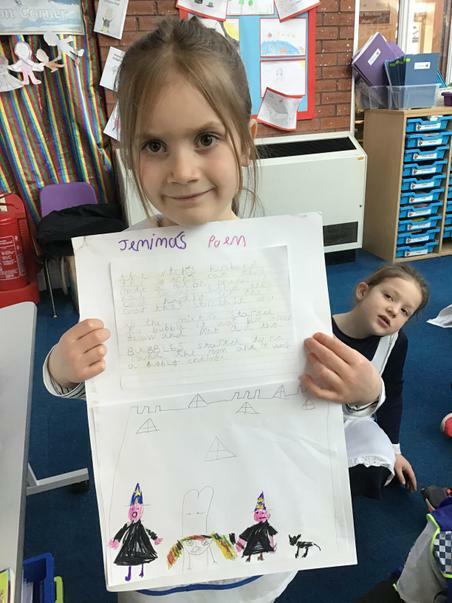 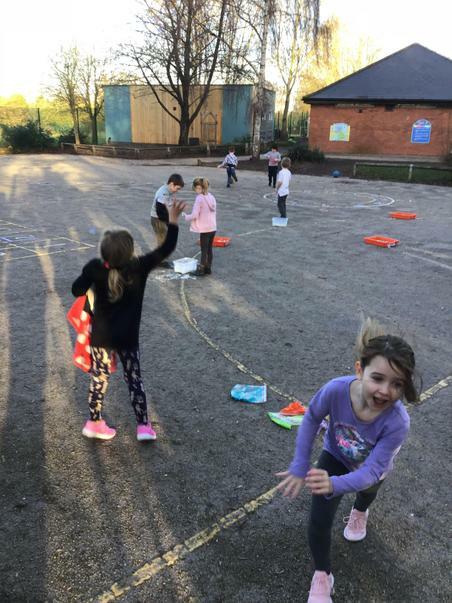 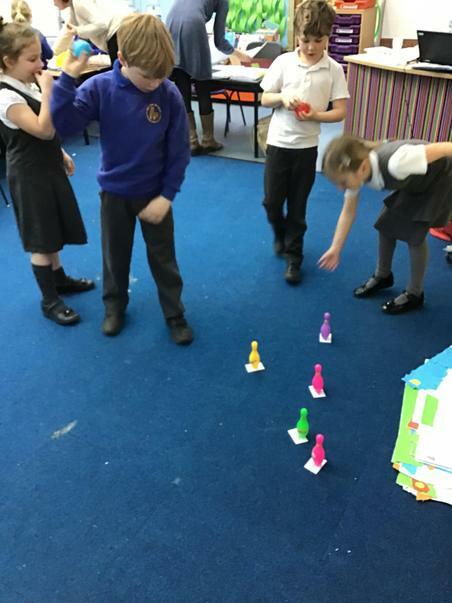 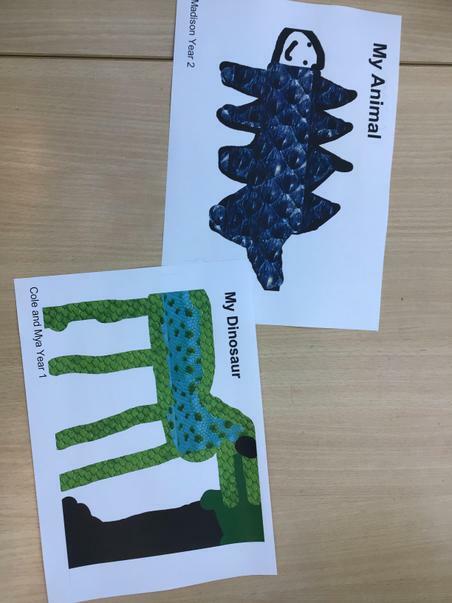 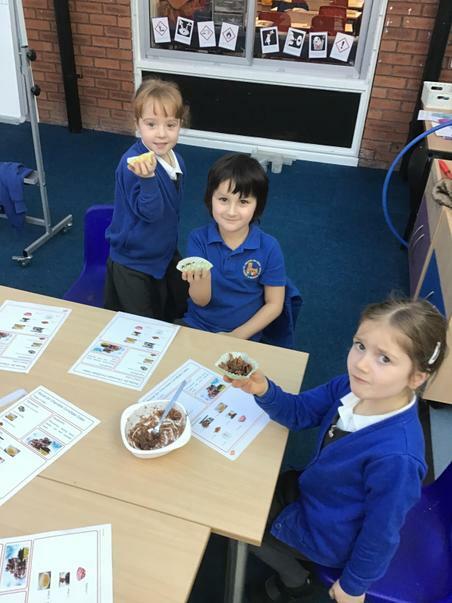 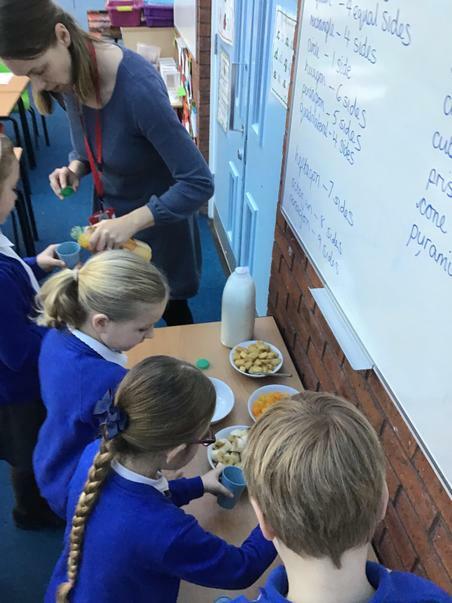 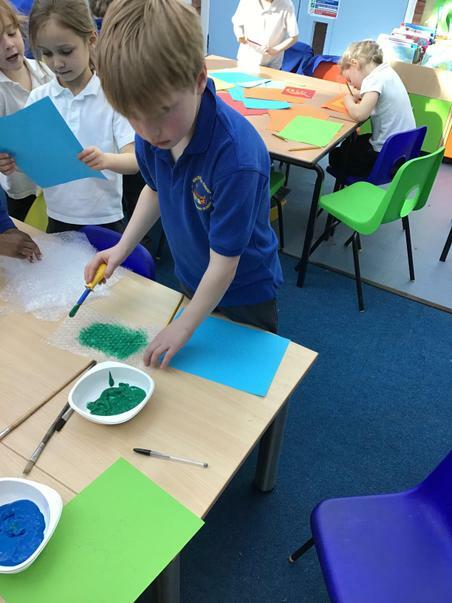 Watch out Squirrel Class – the dinosaurs are on the prowl! 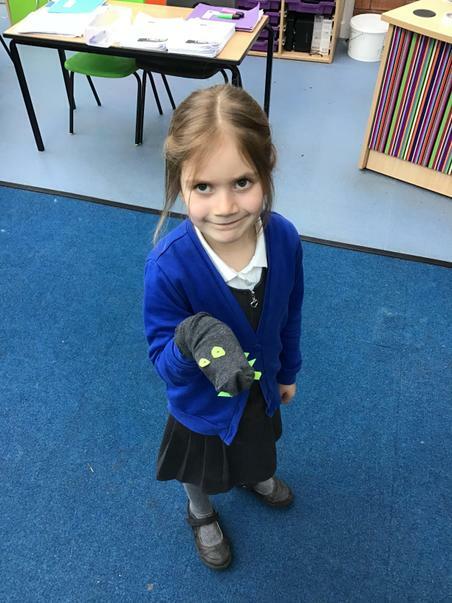 Dinosaurs are going to be rampaging through our classroom this term, swishing their enormous tails and baring their fearsome teeth. 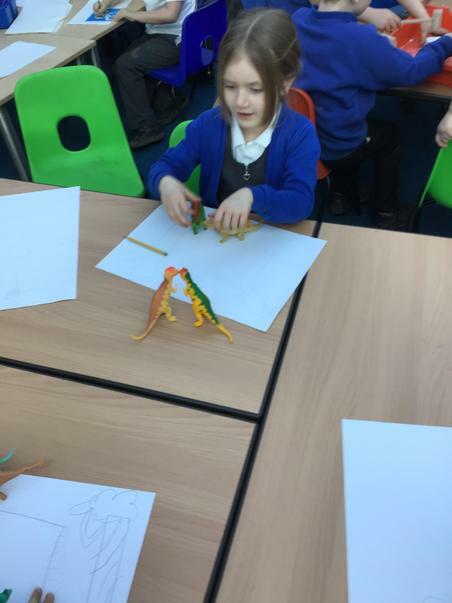 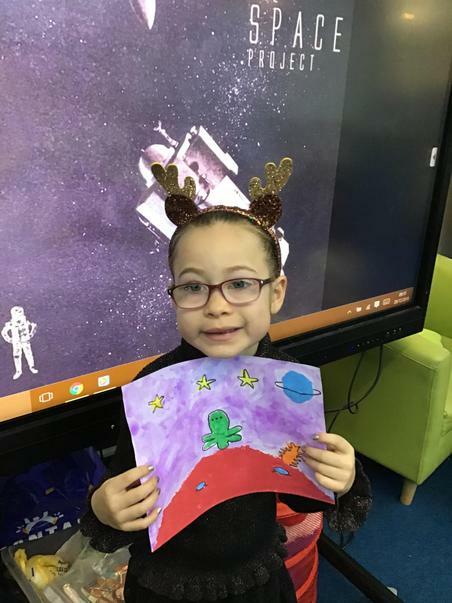 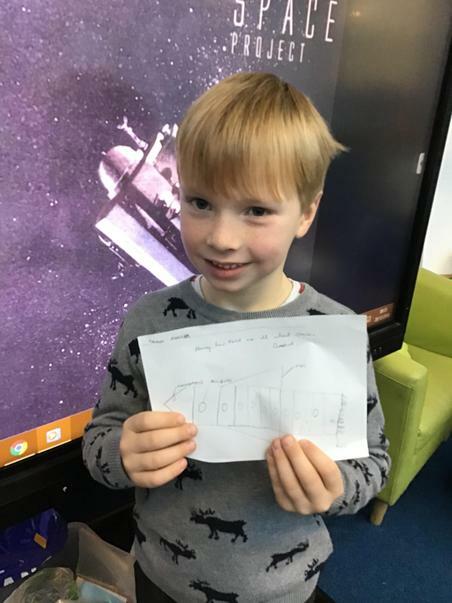 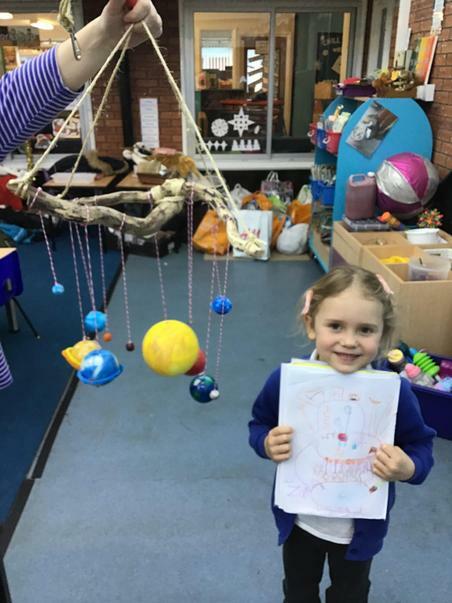 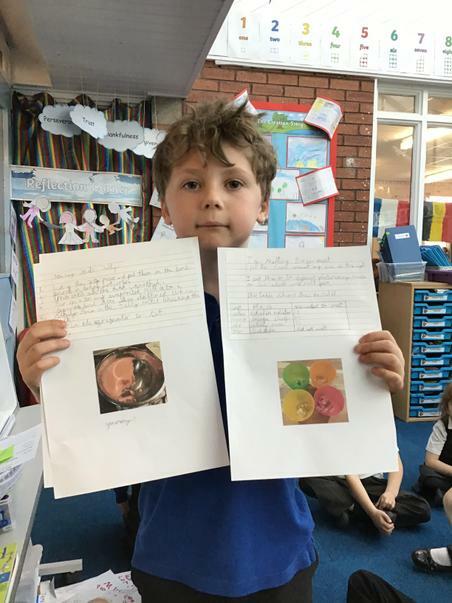 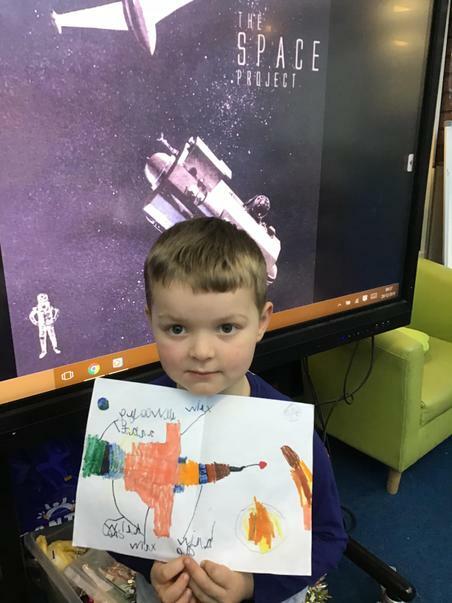 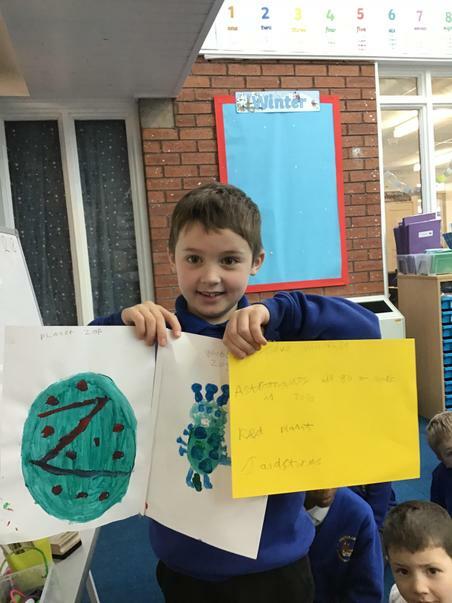 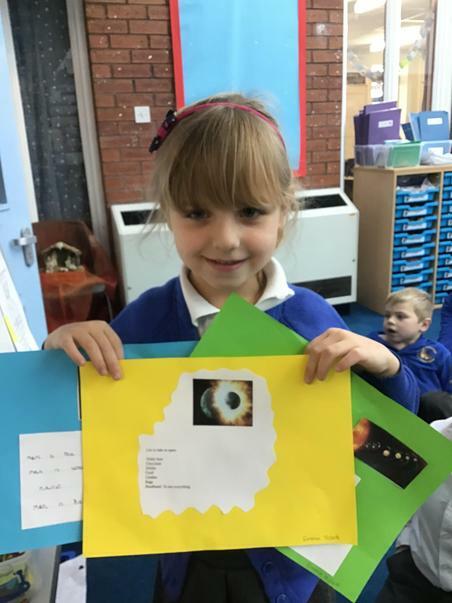 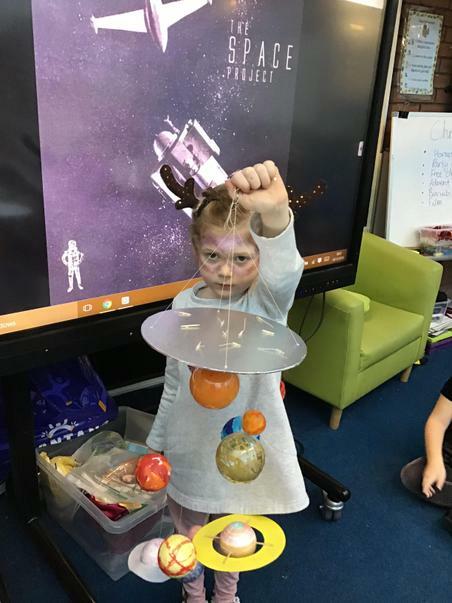 We will be exploring the topic Dinosaur Planet. 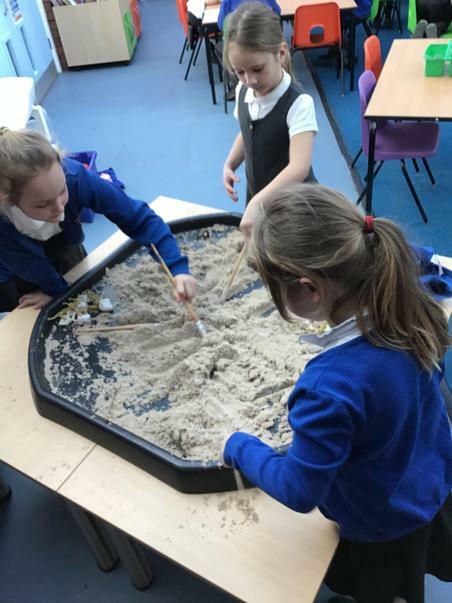 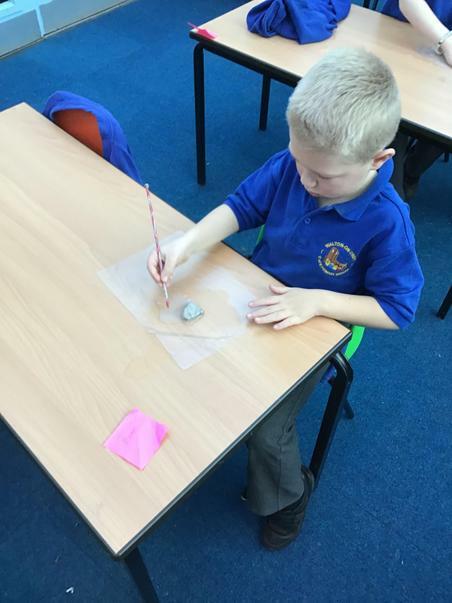 We will be imagining we are paleontologists (a scientist who studies bones and fossils) and learning all about Mary Anning. 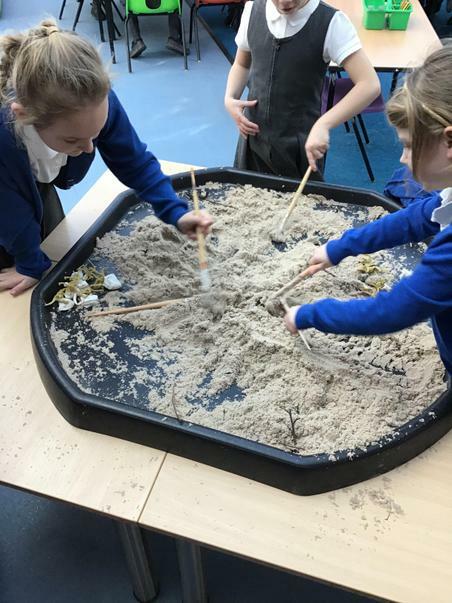 We will be digging deep and discovering dinosaur facts. 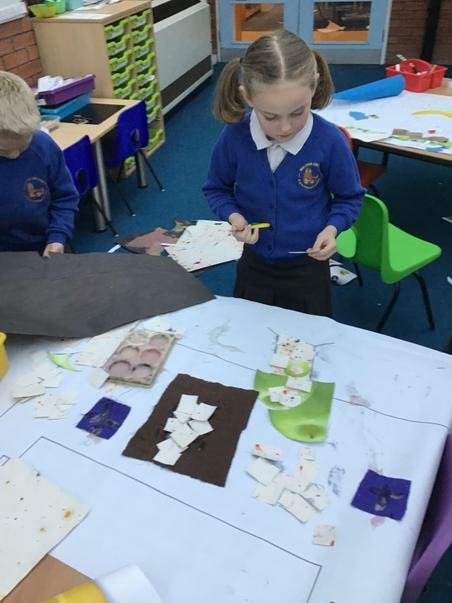 We will also be creating our own dinosaur museum ready for visitors to come and see our dinosaur artefacts. 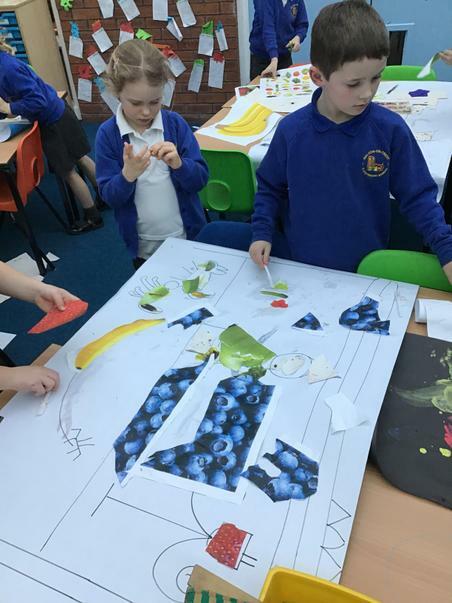 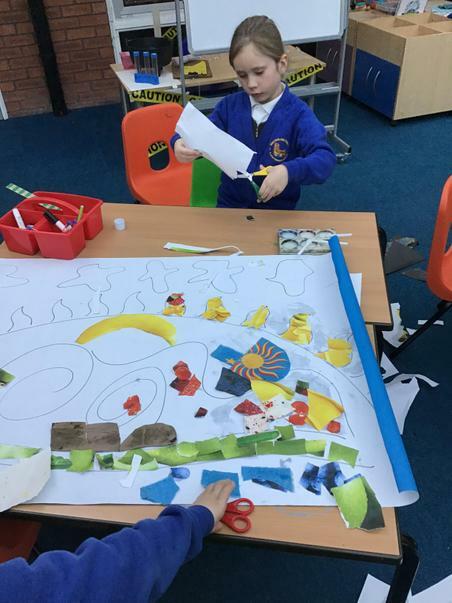 Monday March 4th we will be creating huge dinosaur models outside this week. 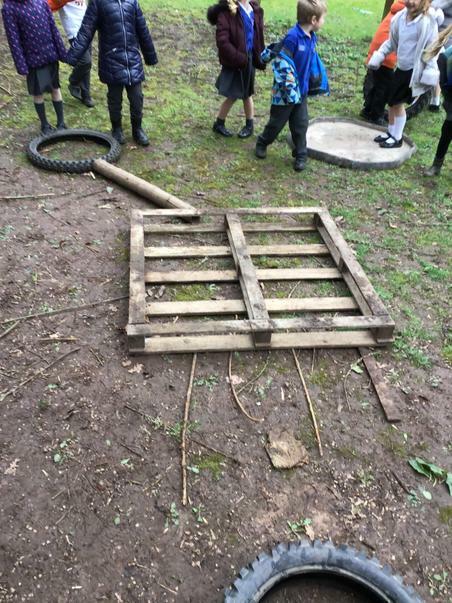 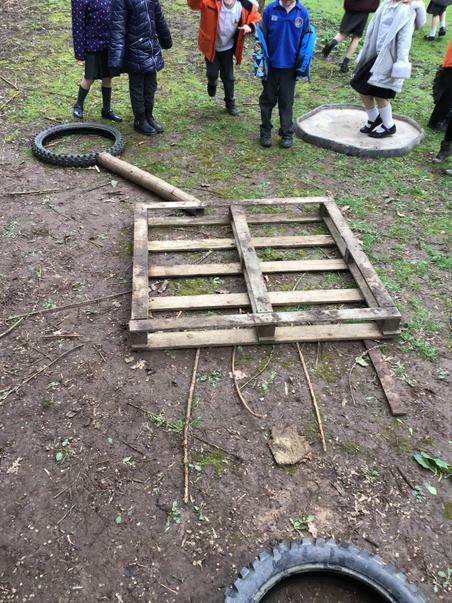 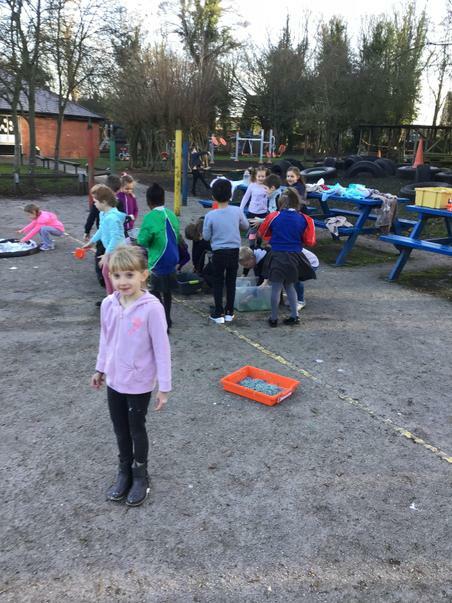 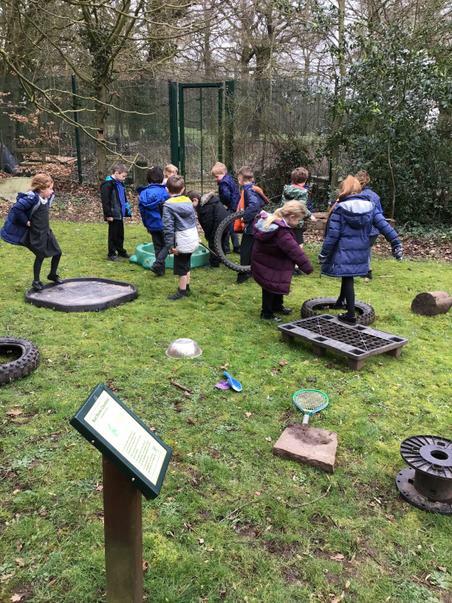 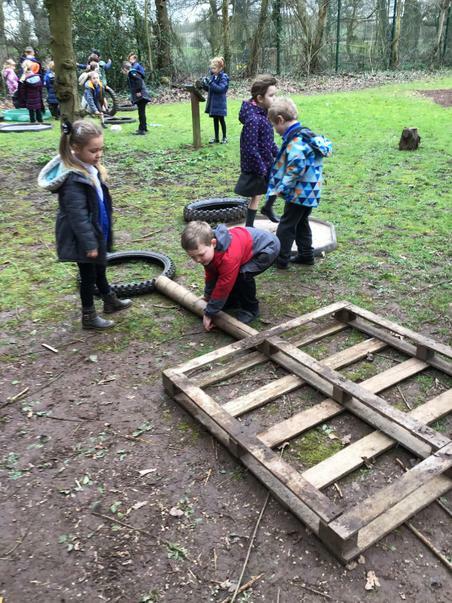 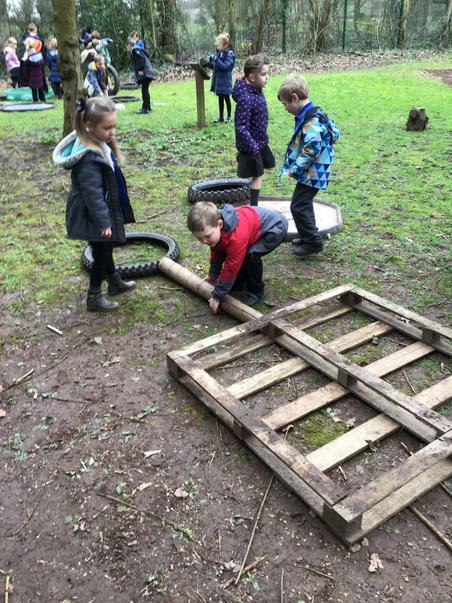 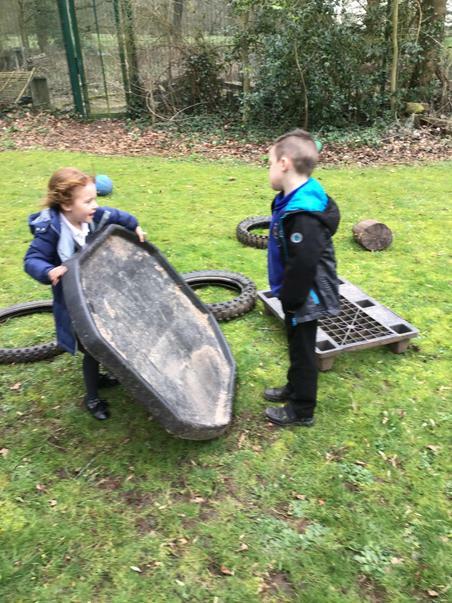 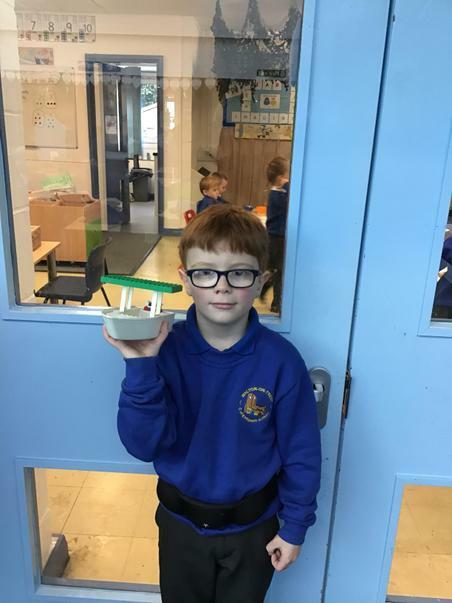 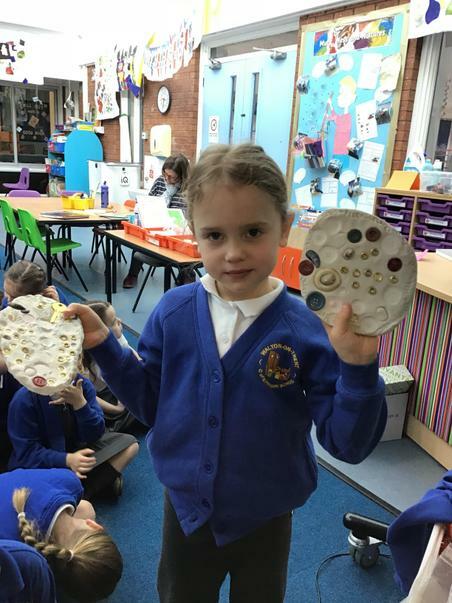 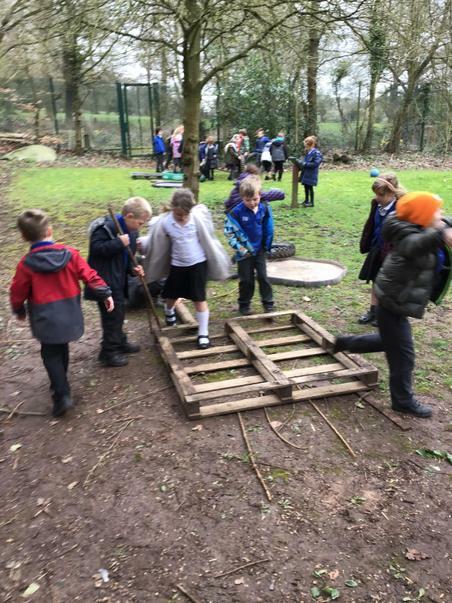 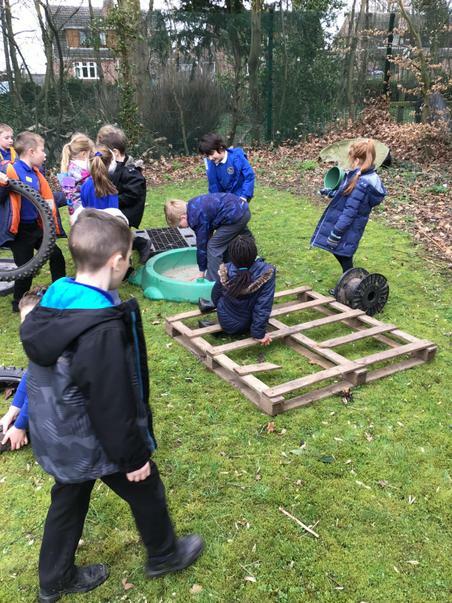 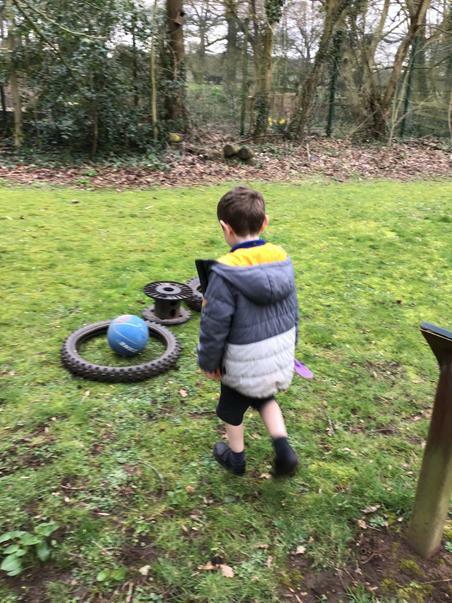 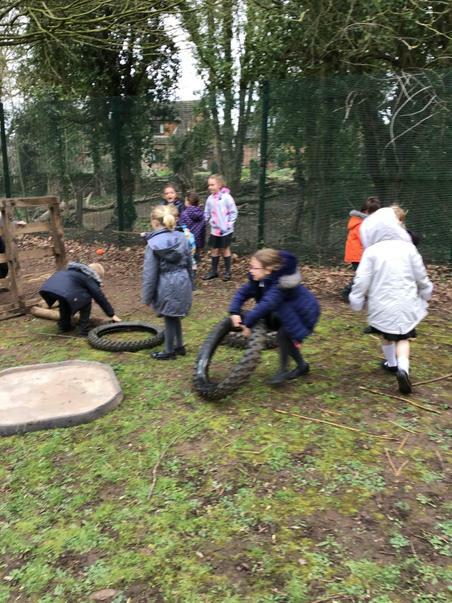 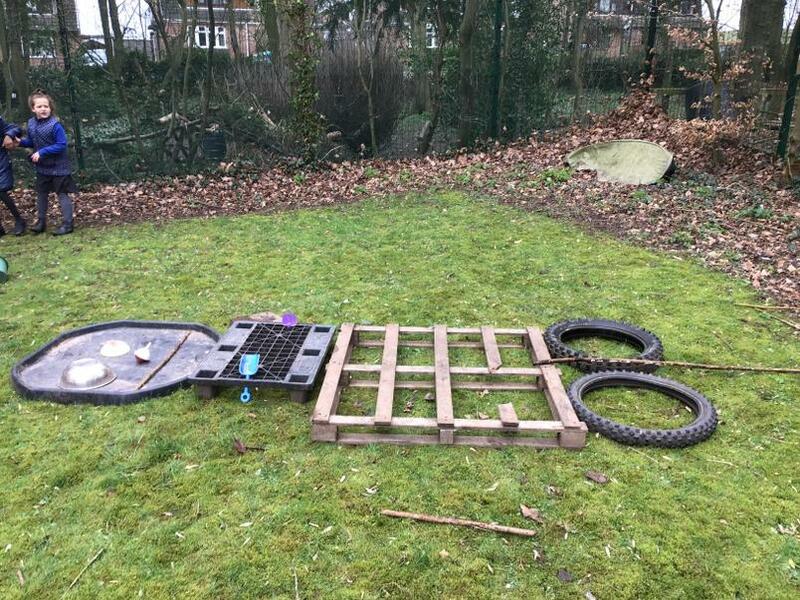 If you have any recycled materials such as tyres, barrels, pipes, boxes or crates please send them into school to help us with our dinosaur models. 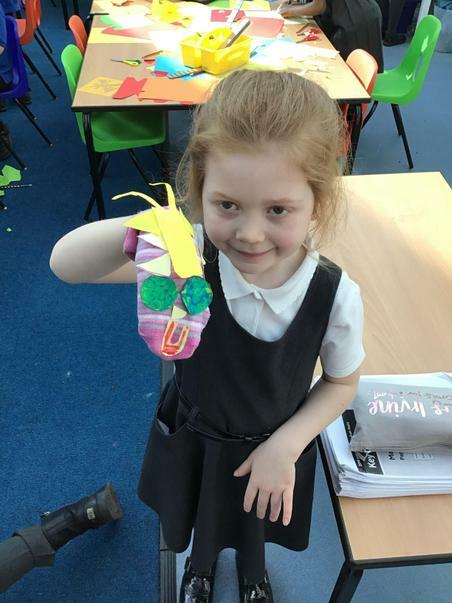 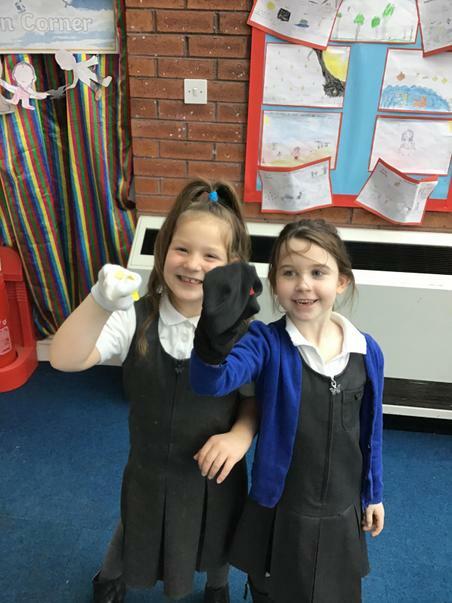 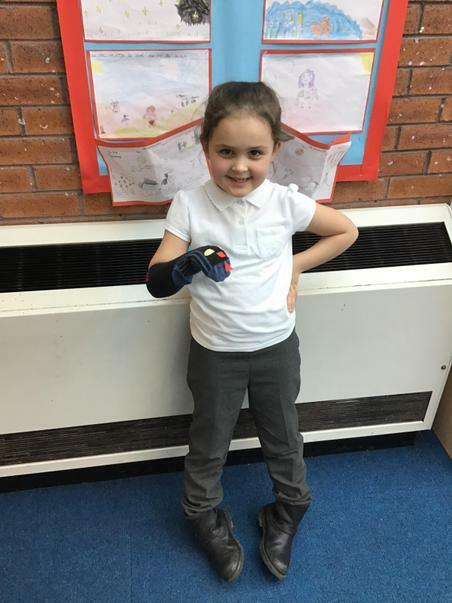 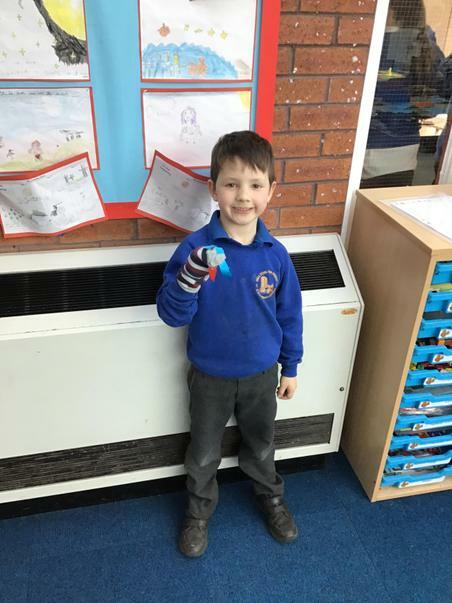 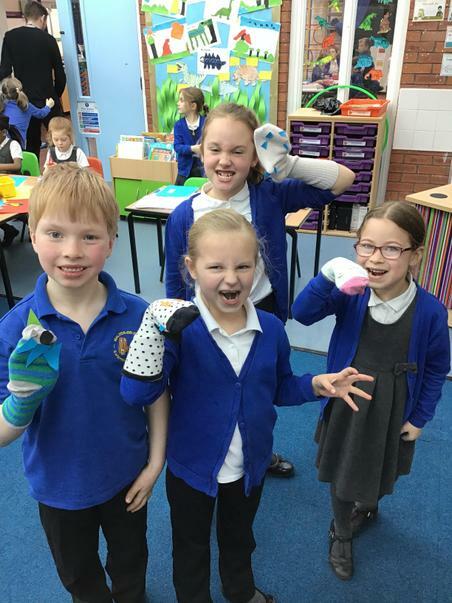 Monday 11th March we will be creating our own dinosaur sock puppets this week. 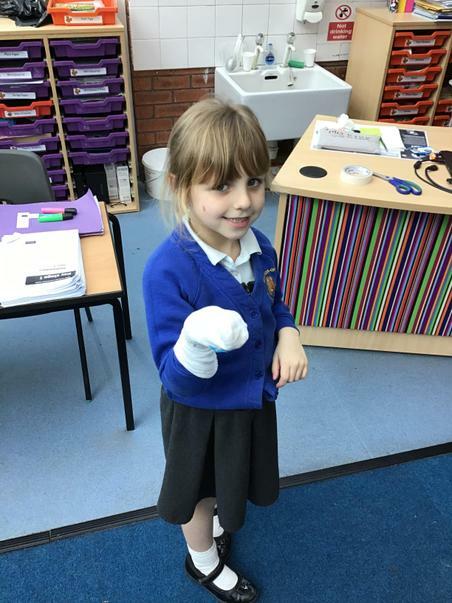 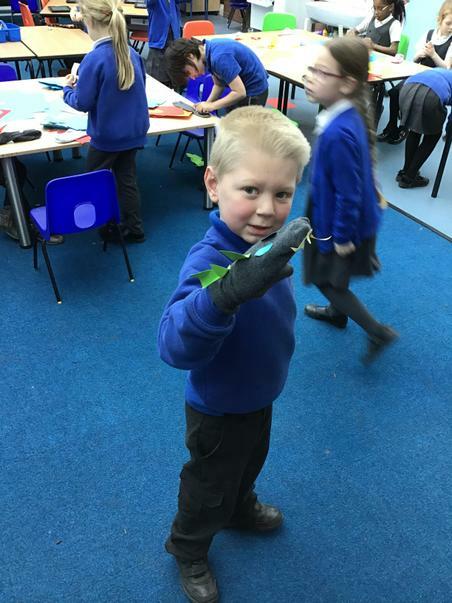 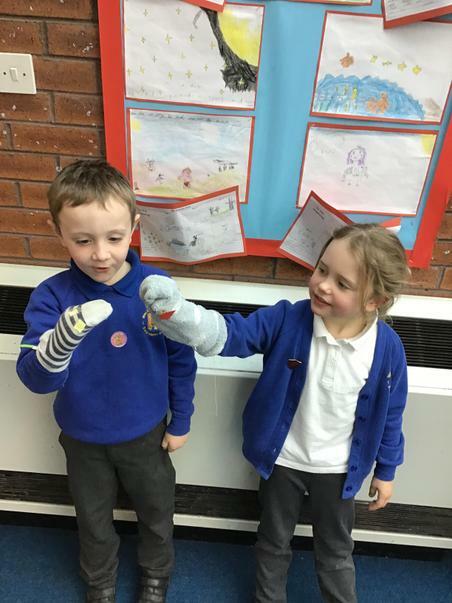 Please could each child in Squirrel Class bring in an old or odd sock to create their own dinosaur puppets. 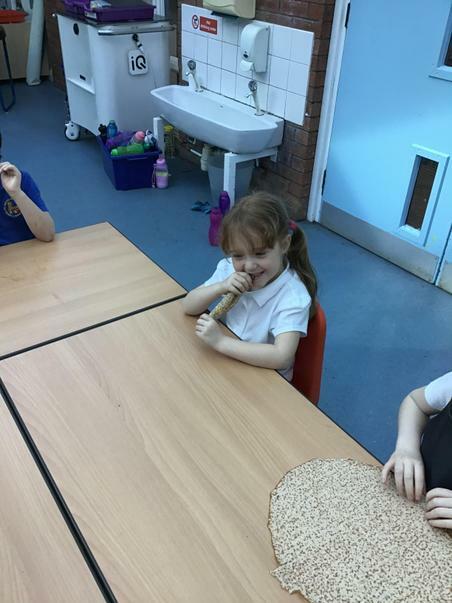 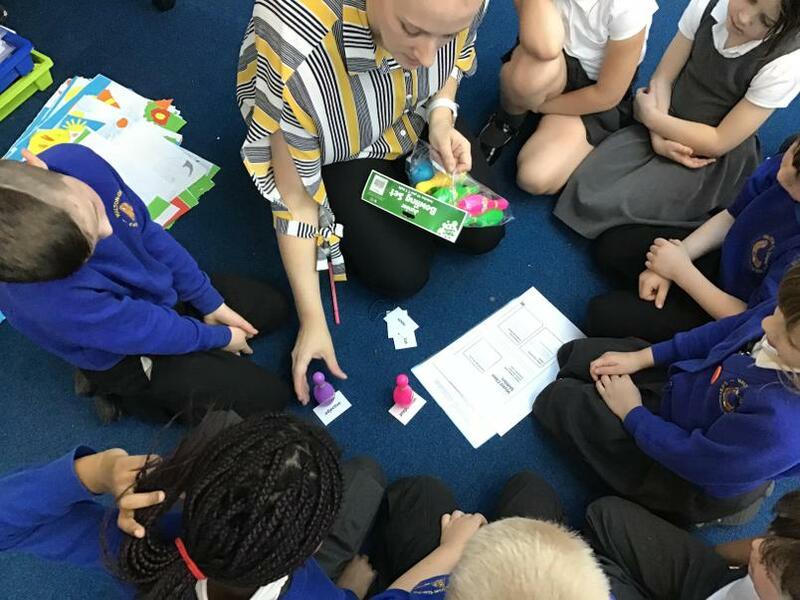 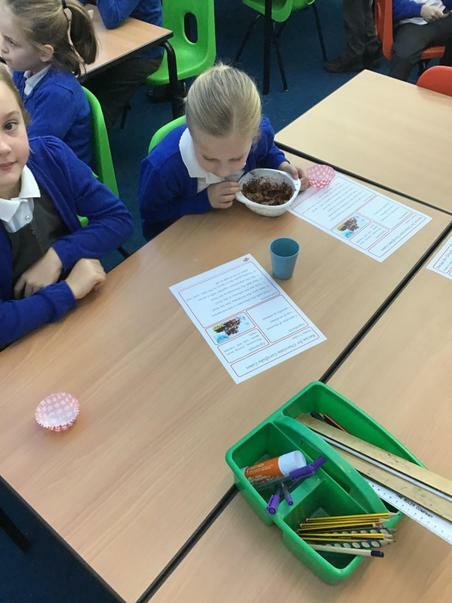 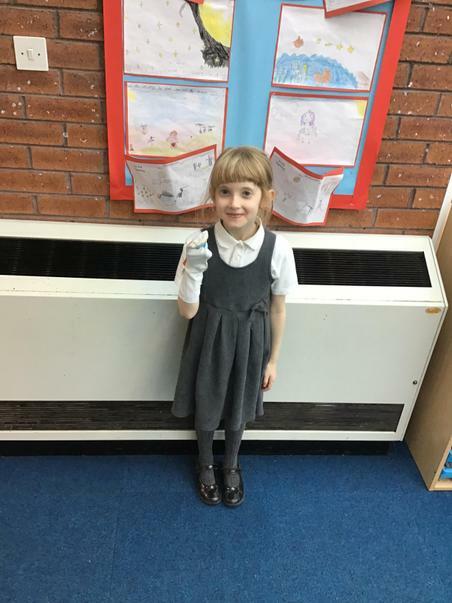 Miss Buckley will be returning to support us in Squirrel Class this term. 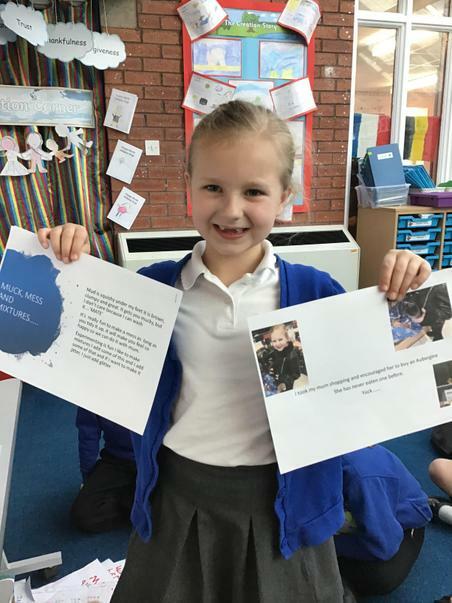 We are looking forward to her coming back. 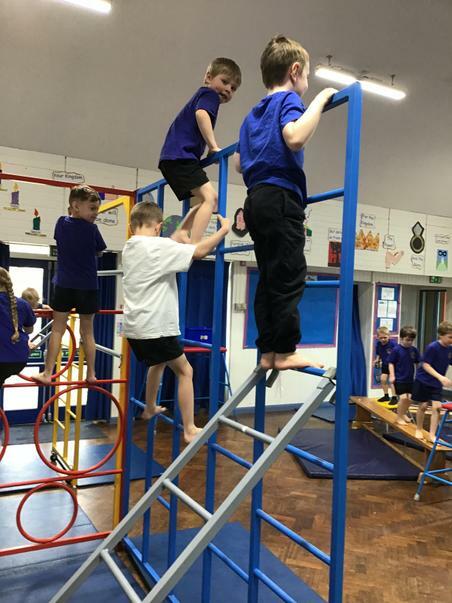 PE days will continue to be Monday and Wednesday this term, please ensure PE kits are in school each week and earrings are removed for PE days. 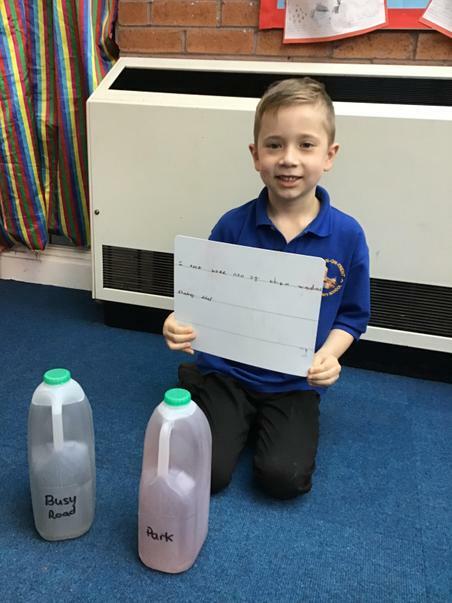 Spellings will continue to be tested on a Tuesday and new spellings will be given out weekly. 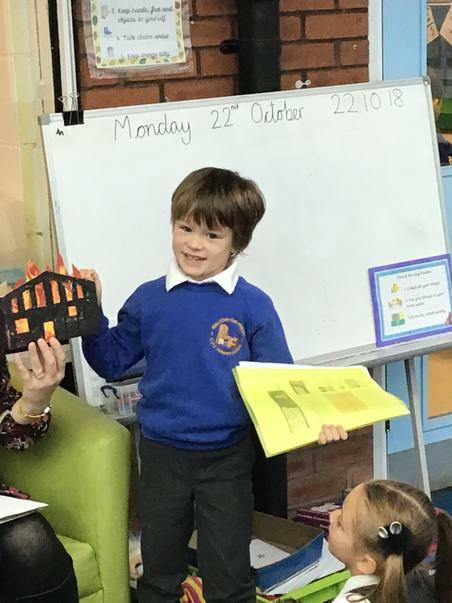 We will be checking reading records at the beginning of every week for Rainbow Readers so please continue to read every day with your child. 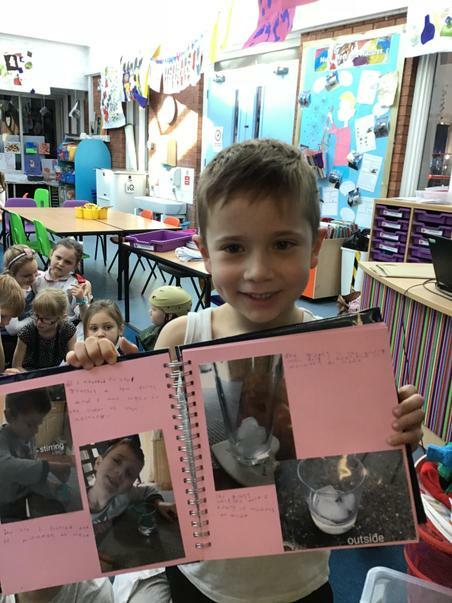 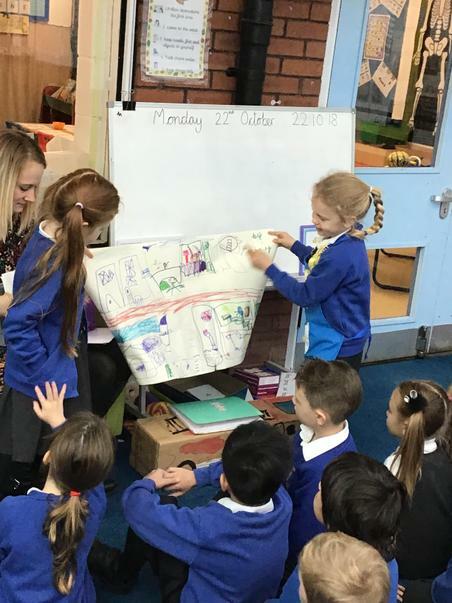 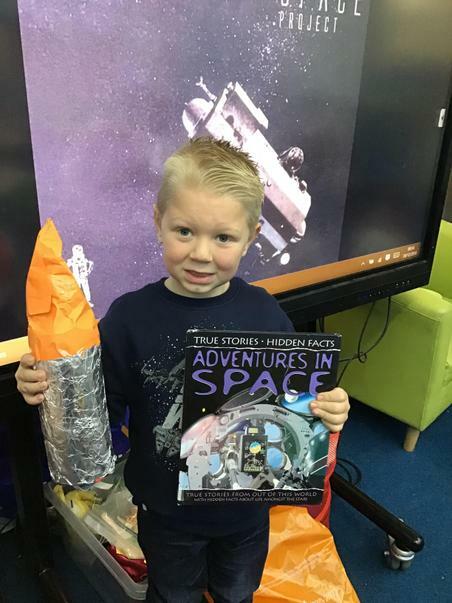 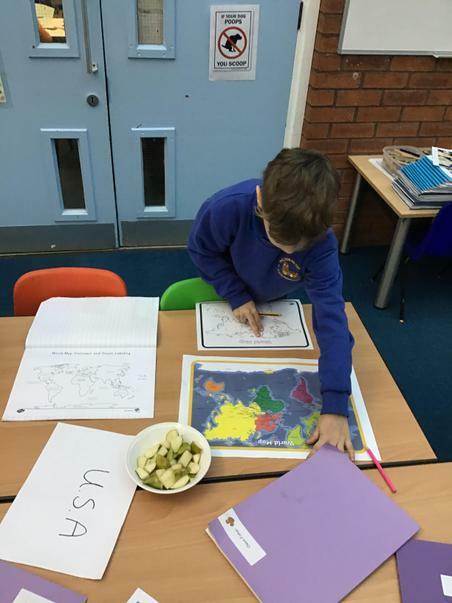 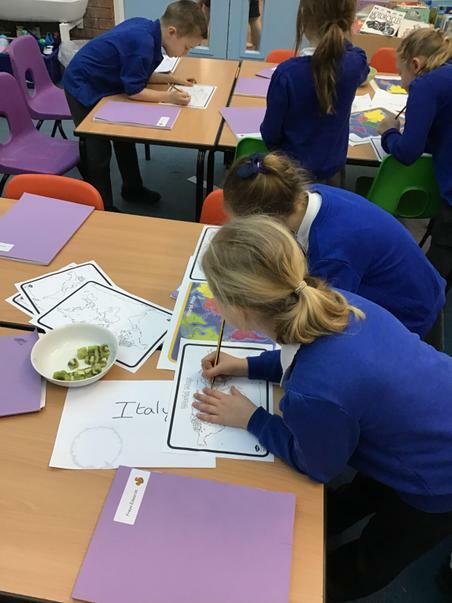 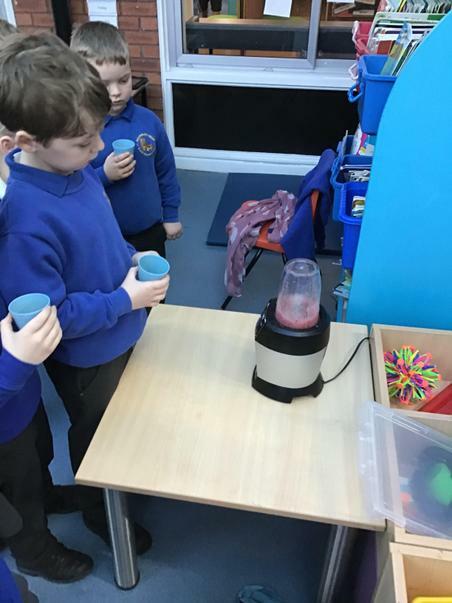 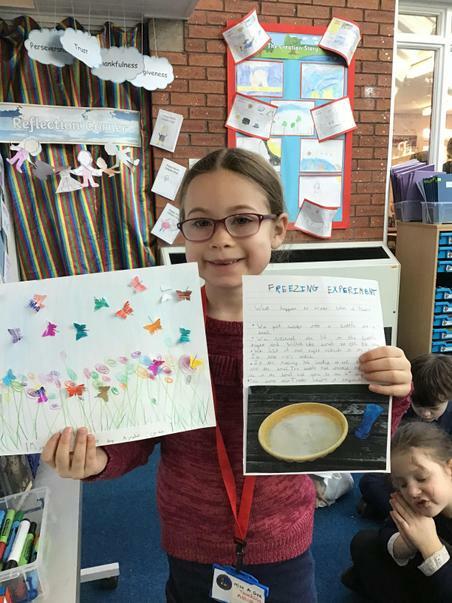 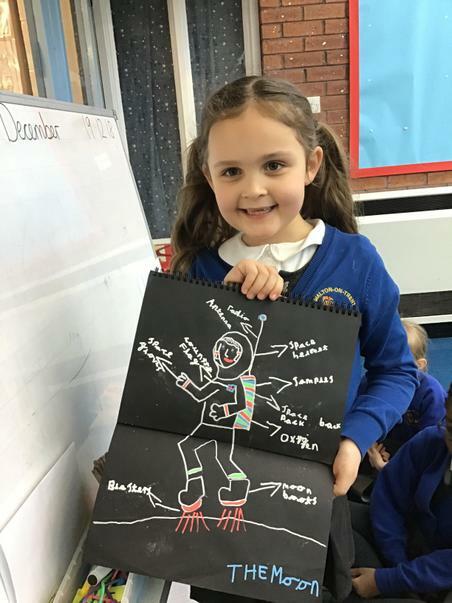 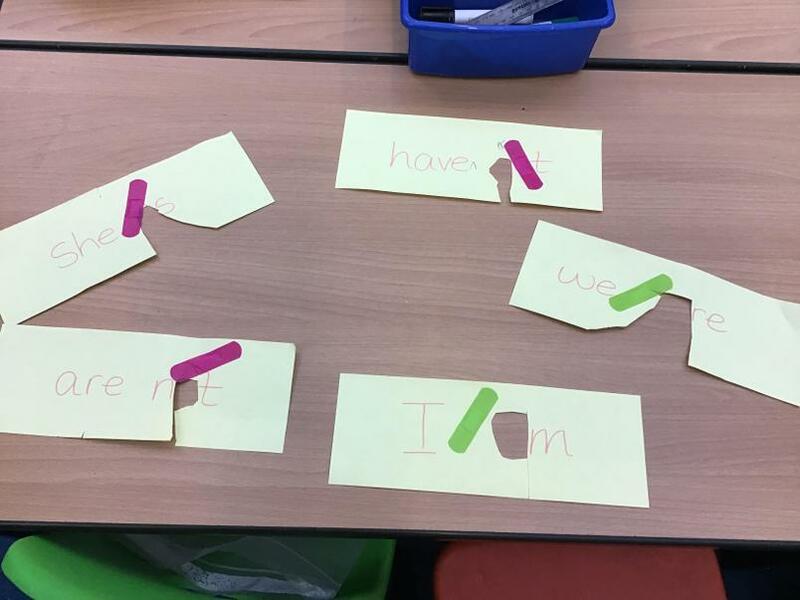 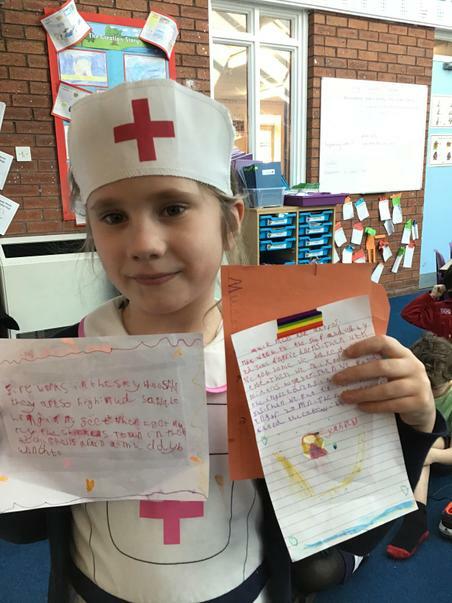 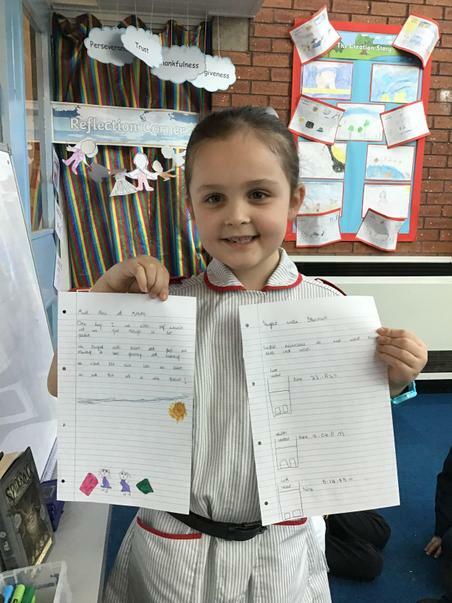 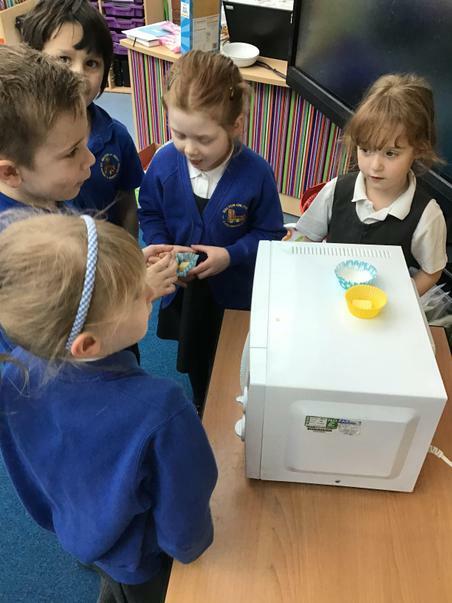 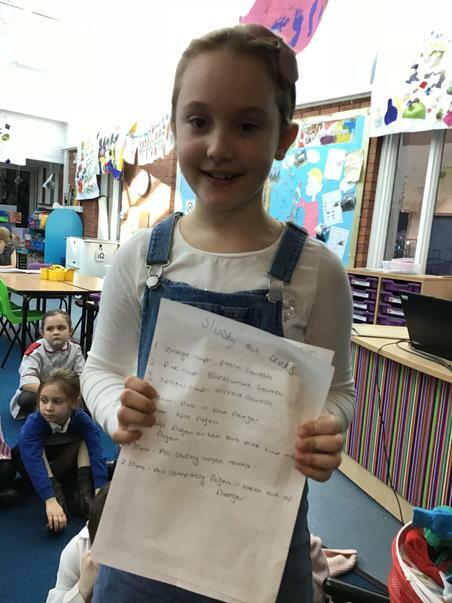 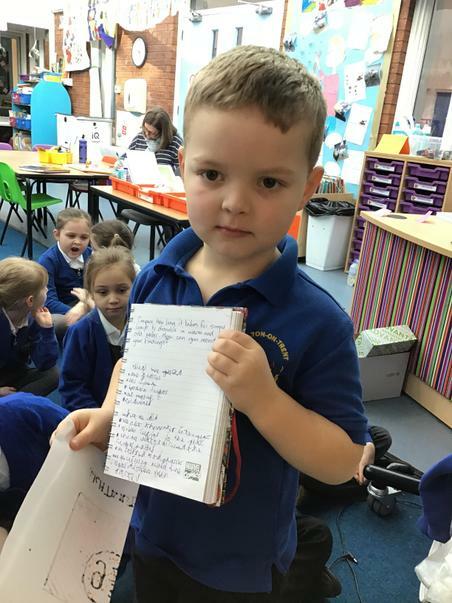 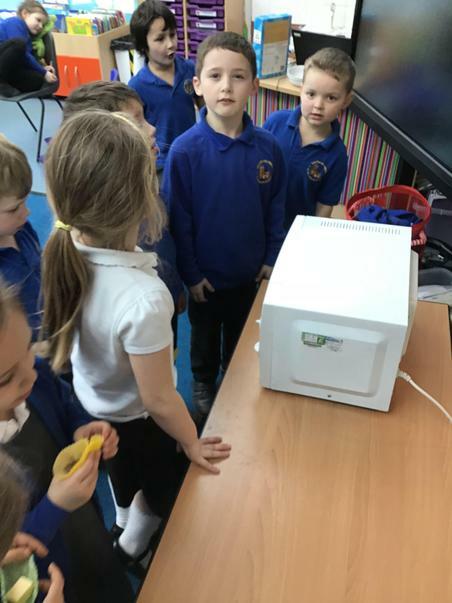 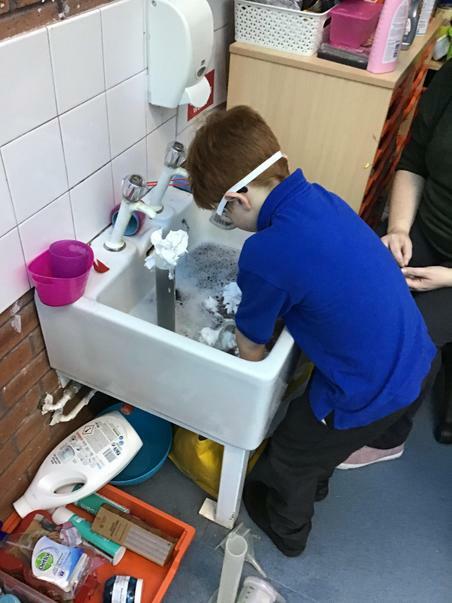 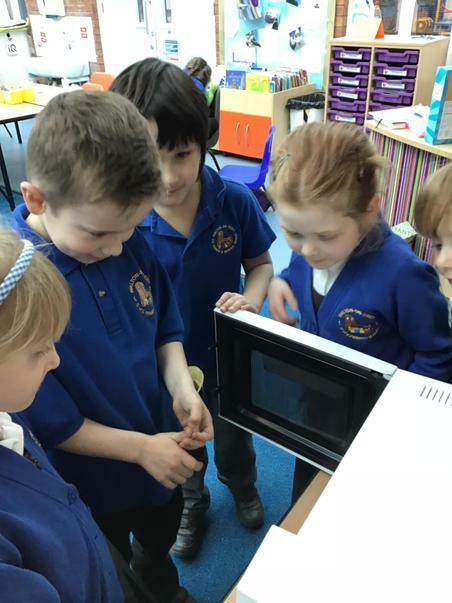 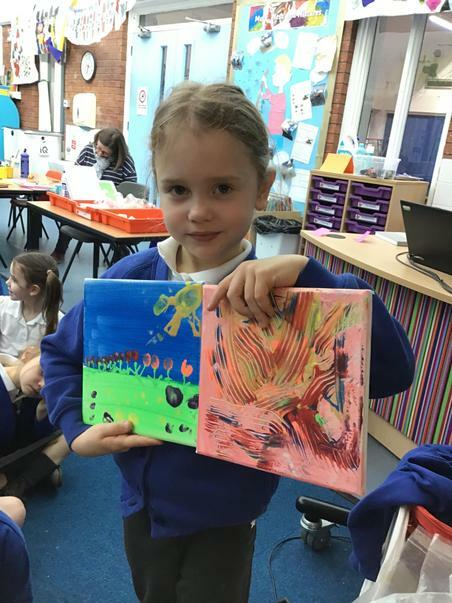 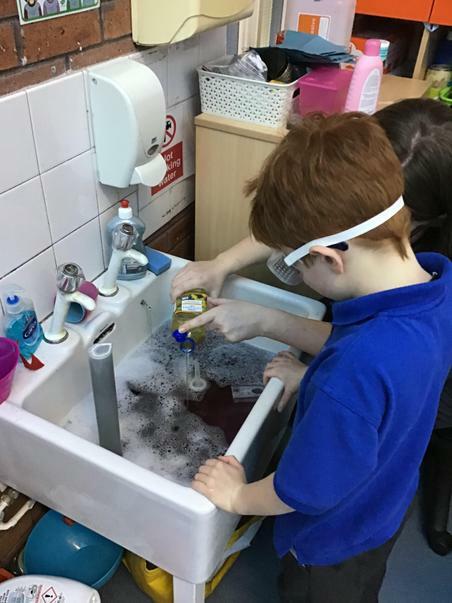 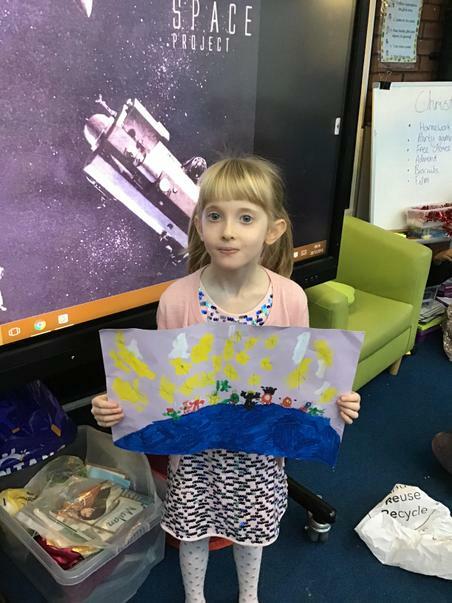 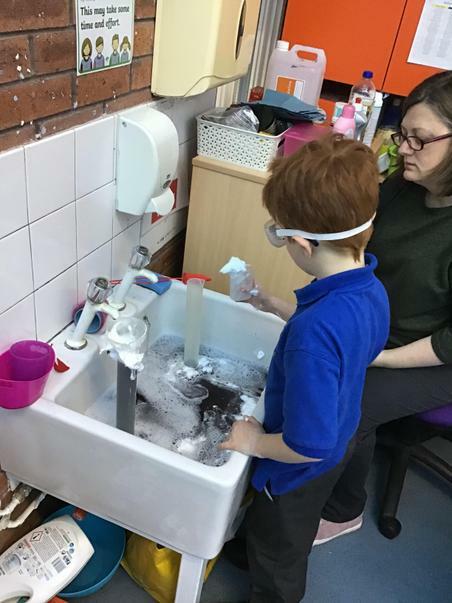 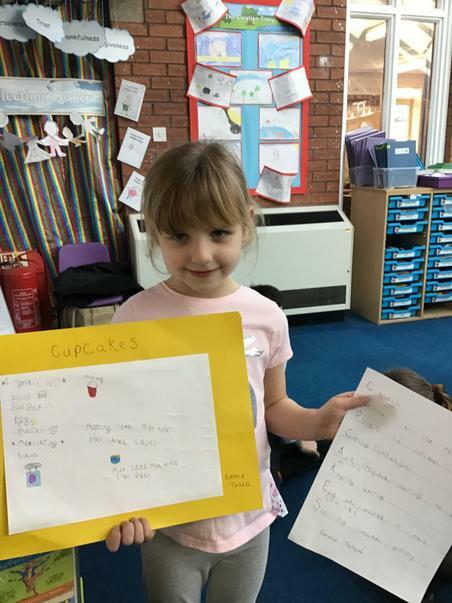 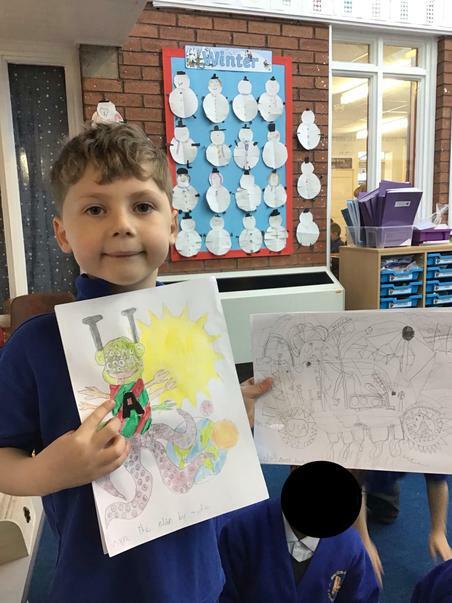 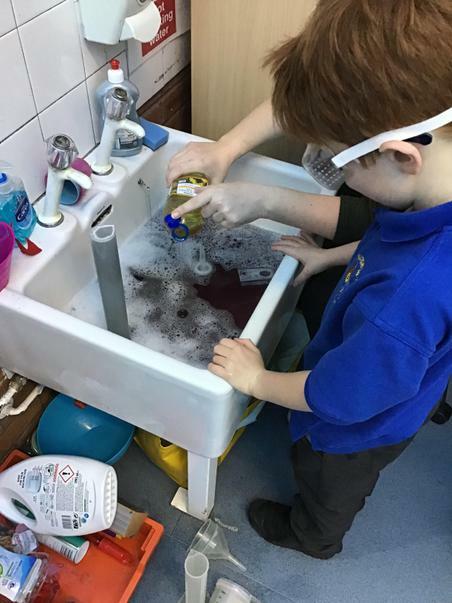 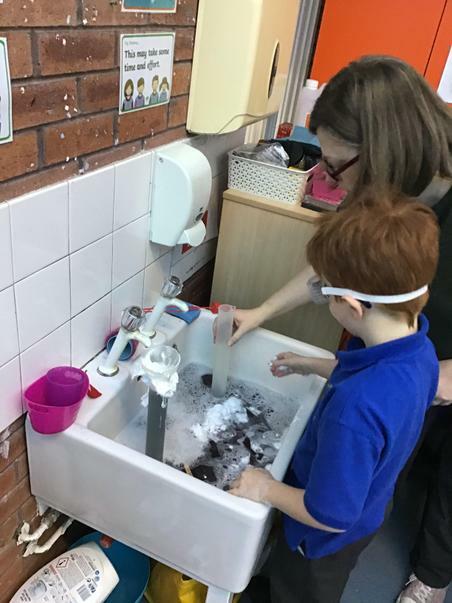 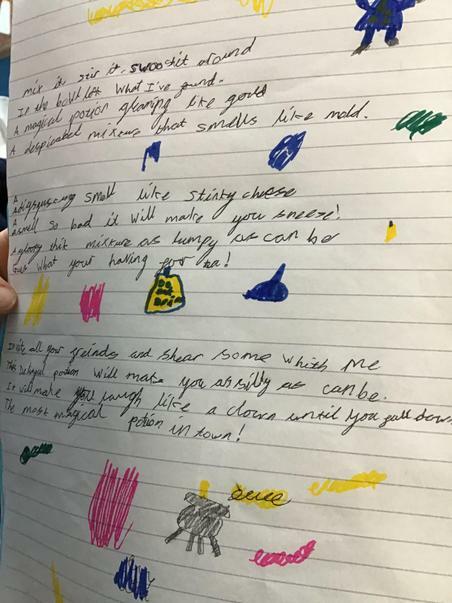 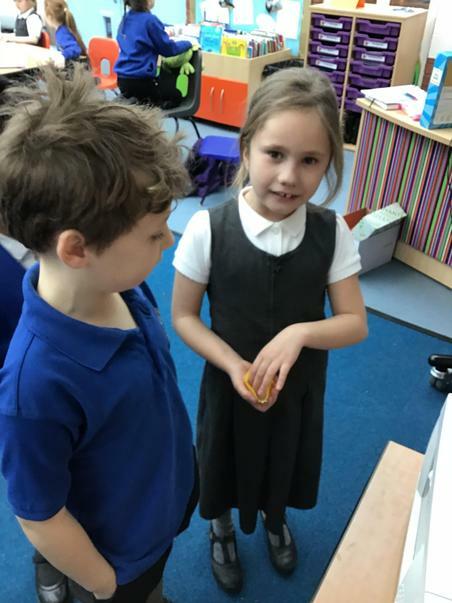 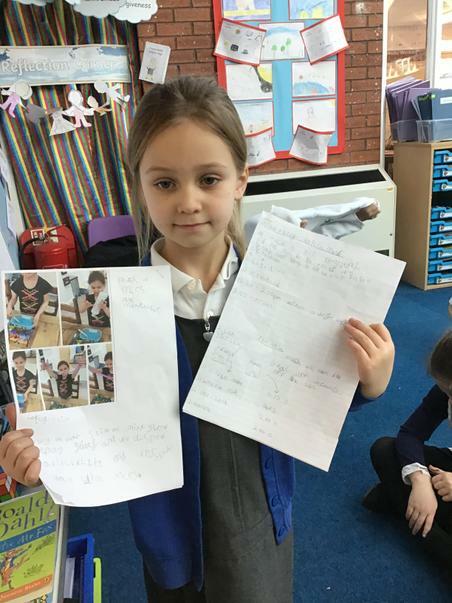 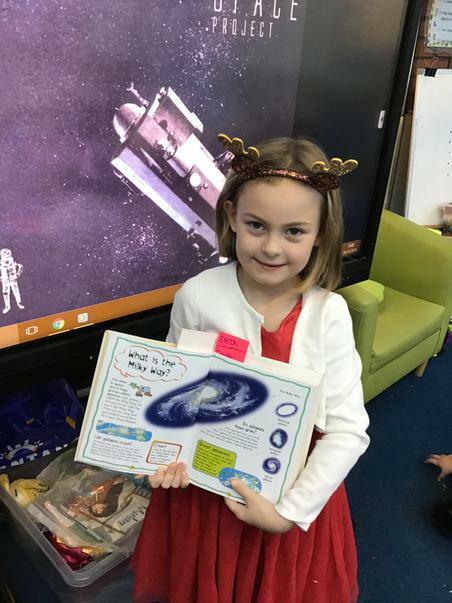 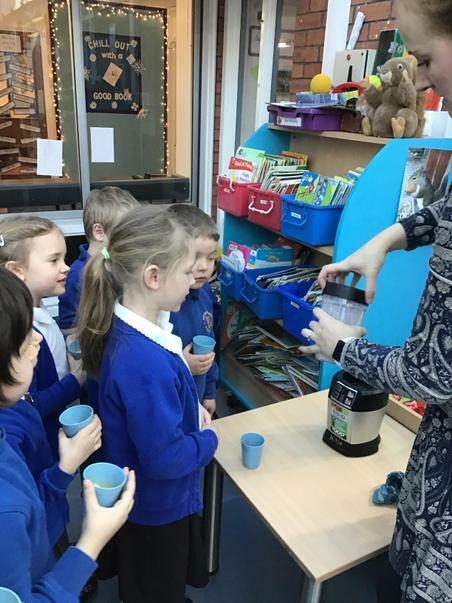 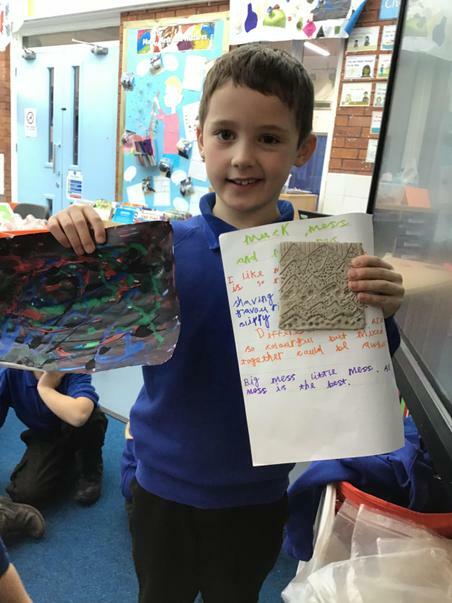 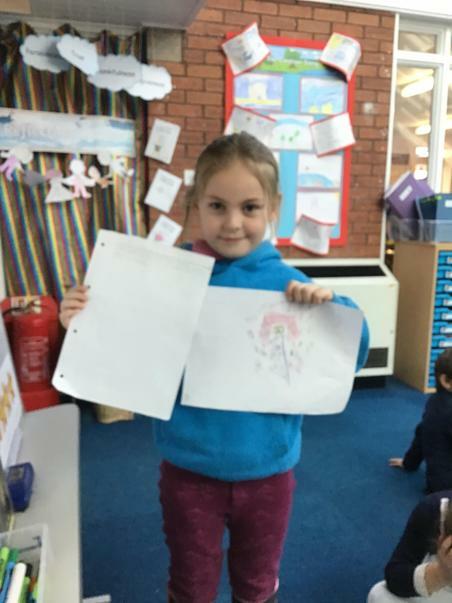 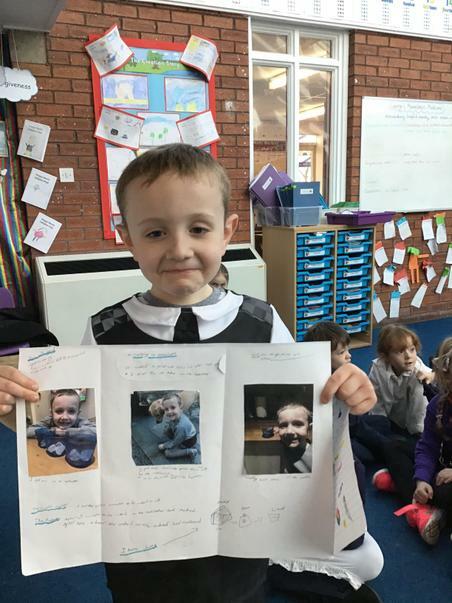 Children will be given the opportunity to change their books regularly in school, however children can also ask at any point to change their books. 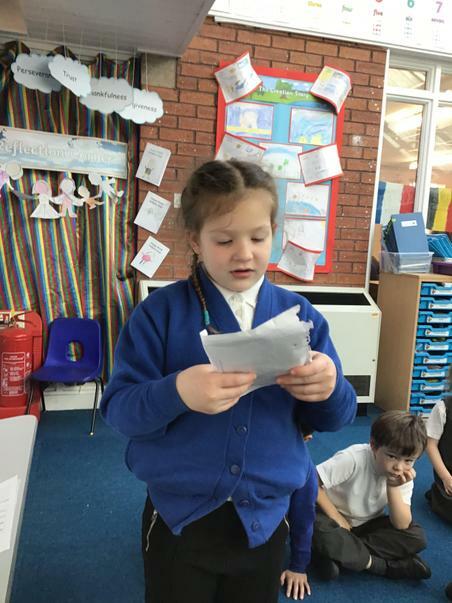 There is a Parent and Carer’s information sheet attached below with information about our new topic. 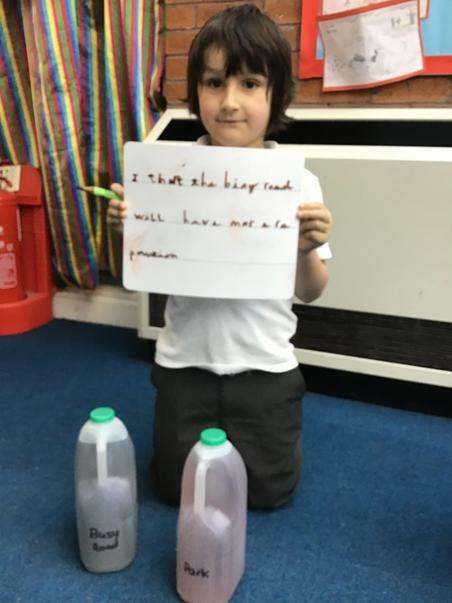 Home learning ideas are also attached below. 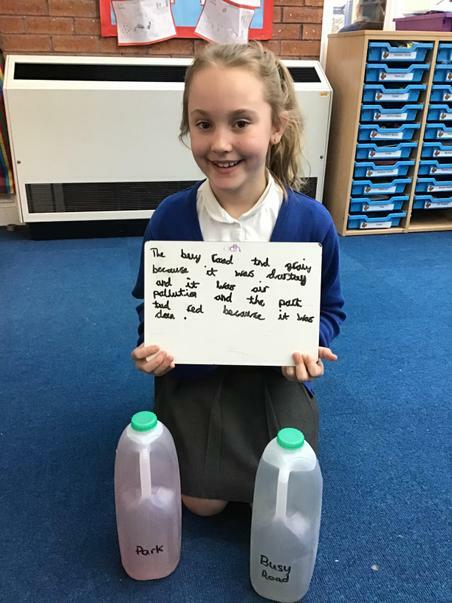 Please complete the highlighted home learning idea and then choose a further 3 ideas to complete. 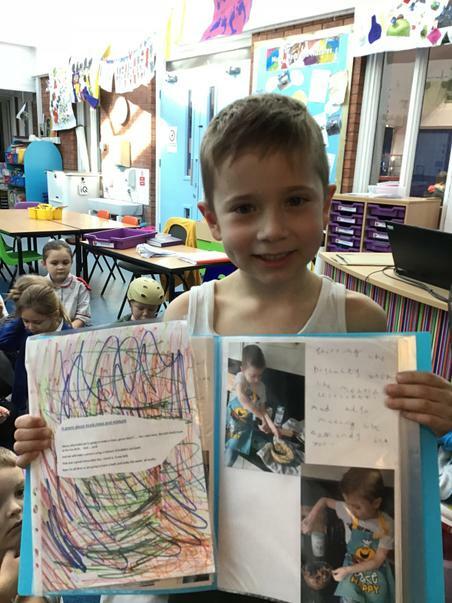 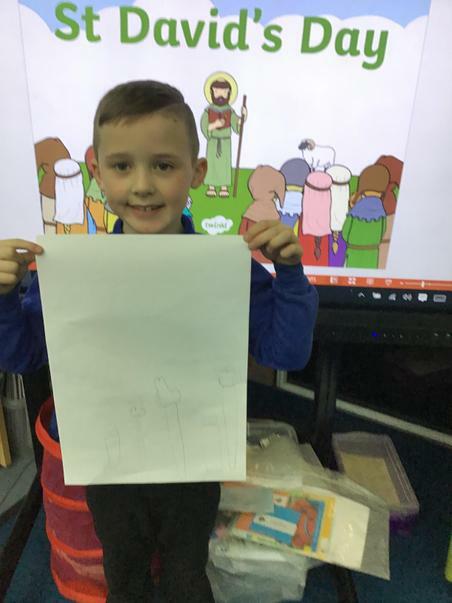 Completed homework is to be returned to school by Monday 8th April so we can share it as a class. 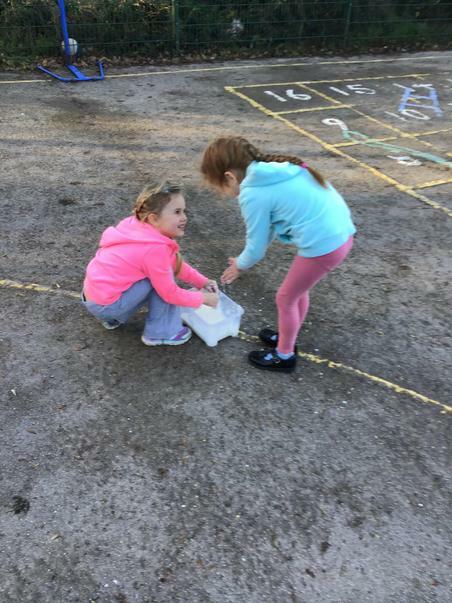 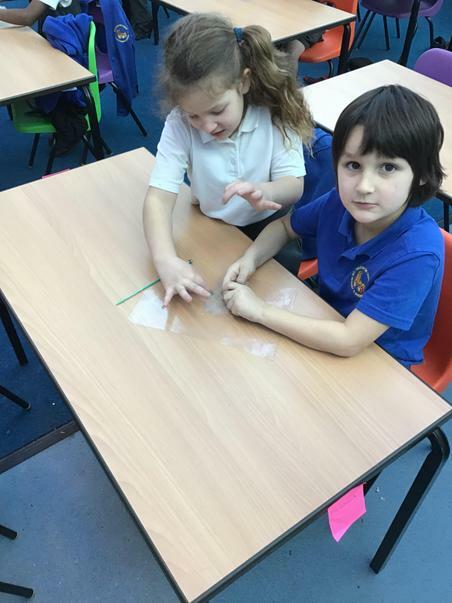 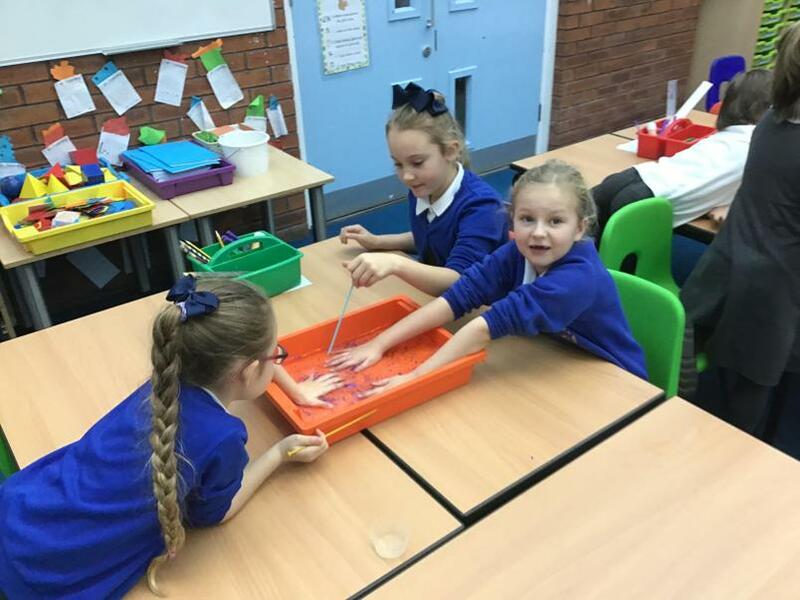 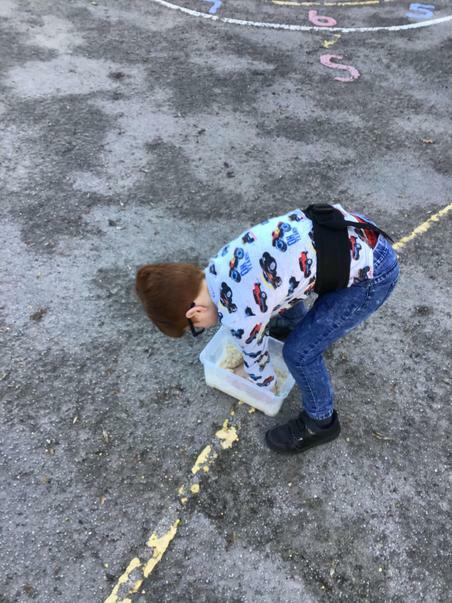 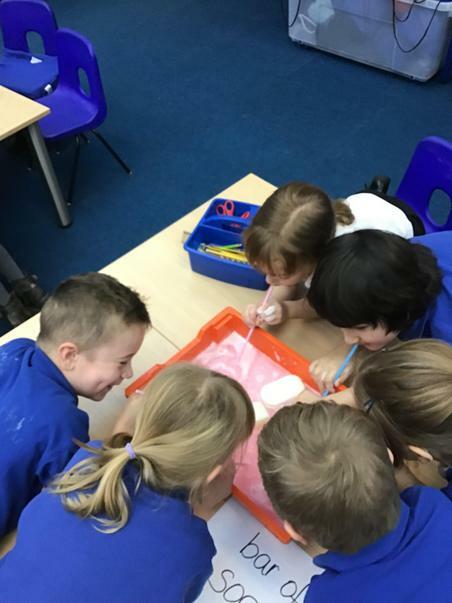 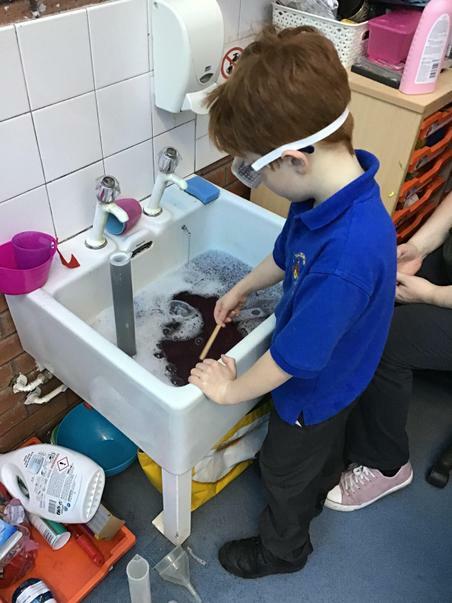 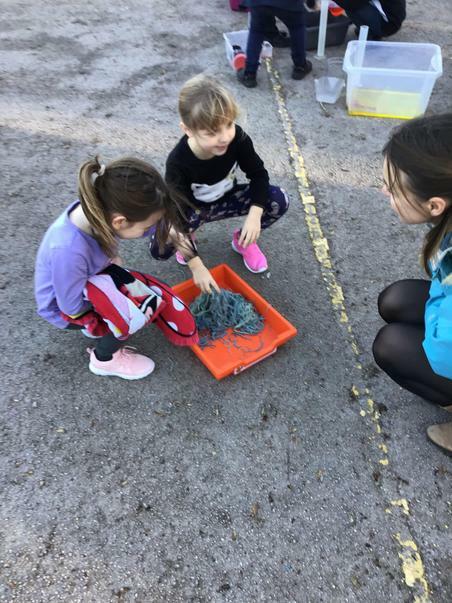 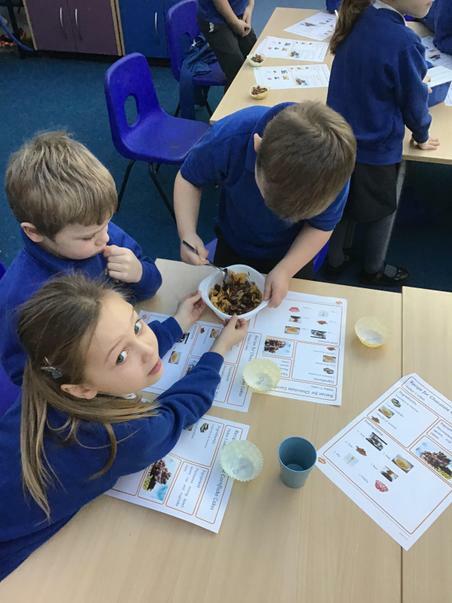 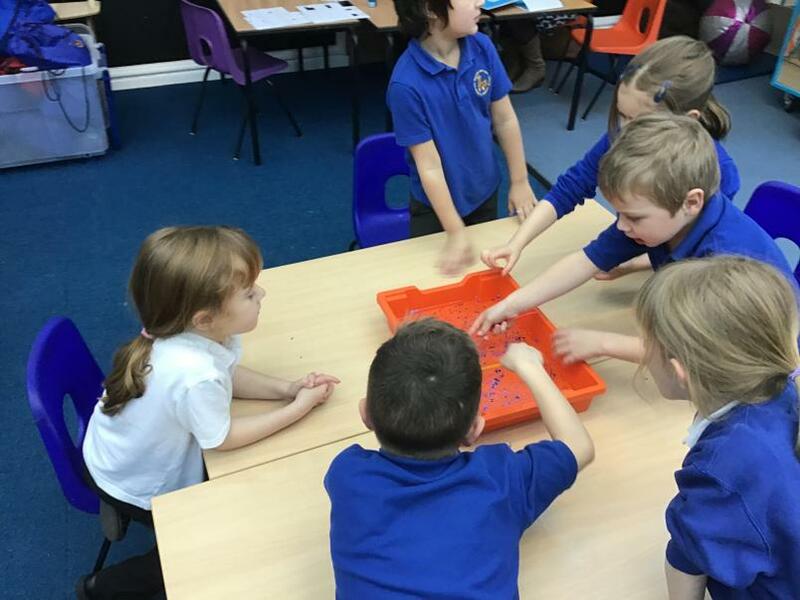 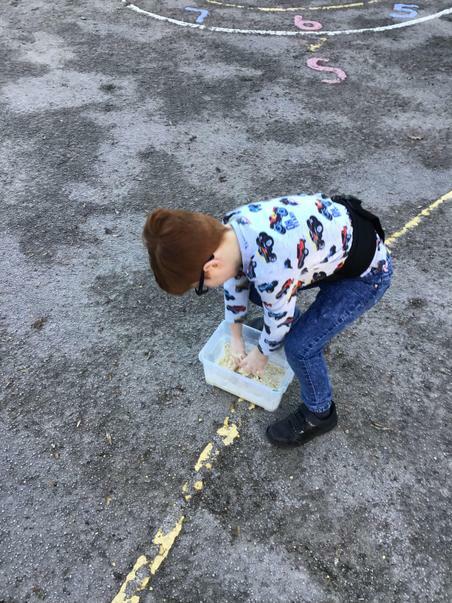 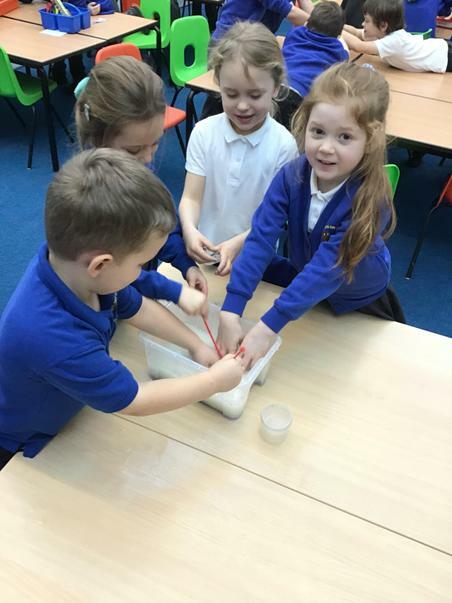 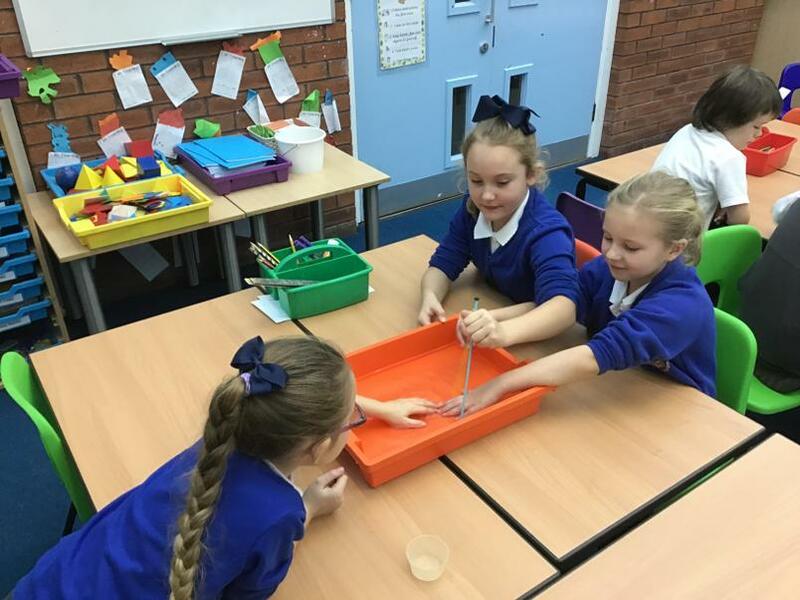 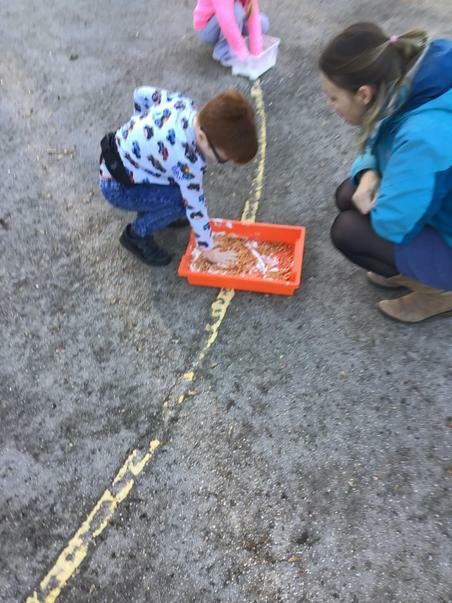 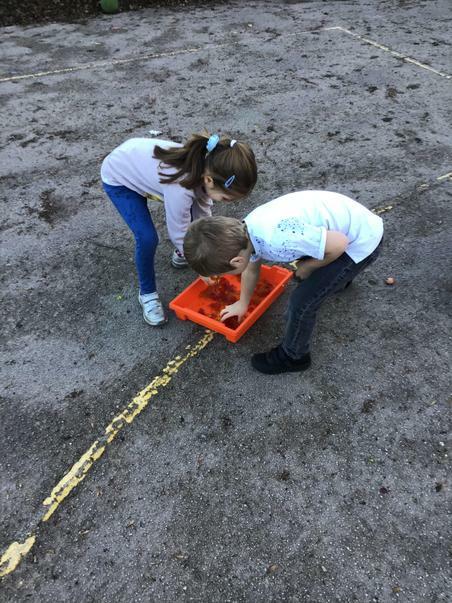 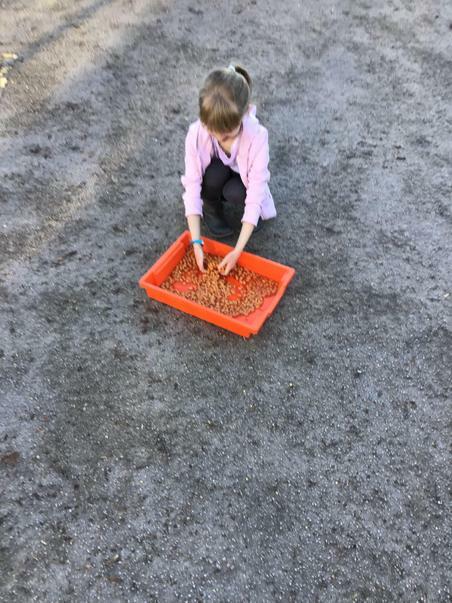 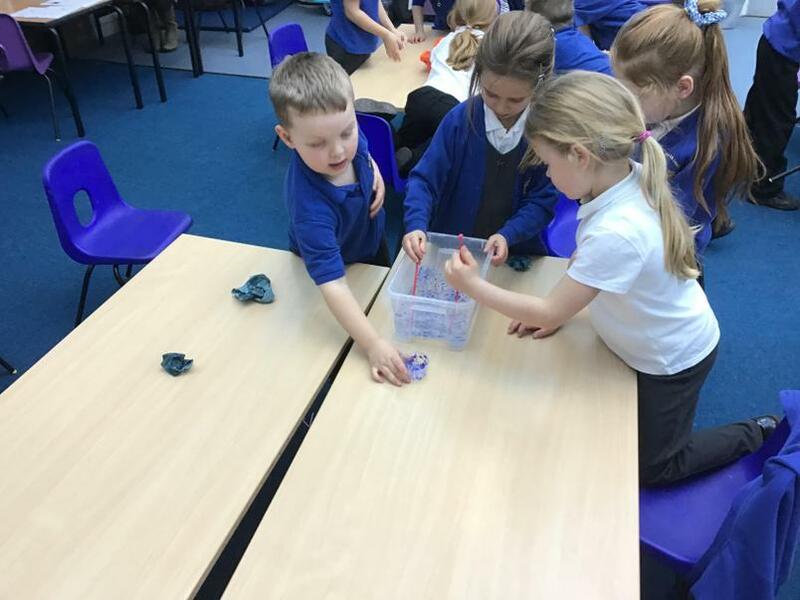 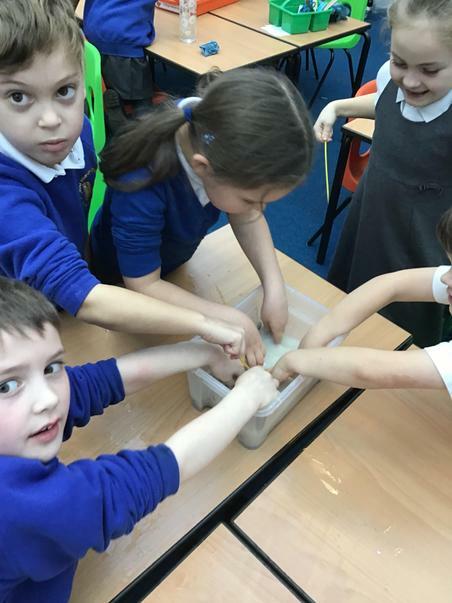 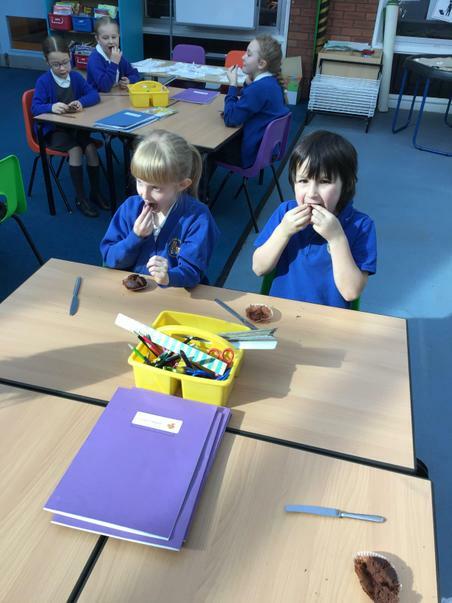 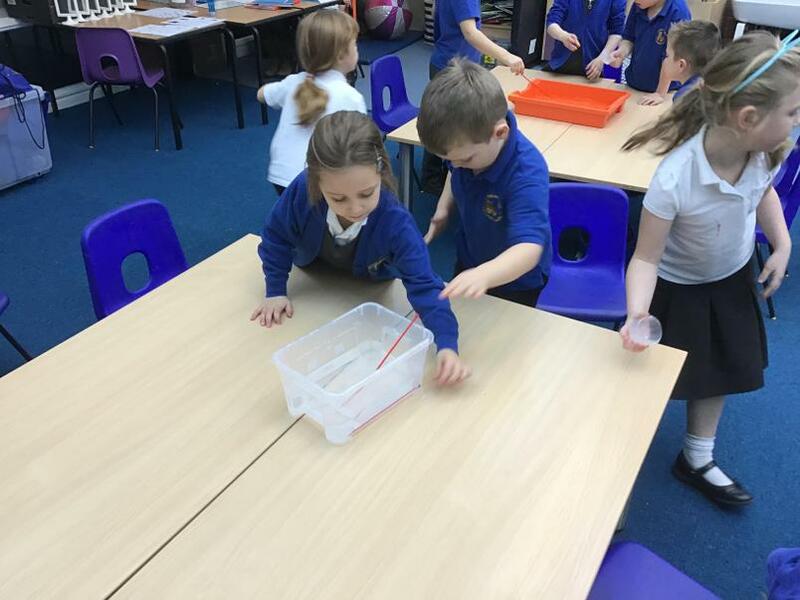 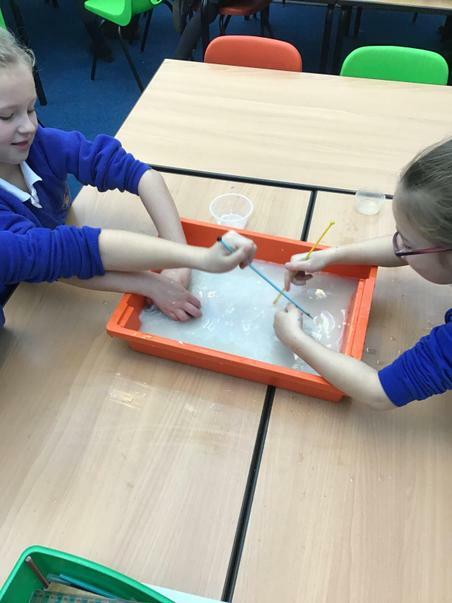 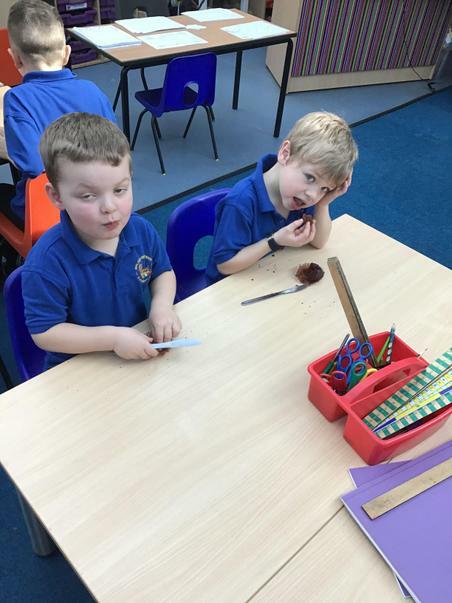 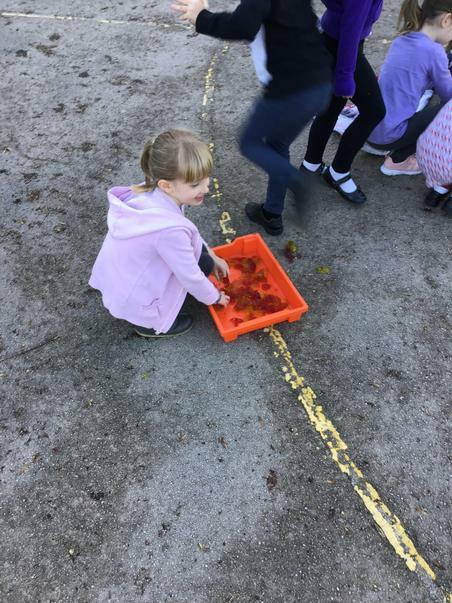 Muck, Mess and Mixtures - photographs of all the fun we had! 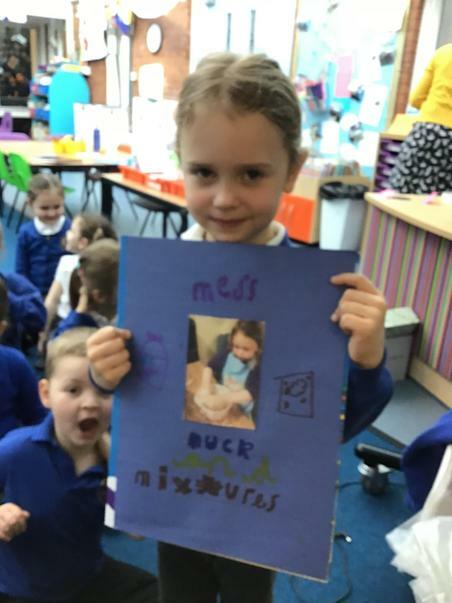 Our topic for Spring 1 term is Muck, Mess and Mixtures. 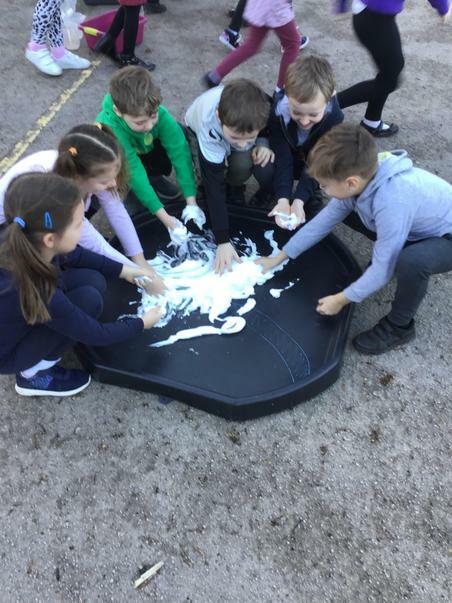 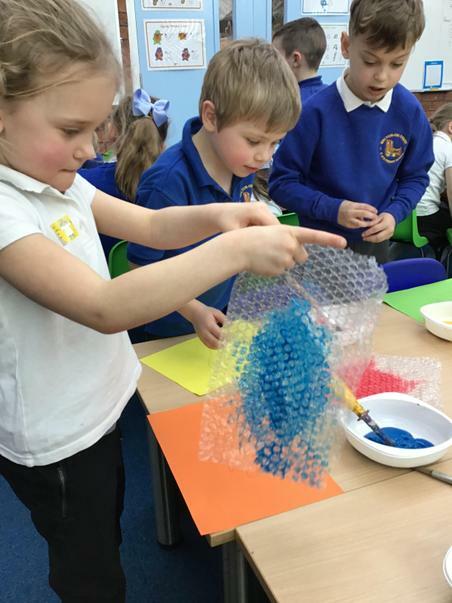 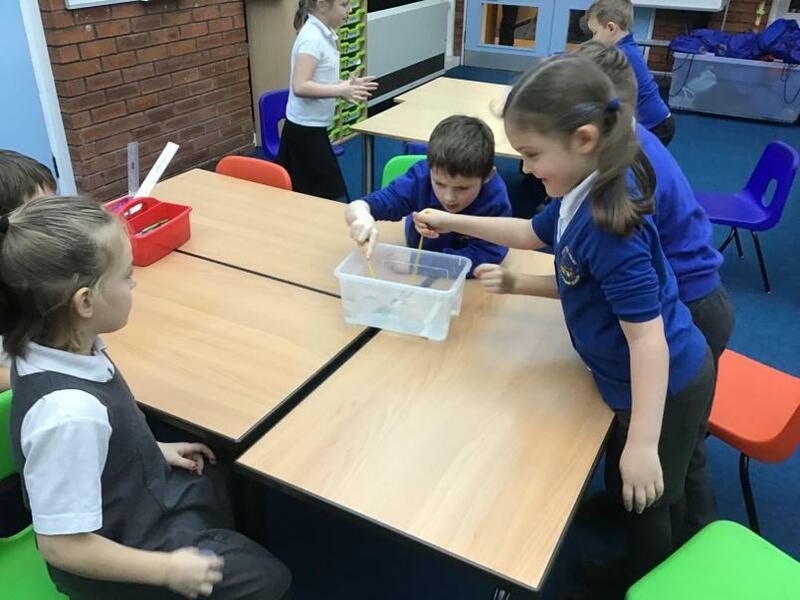 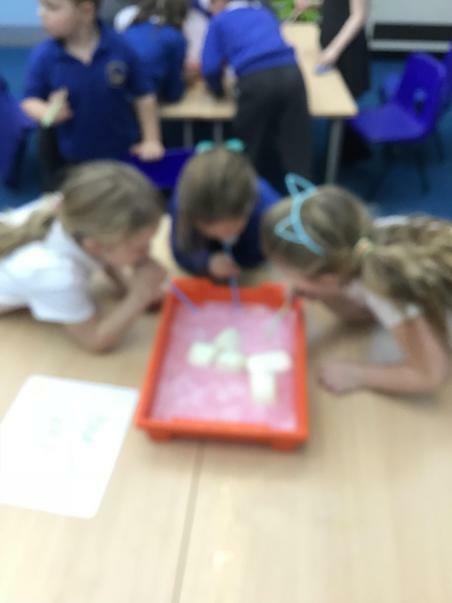 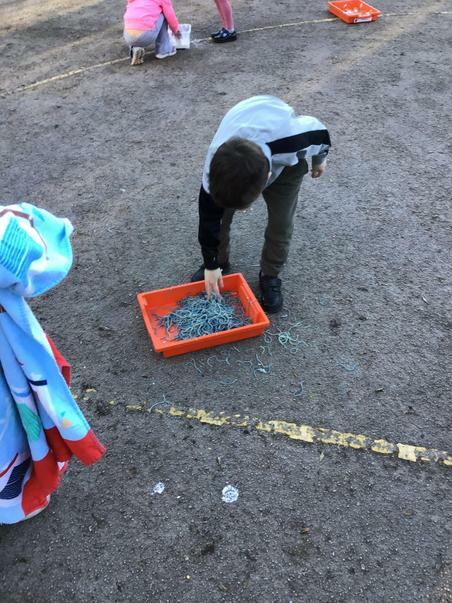 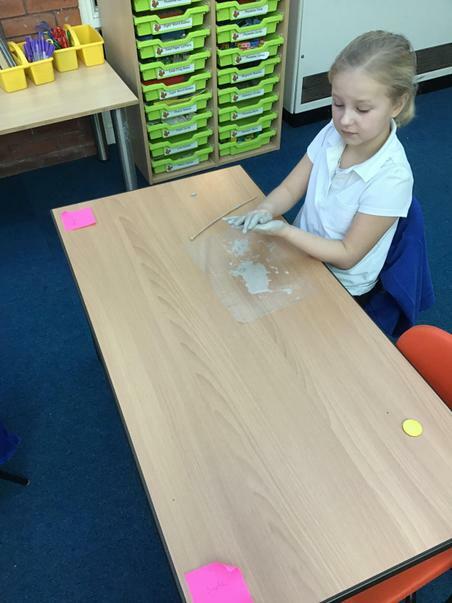 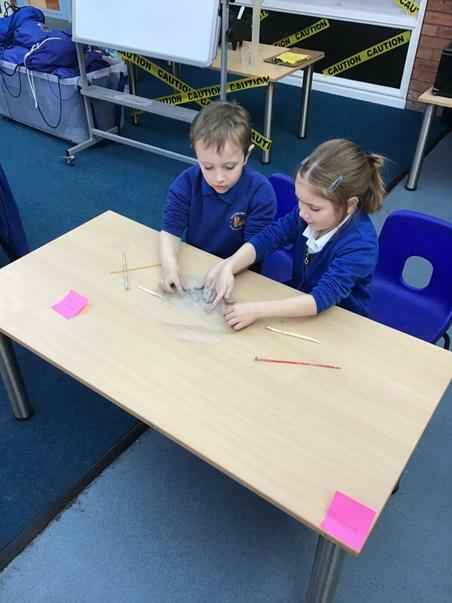 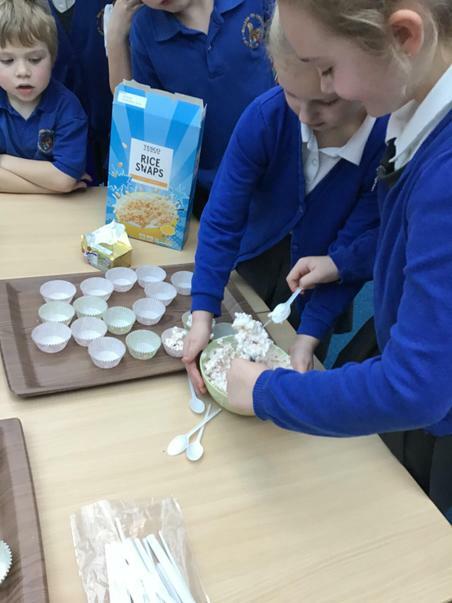 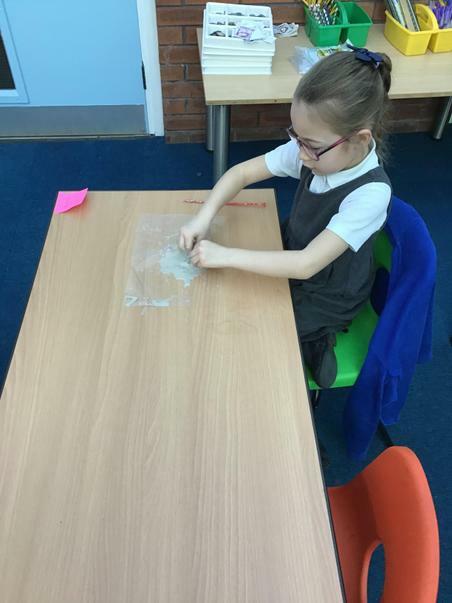 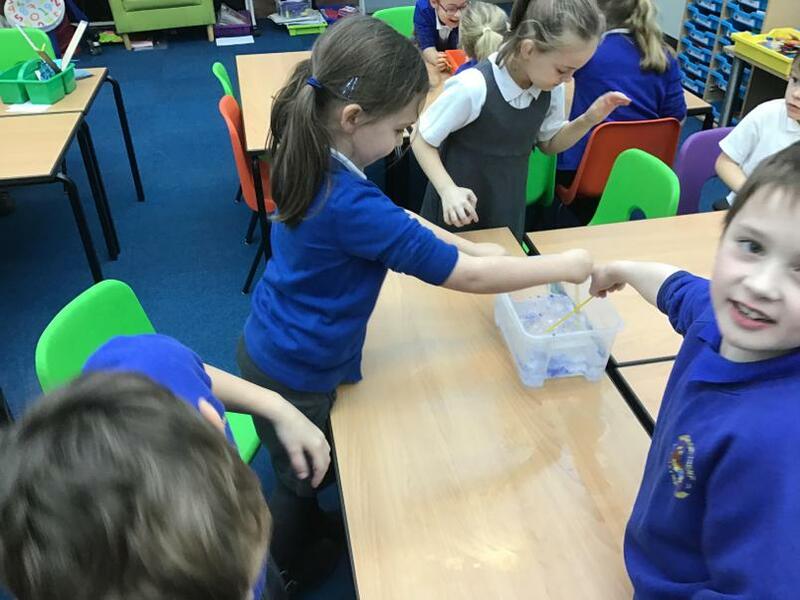 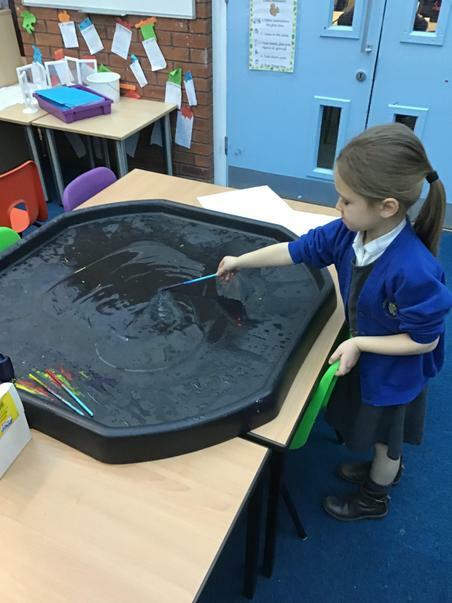 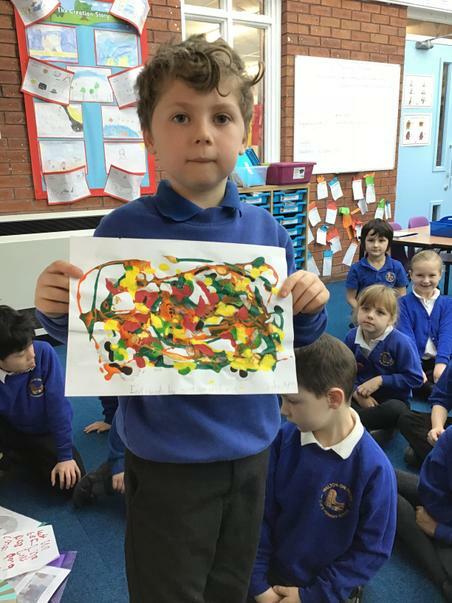 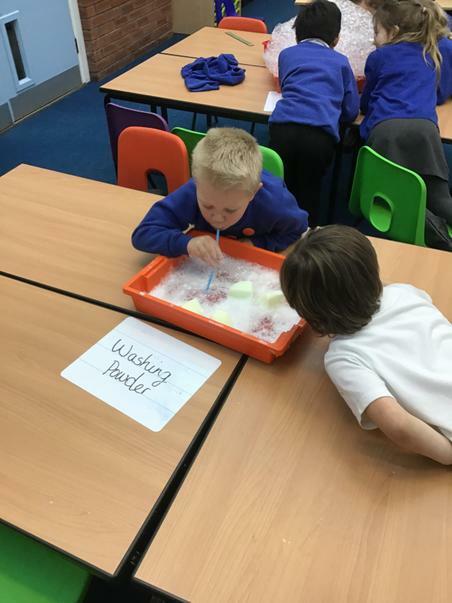 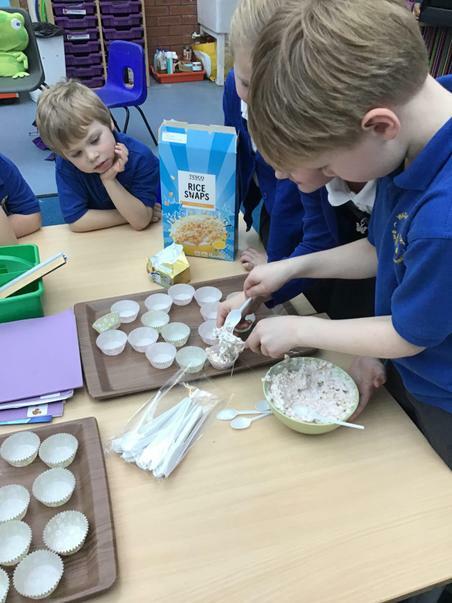 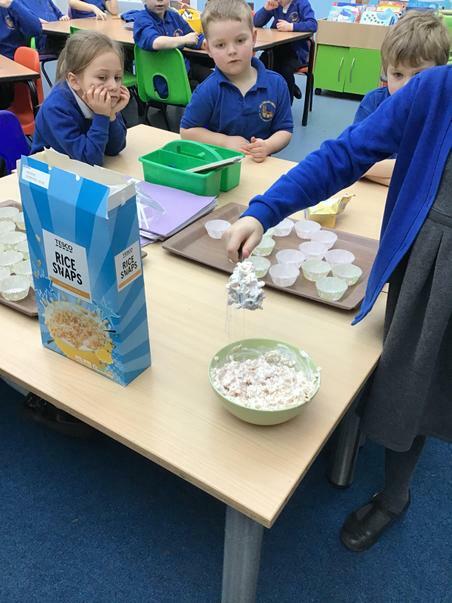 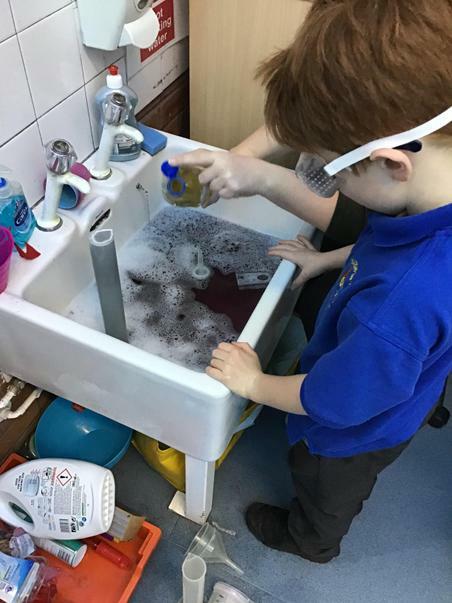 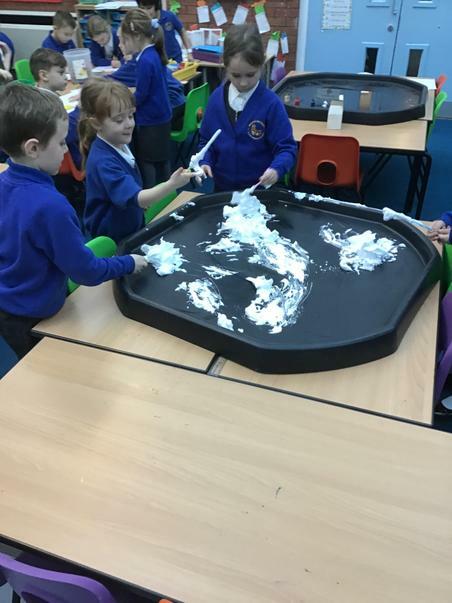 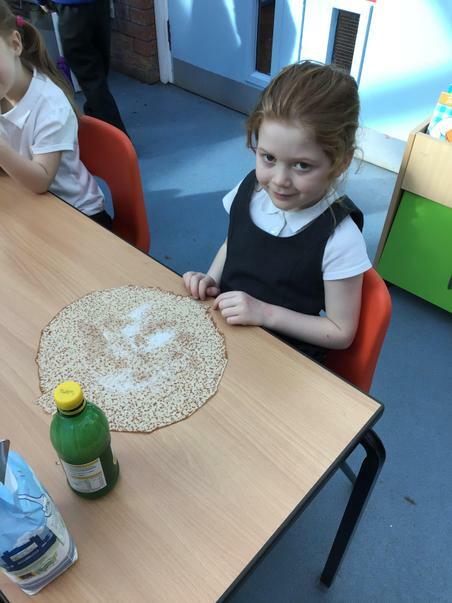 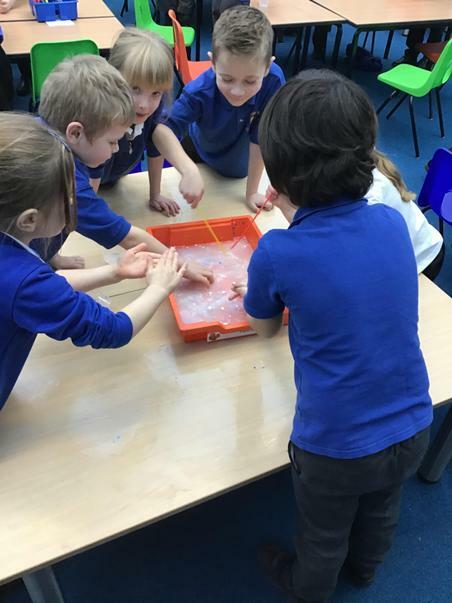 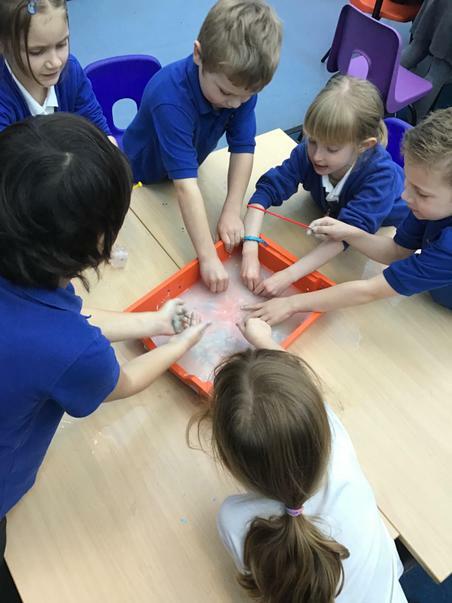 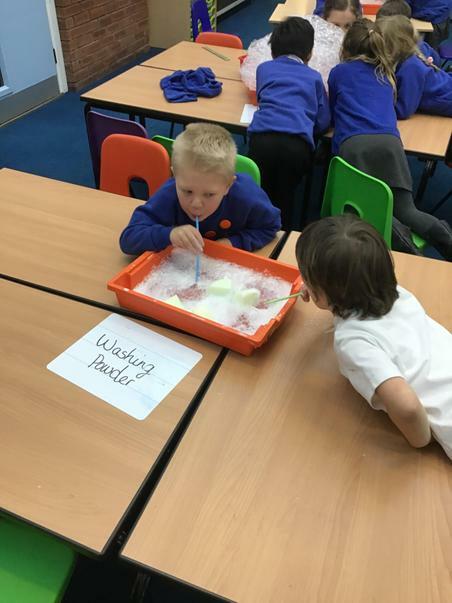 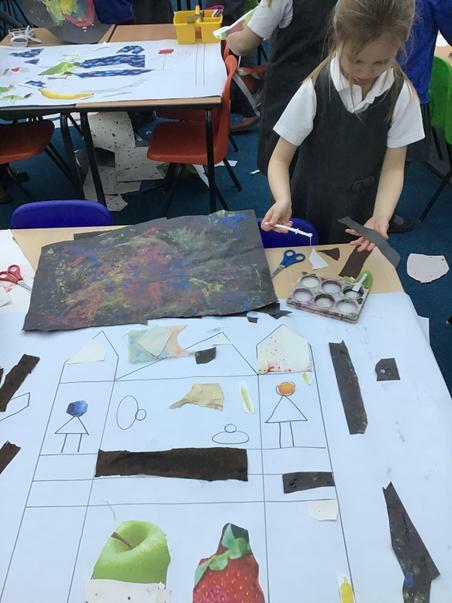 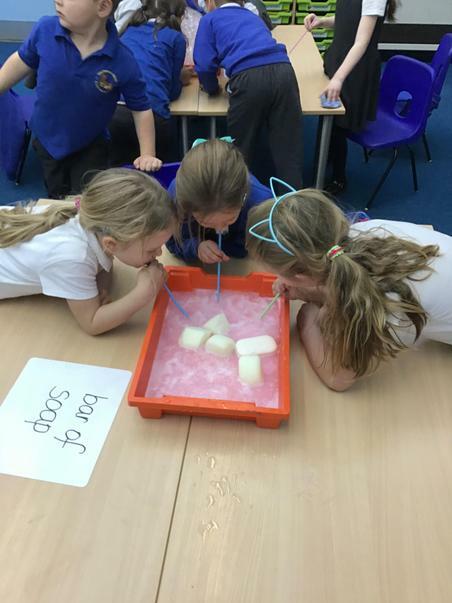 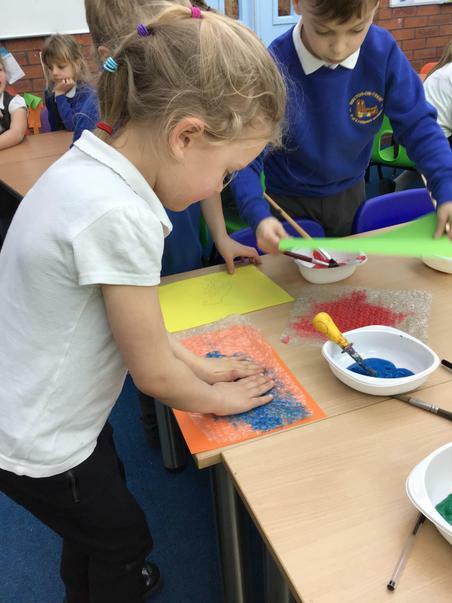 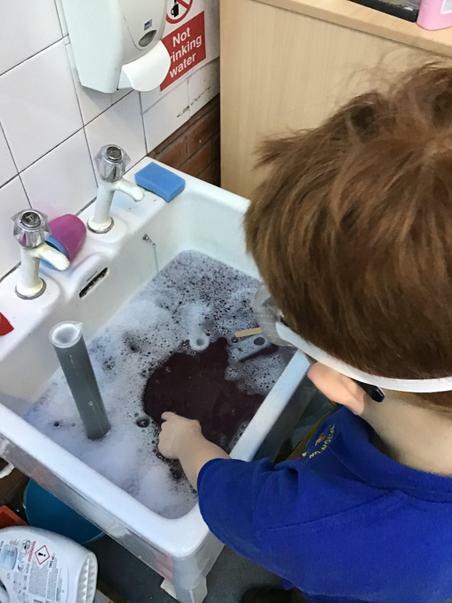 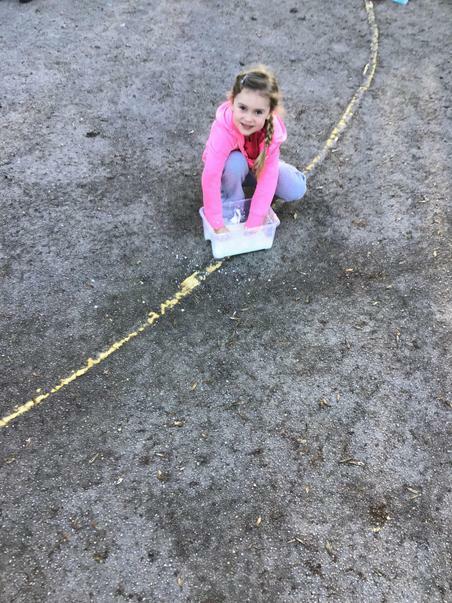 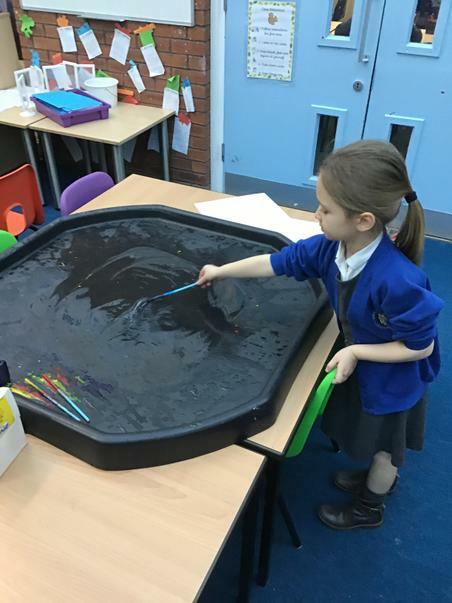 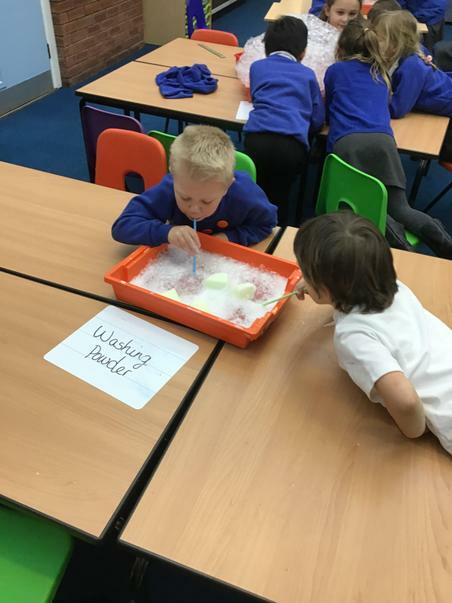 We are very excited about this topic and the children enjoyed a wonderful messy morning to launch the topic on our first day back. 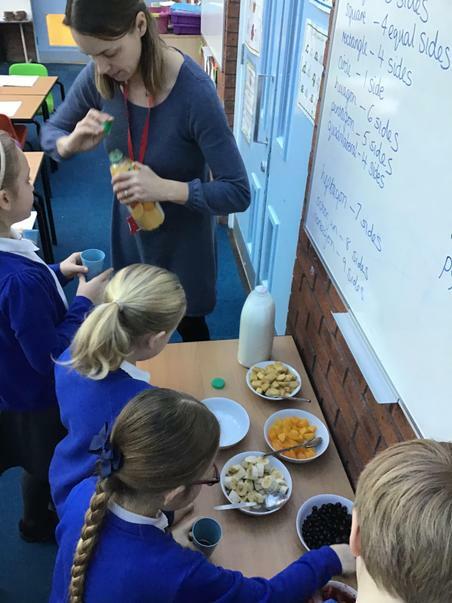 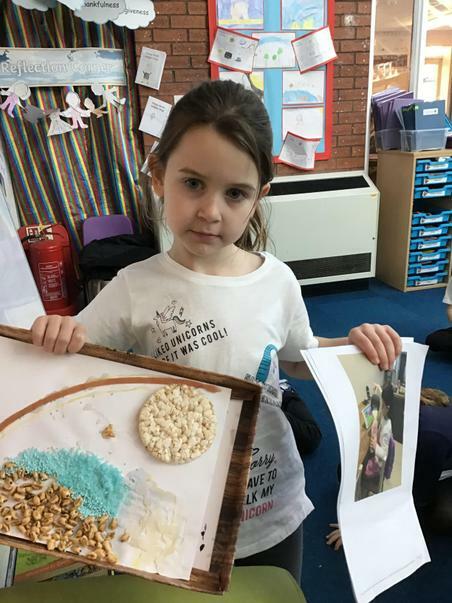 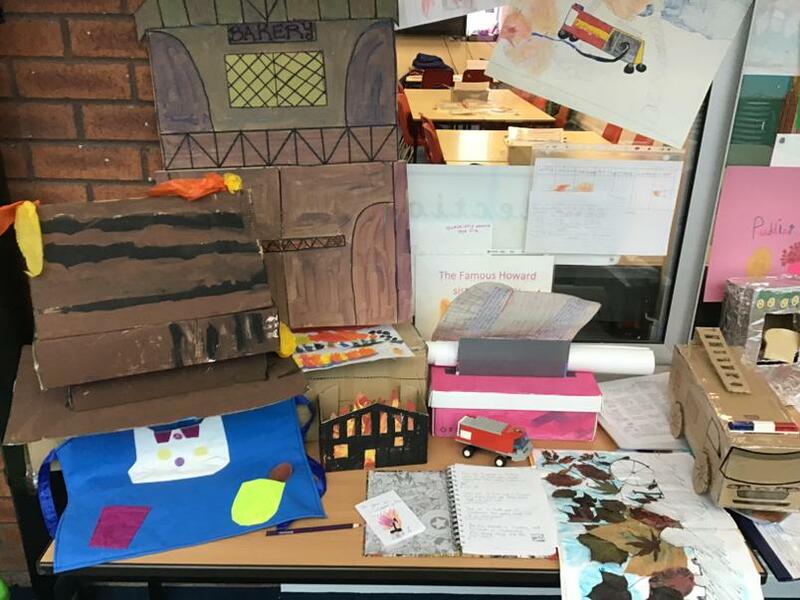 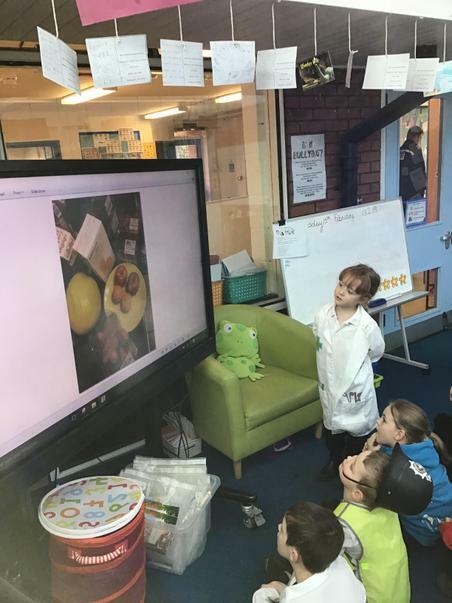 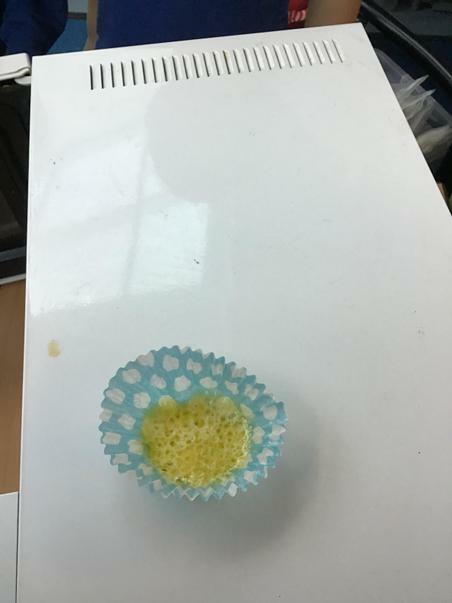 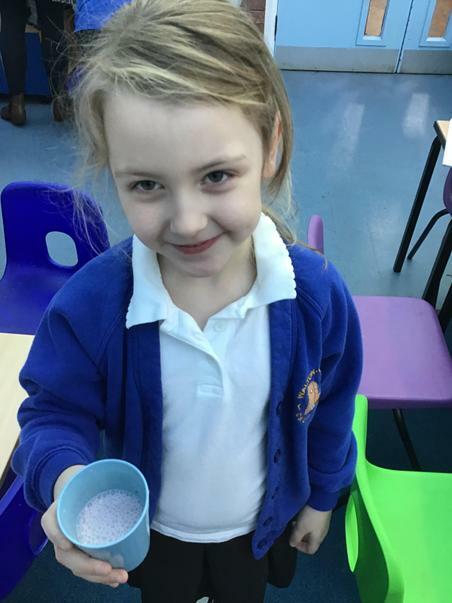 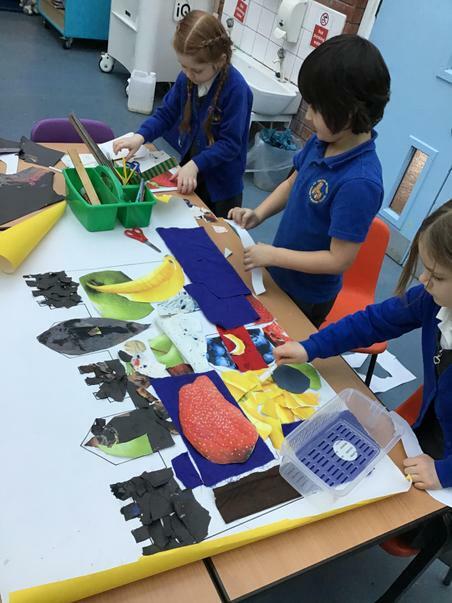 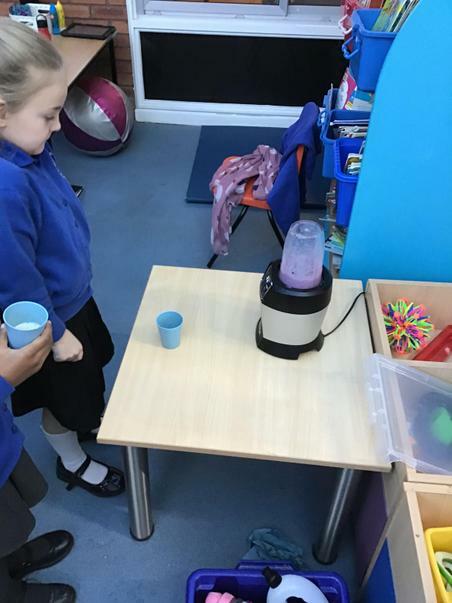 We will be learning all about everyday materials in Science, printing and collages in Art, food tasting and healthy eating in D&T, stop motion animations in Computing and lists, recipes, poetry, narrative and leaflets in English. 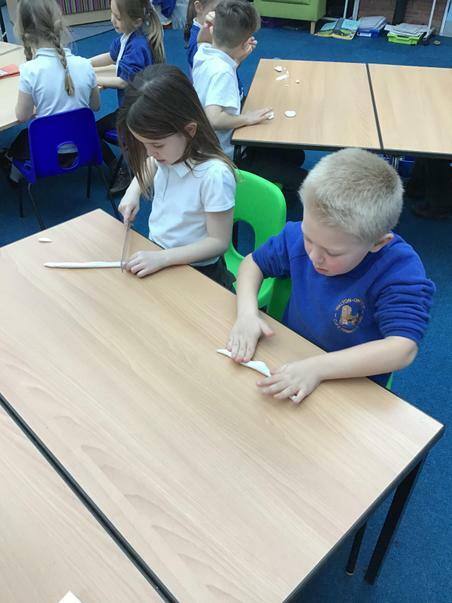 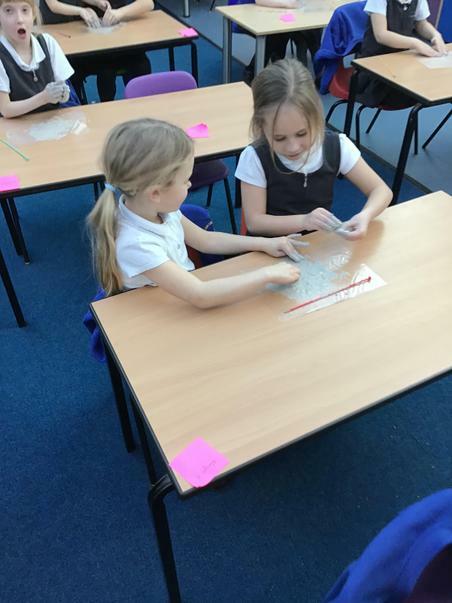 In Maths we will be focusing on shape, time and money. 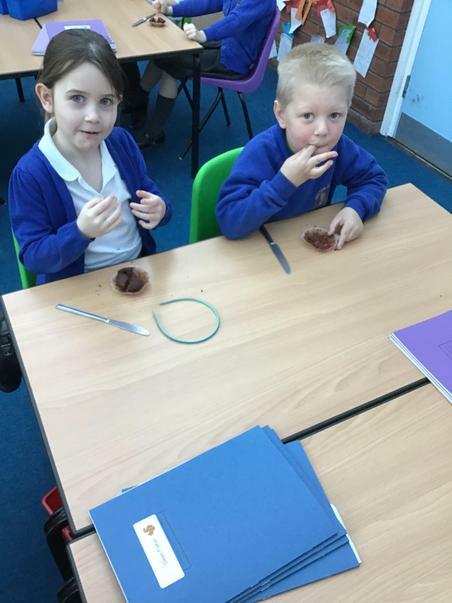 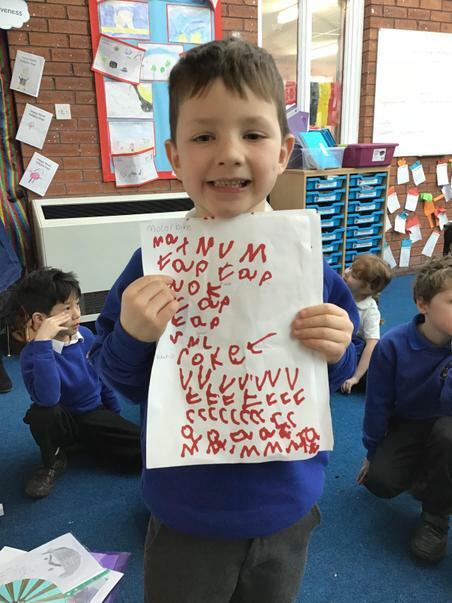 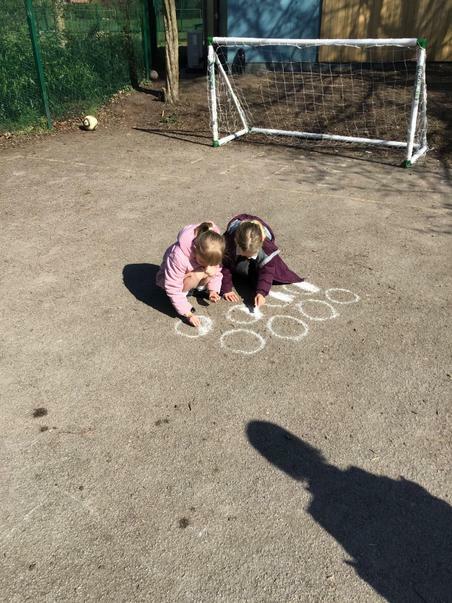 While Miss Buckley is completing a placement at another school we have Mrs Whitby supporting us in our class. 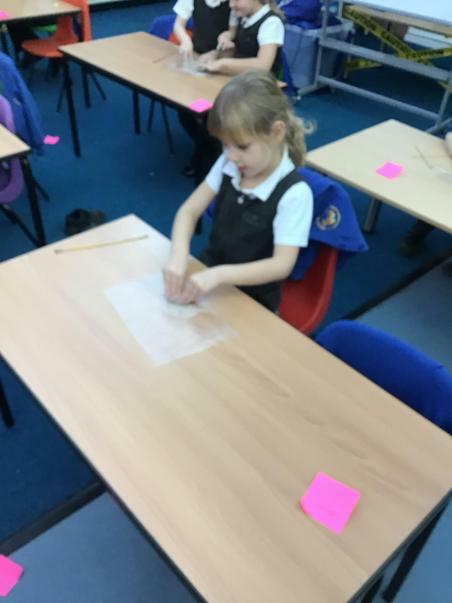 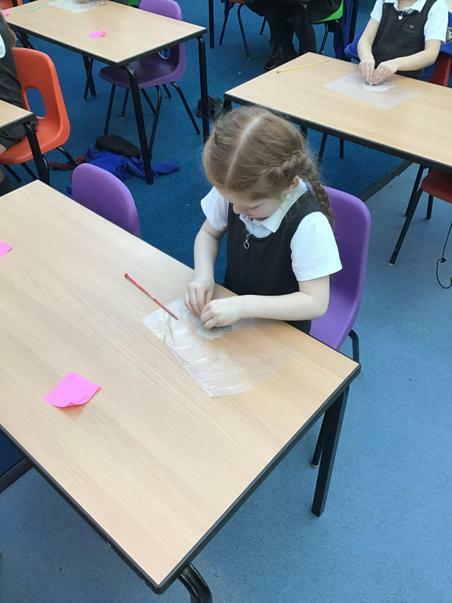 Mrs Whitby is also a School Direct Teaching Student and she is very excited to be working with us in Squirrel Class. 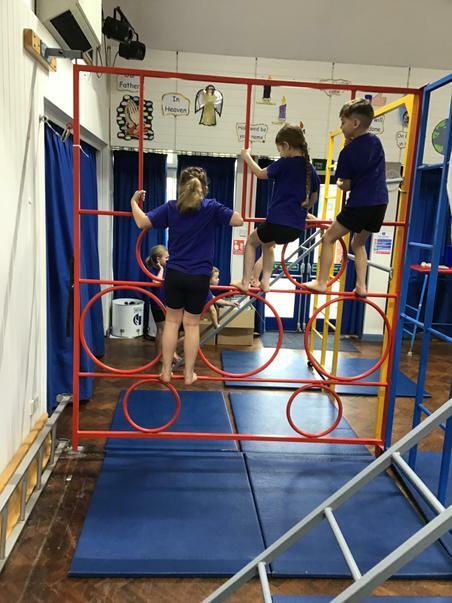 PE days this term will be a Monday and a Wednesday, please ensure PE kits are in school each week and earrings are removed for PE days. 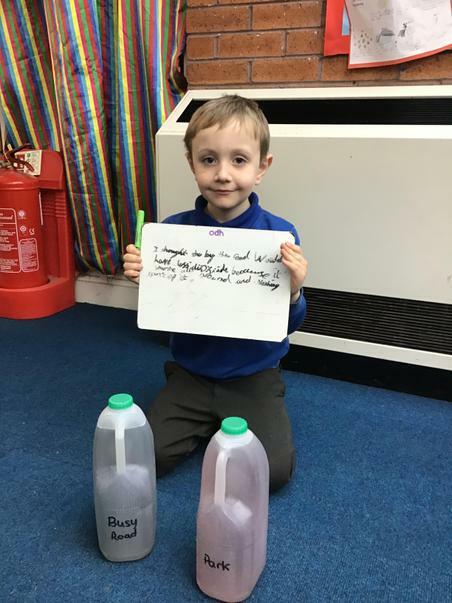 Spellings will be continue to be tested on a Tuesday and new spellings will be given out weekly. 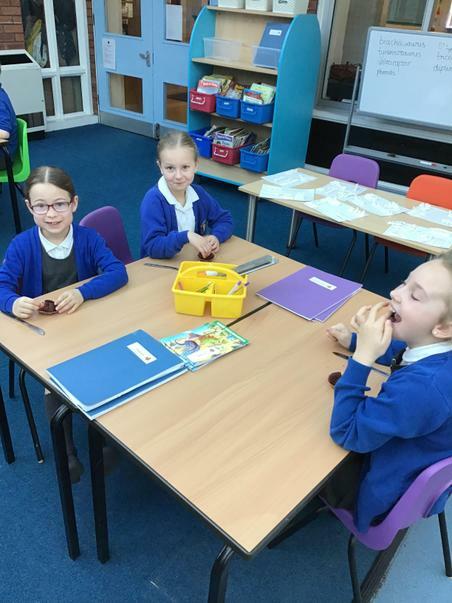 We will be checking reading records at the beginning of each week for Rainbow Readers so please continue to read every day with your child. 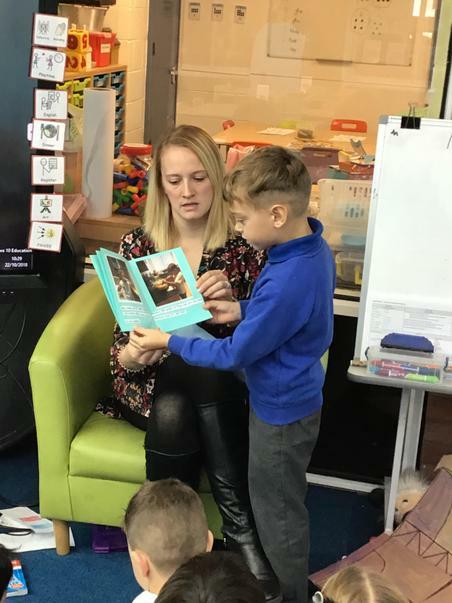 Children will be given the opportunity to change their books regularly in school, however children can also ask at any point to change their books. 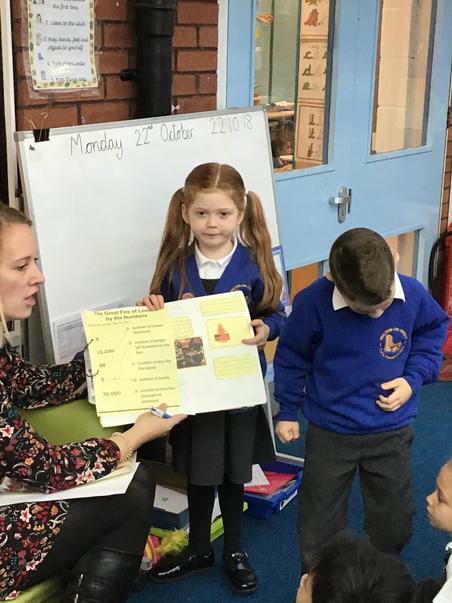 There is a Parent and Carer's information sheet attached below with information about our new topic. 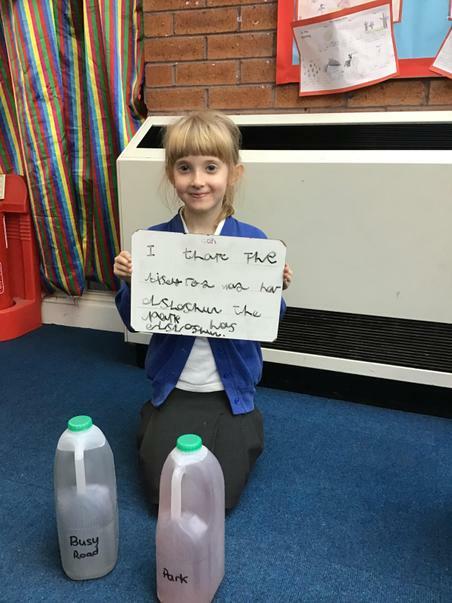 Home learning ideas are also attached below. 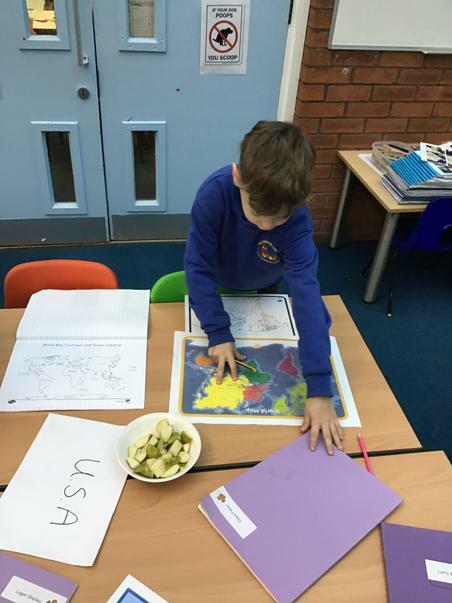 Please complete the highlighted homework learning idea and then choose a further 3 ideas to complete. 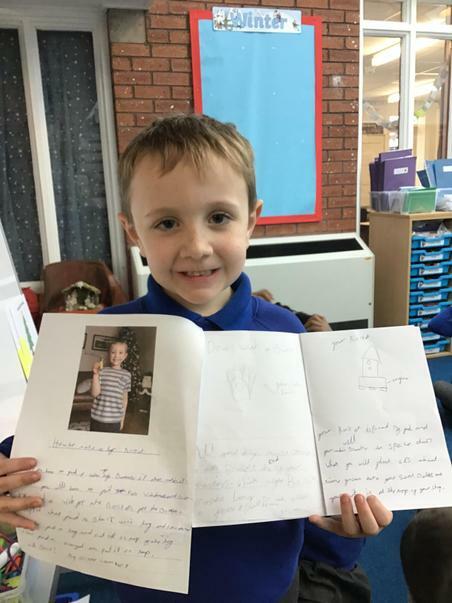 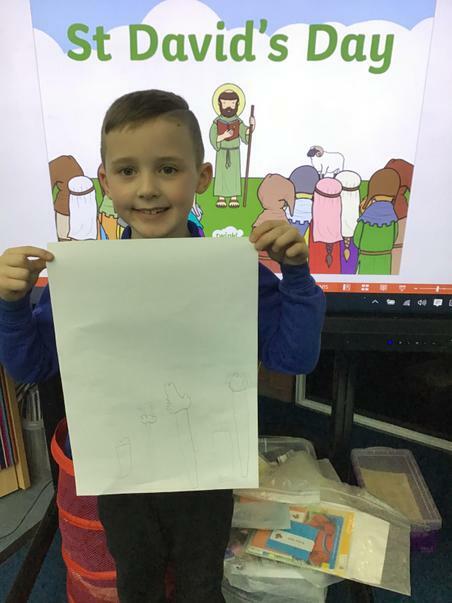 Completed homework is to be returned to school by Monday 11th February so we can share it as a class. 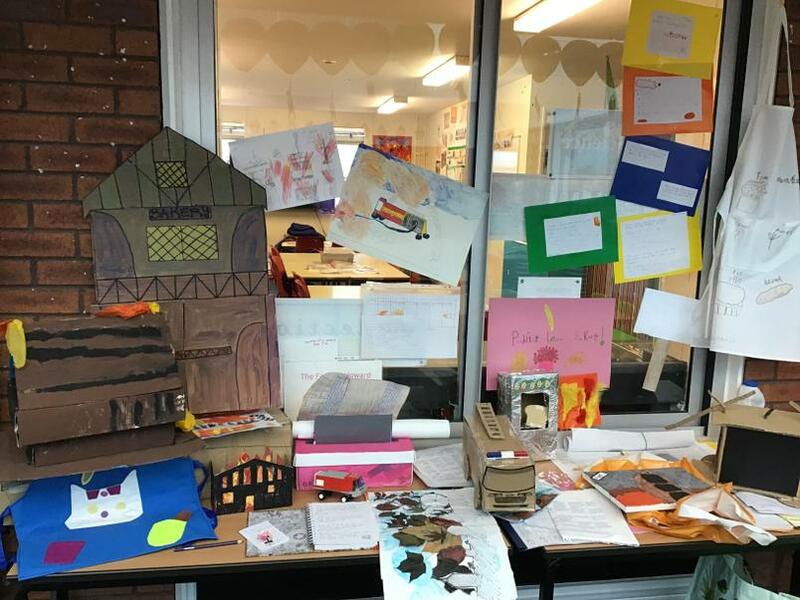 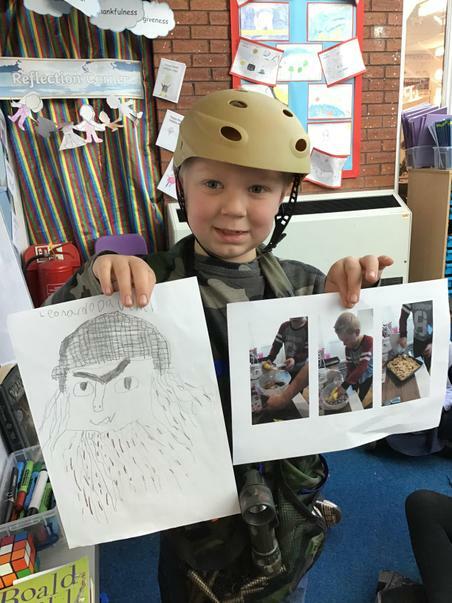 It was great to see all your homework projects and to hear about your trips to London. 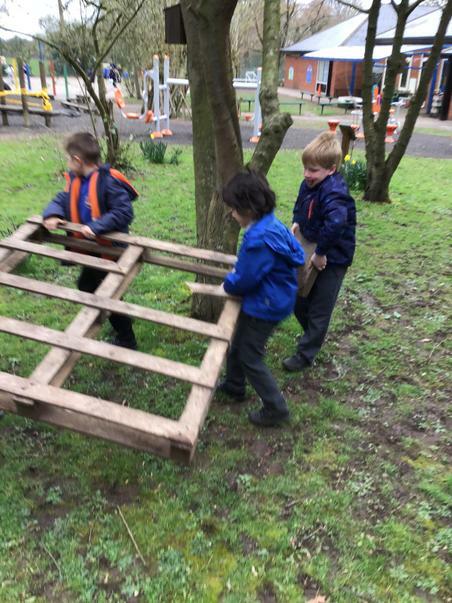 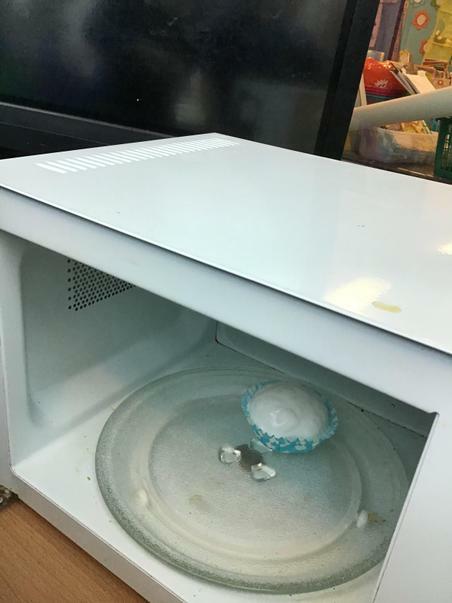 We were very impressed with the quality of the work. 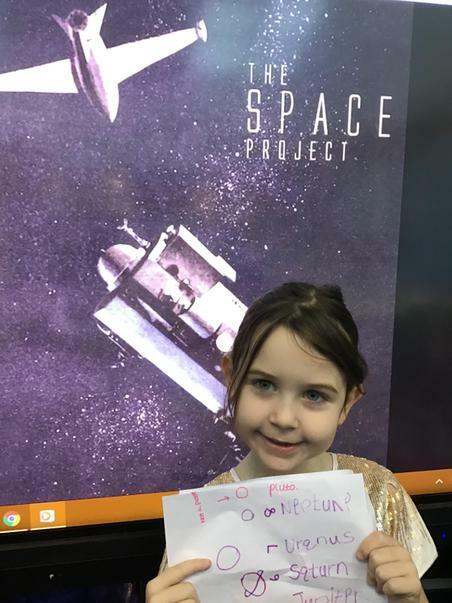 This term the topic is Outer Space, below is the homework tasks for this term. 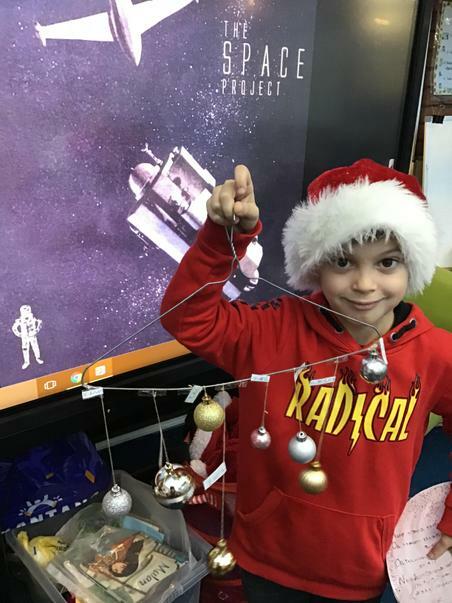 All homework is due on Monday 17th December. 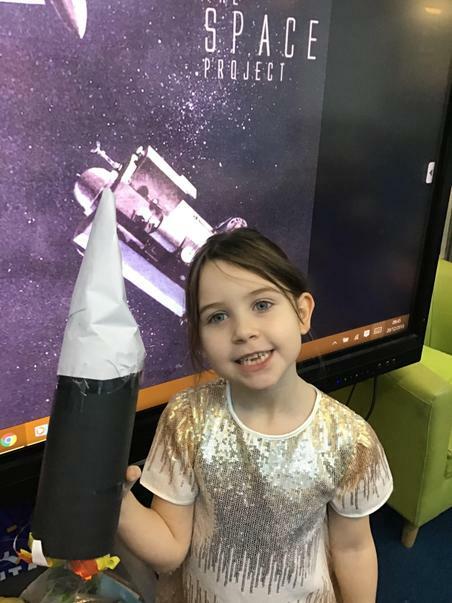 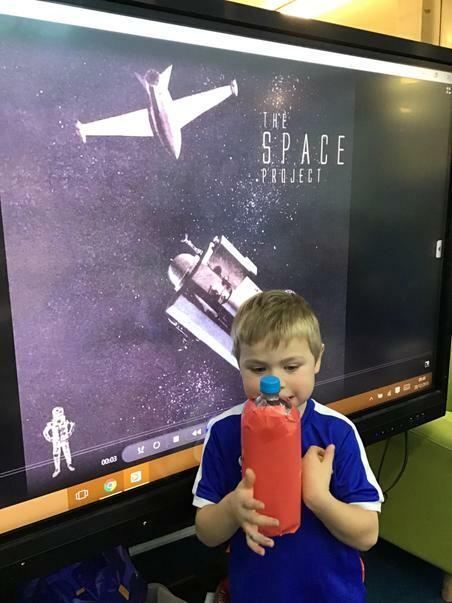 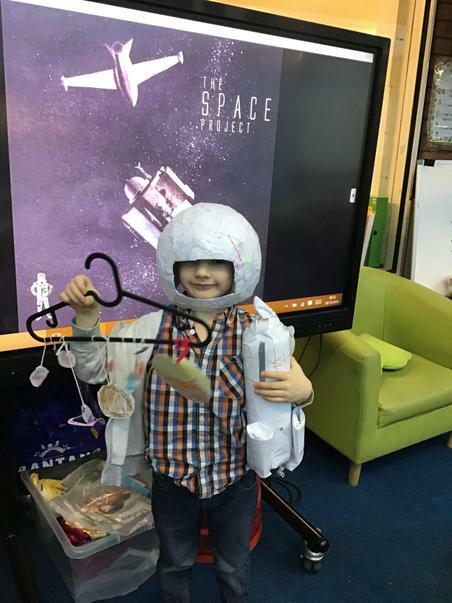 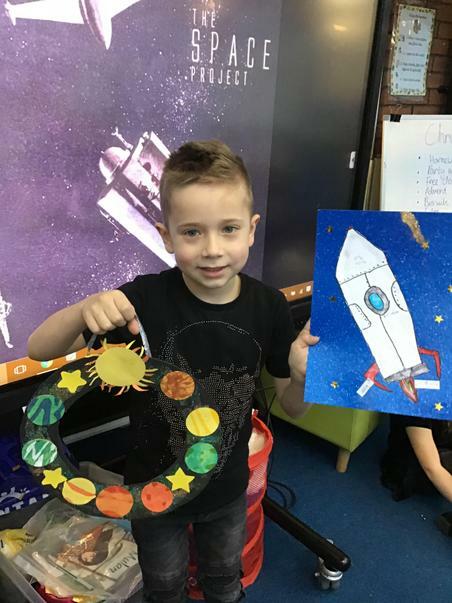 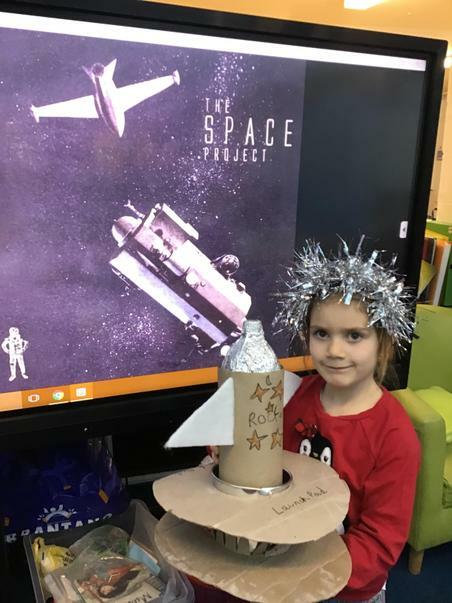 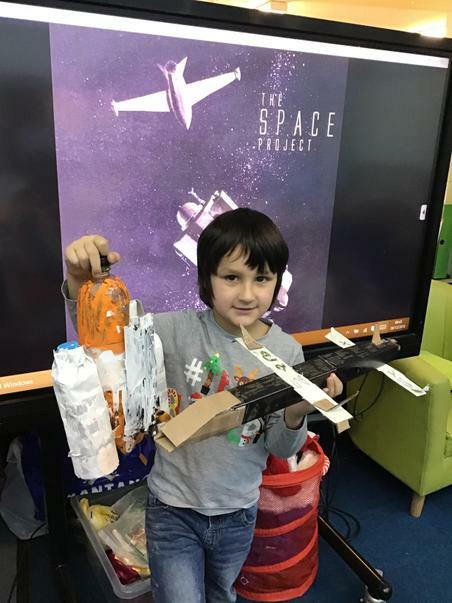 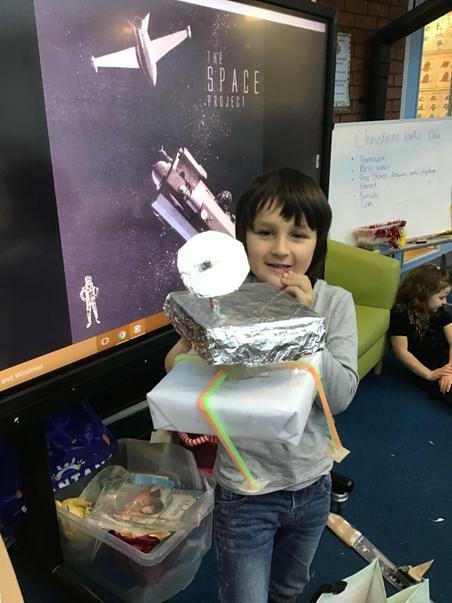 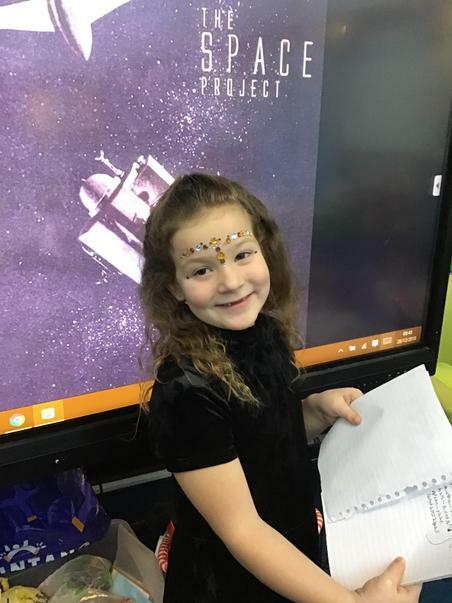 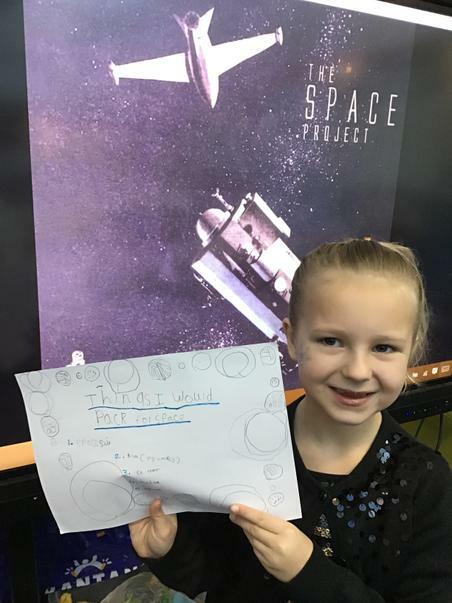 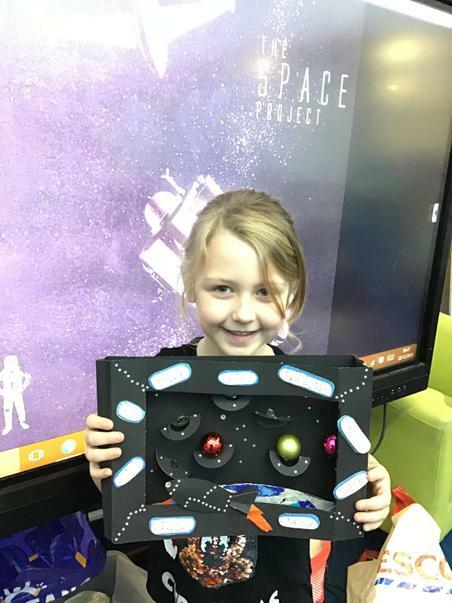 We can't wait to see your work, I bet it will be out-of-this-world and we will be over-the-moon! 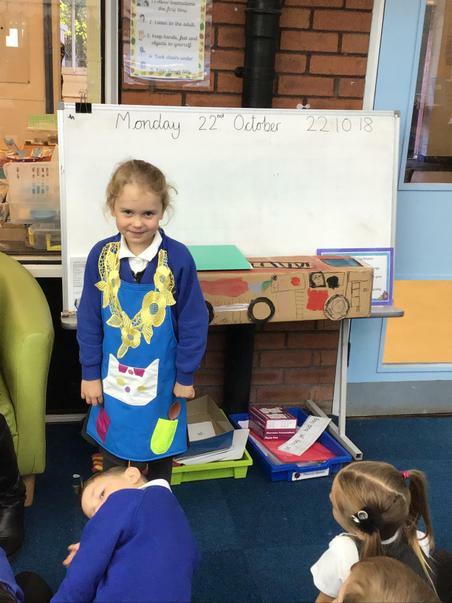 Please note that it is Forest Friday this term, so children will need suitable clothing and footwear in a named bag. 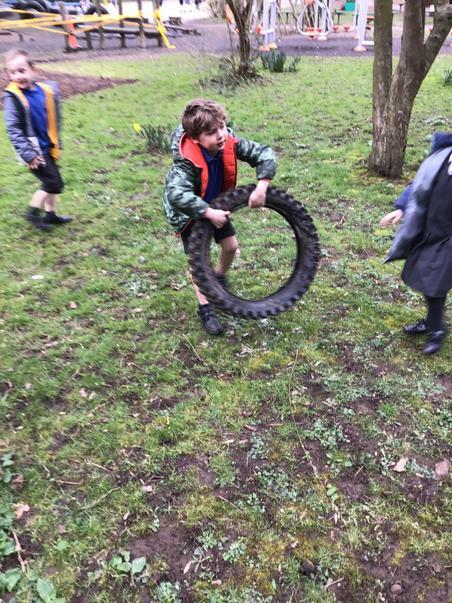 PE is on Tuesday and Wednesday please ensure children have clothes for inside and outside sessions. 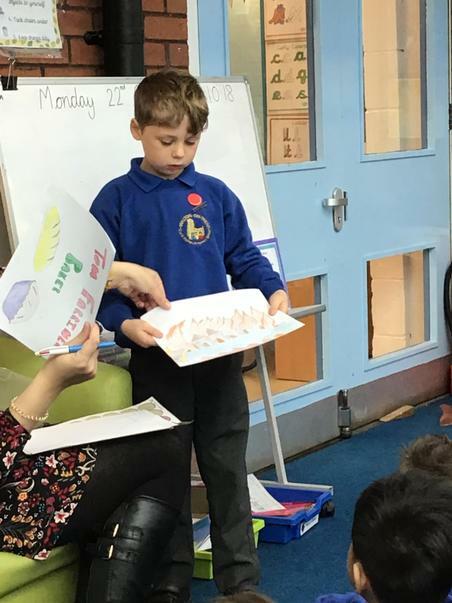 Reading books are changed several times during the week but children can ask to change their books when needed. 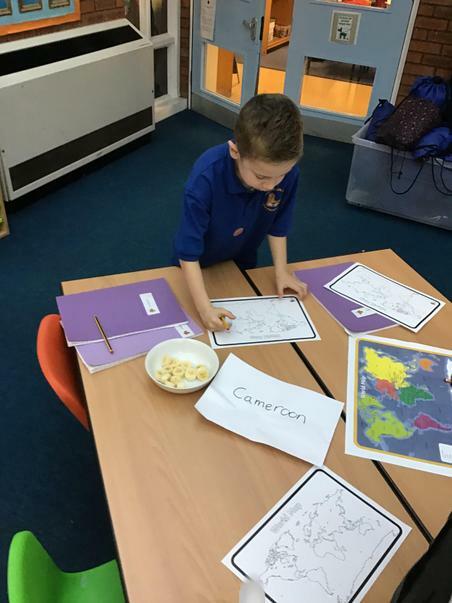 This term we will be learning about London. 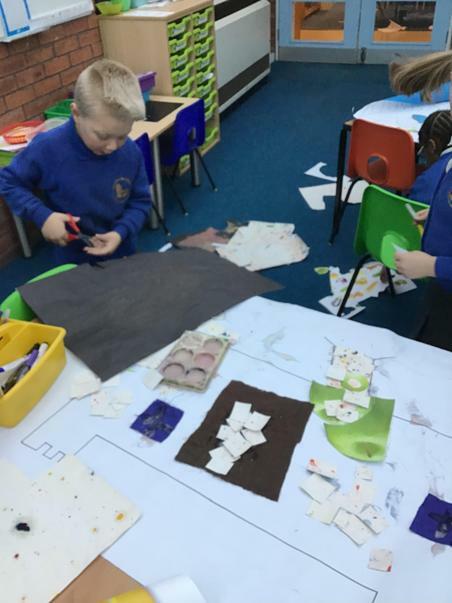 We will find out and the geography of the capital city and the events that led to the Great fire in 1666. 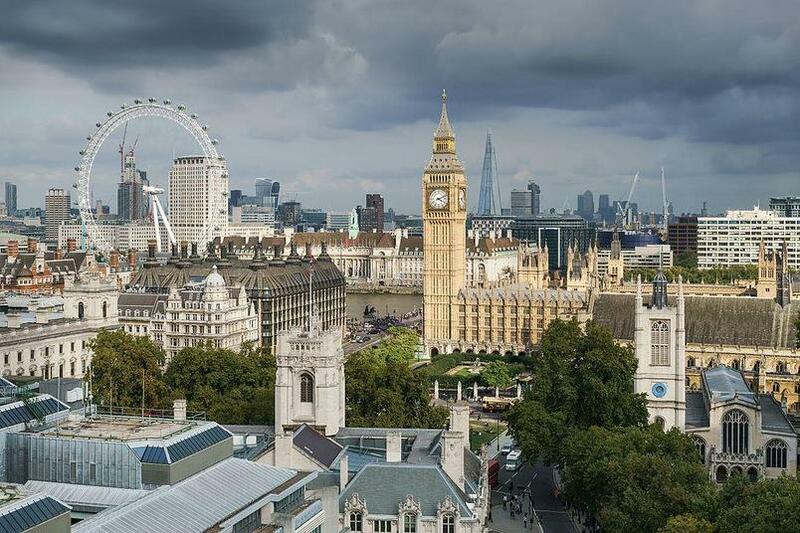 Have you ever been to London? 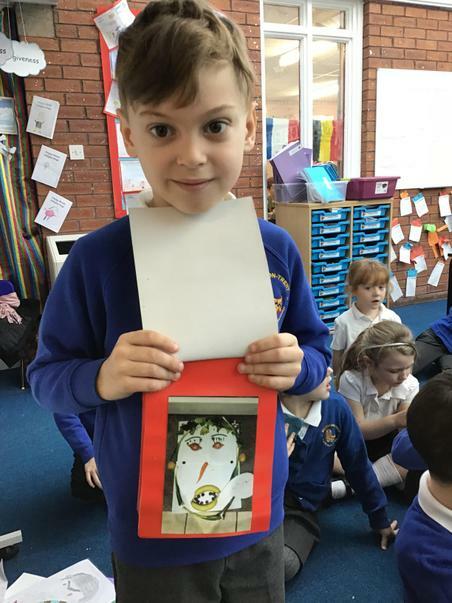 Bring in any photos or items from your visit.